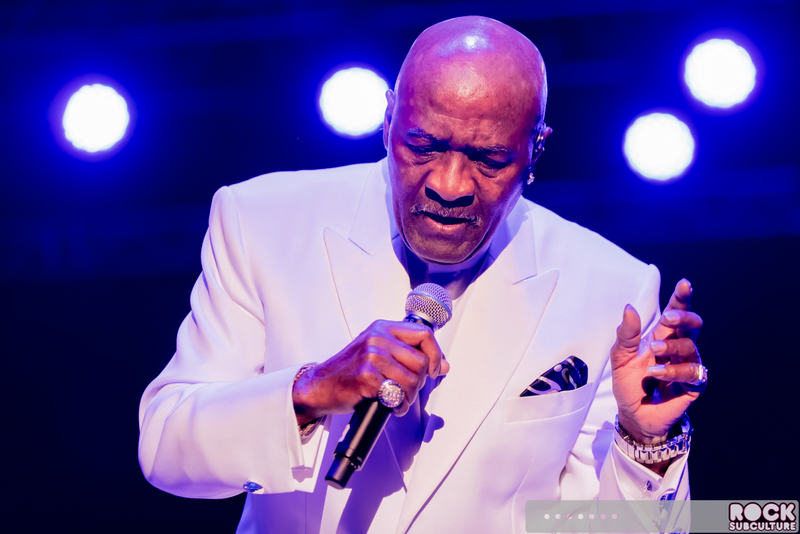 “We want to let you know that we really appreciate you… You have supported us – you have shown lots of love and dedication – for the last 58 years… That’s real special. 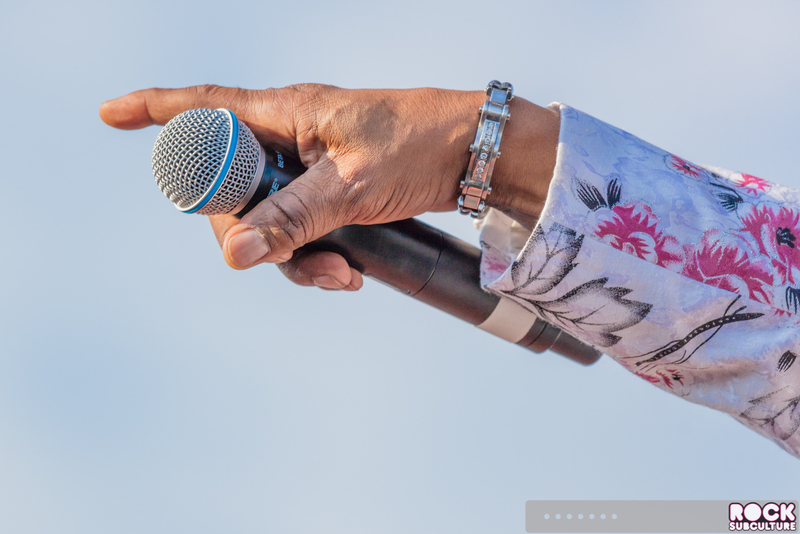 And now it has come time, to show our appreciation. 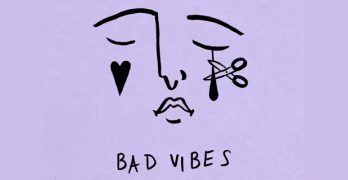 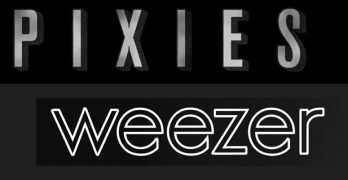 We’ve talked about it, and we agree that this song is the song that says the way we feel. 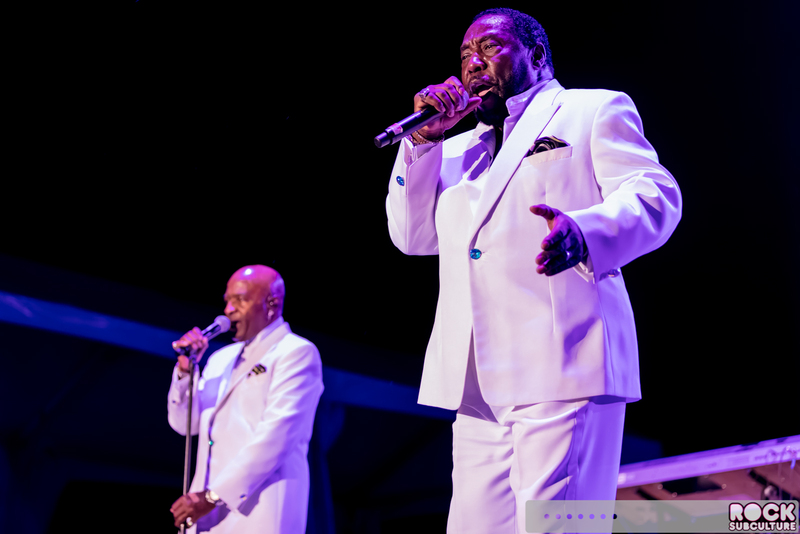 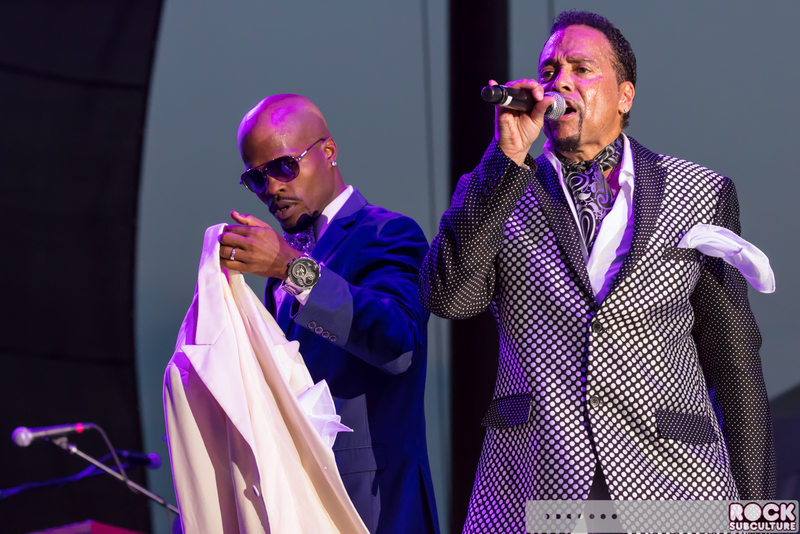 So you sit back and we’re going to tell you a little story, so it’s something like this…” The original remaining two principal members of The O’Jays at a sold out show at Thunder Valley Outdoor Amphitheater on Saturday night before singing an incredible rendition of their song “Forever Mine”. 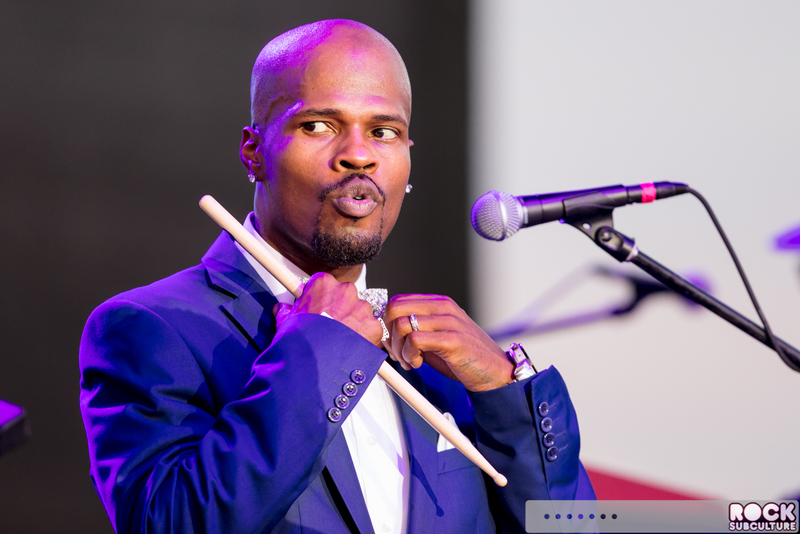 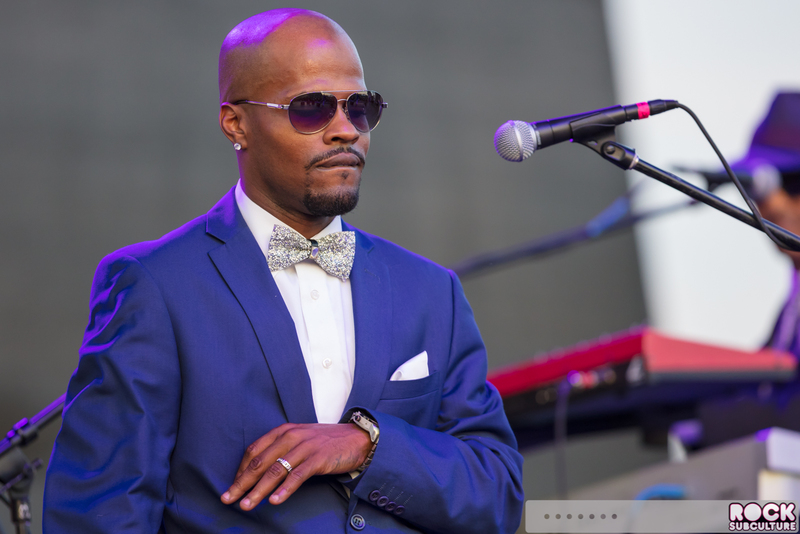 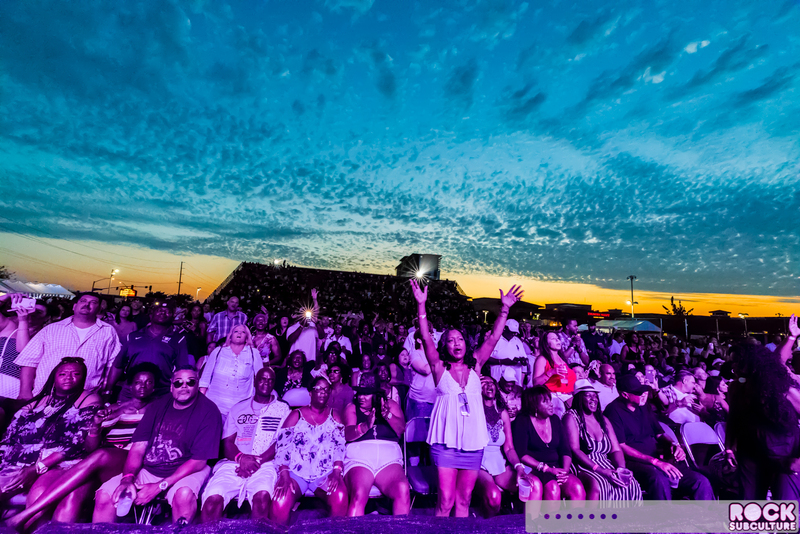 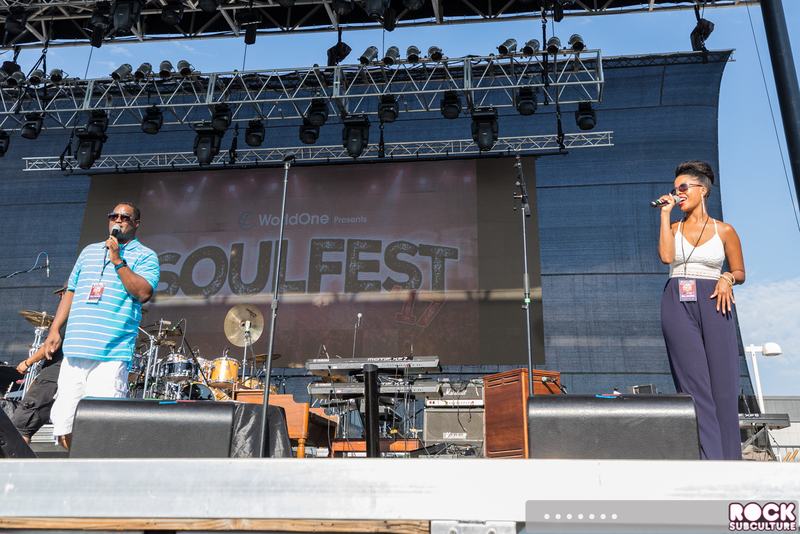 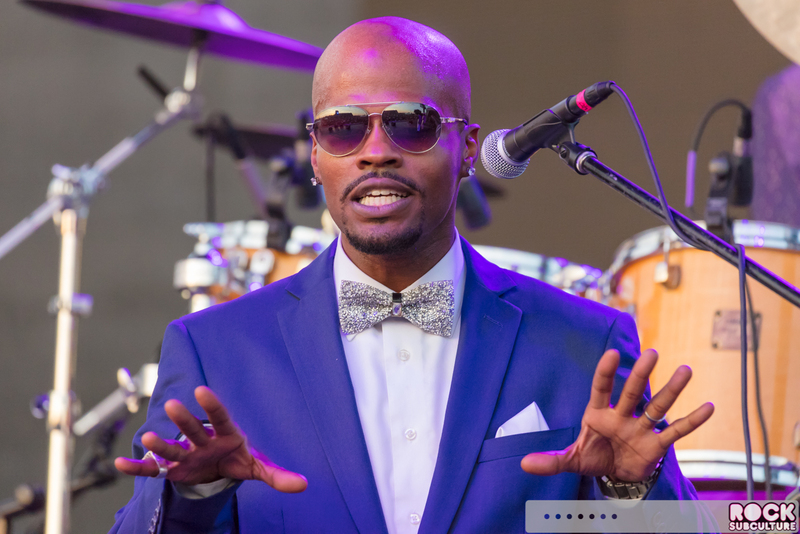 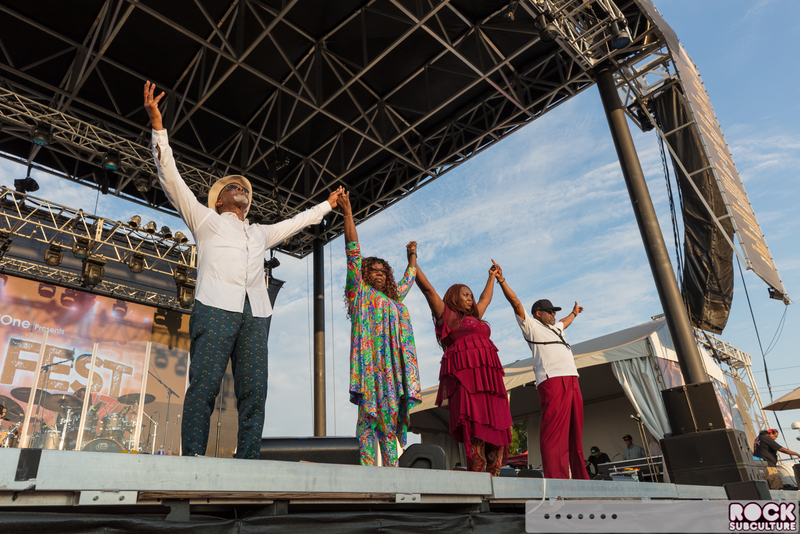 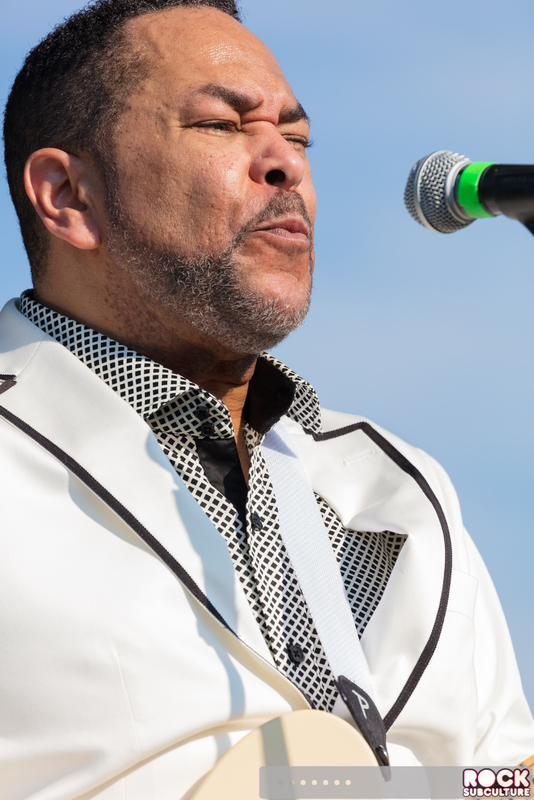 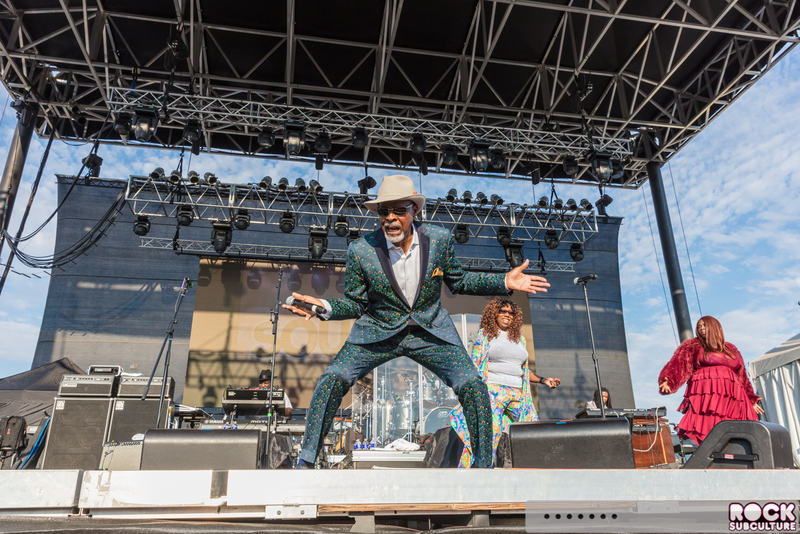 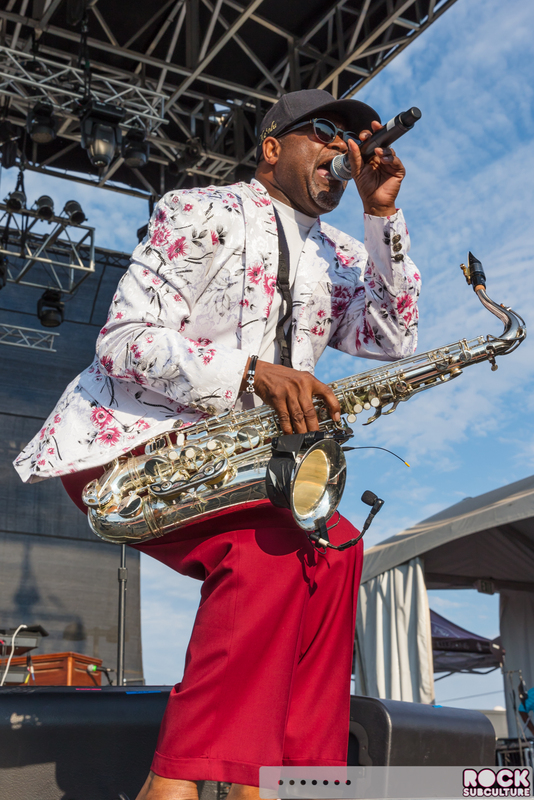 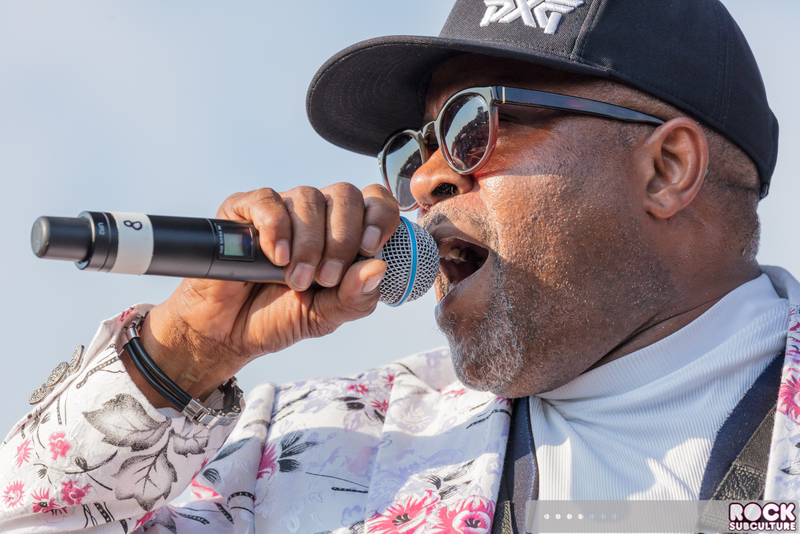 Off of their 1979 album, Identify Yourself, the pioneering R&B group had the crowd on their feet throughout much of their headlining performance at World One Presents’ “Soul Fest ’17” concert, which also featured sets by Morris Day and The Time, The S.O.S. 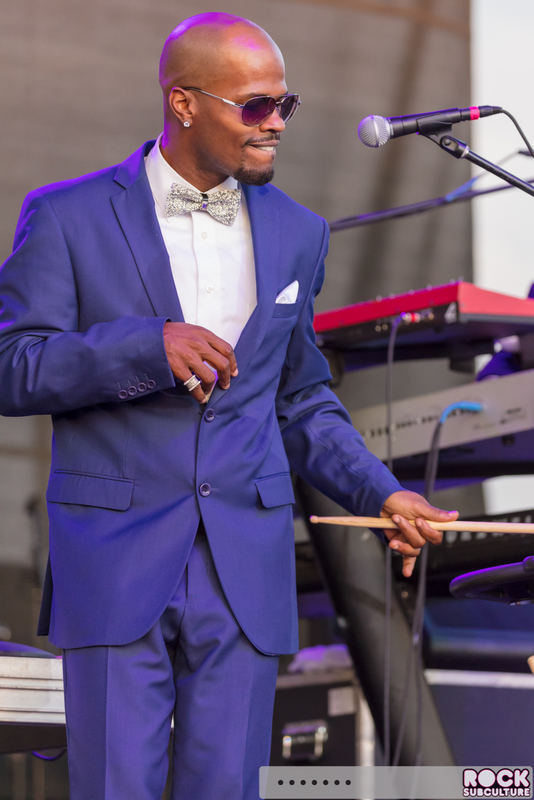 Band, and GQ. 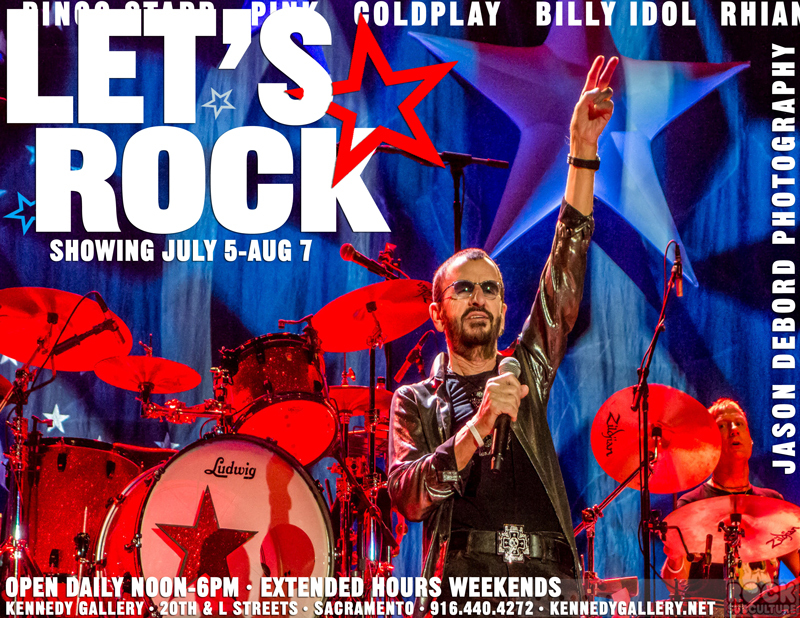 This was a World One Presents promotion and show at Thunder Valley, and certainly a popular one as the place was sold out. 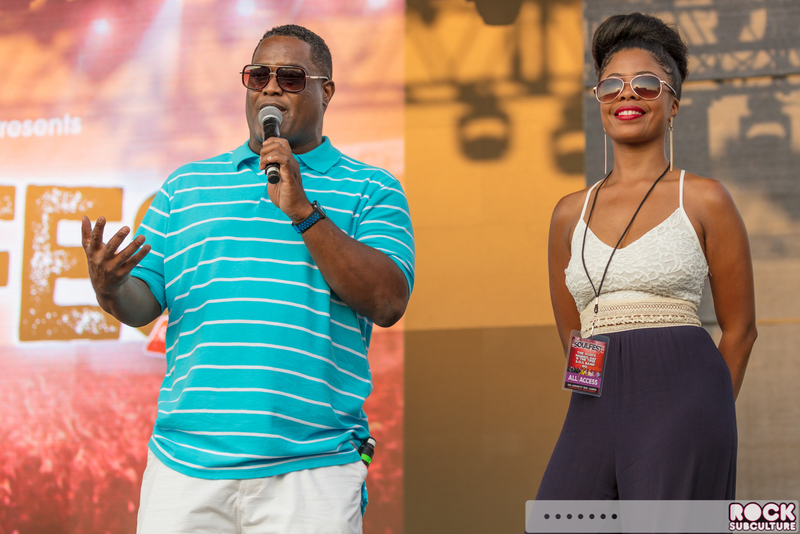 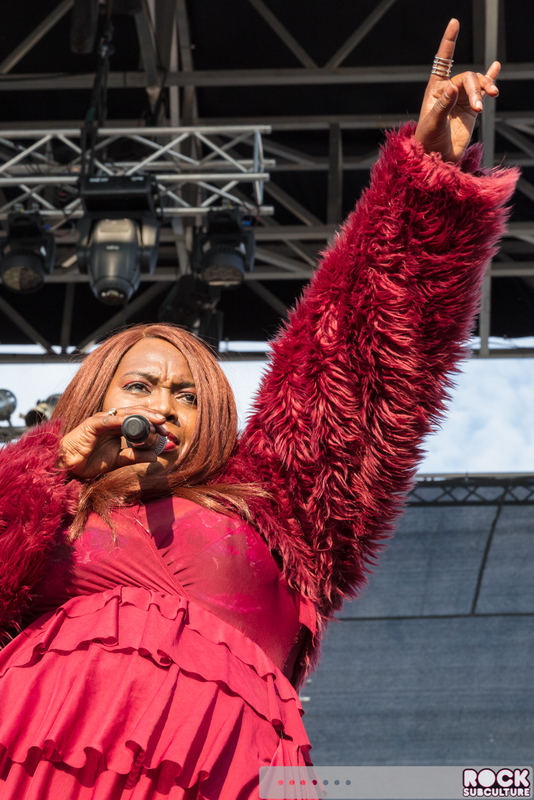 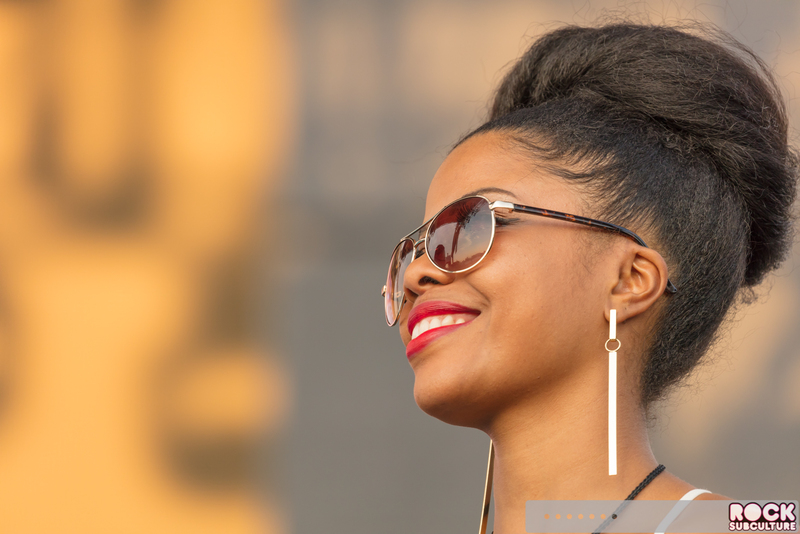 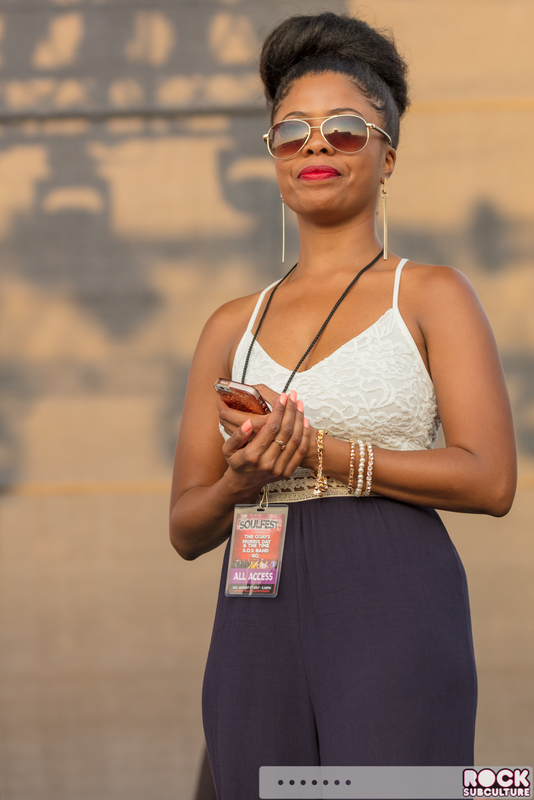 With hours of live music, the show was hosted by personalities from V101 Sacramento: Throwback Hip-Hop and R&B. 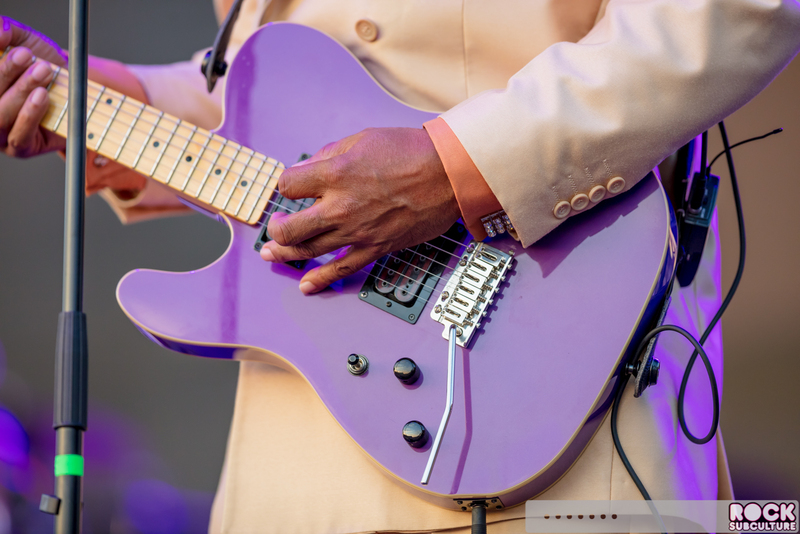 This was a solo set with Emmanuel Rahiem LeBlanc performing guitar and vocals over some pre-recorded beats. 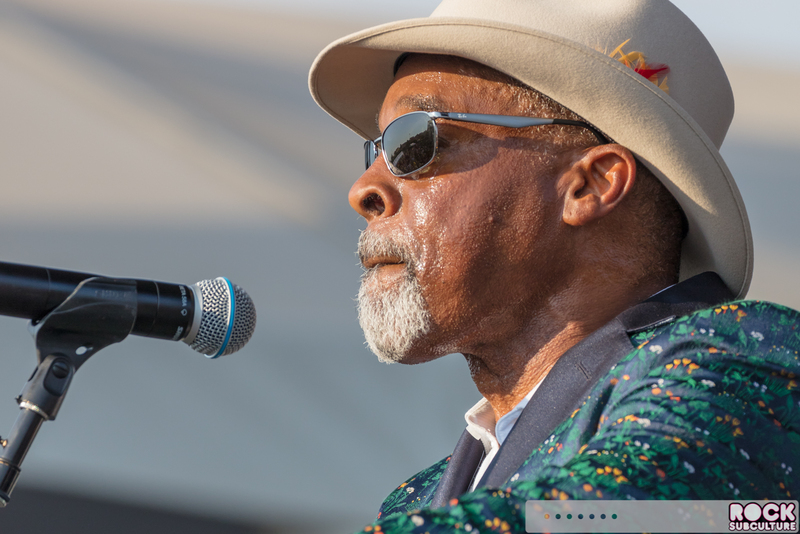 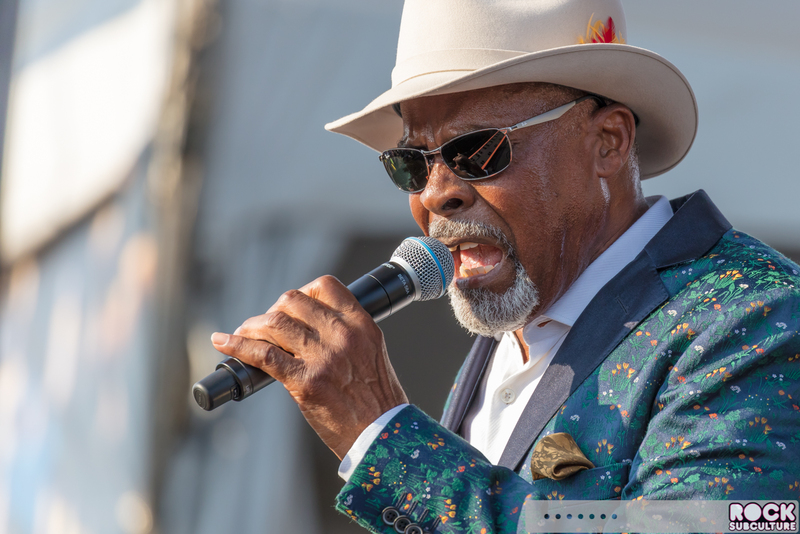 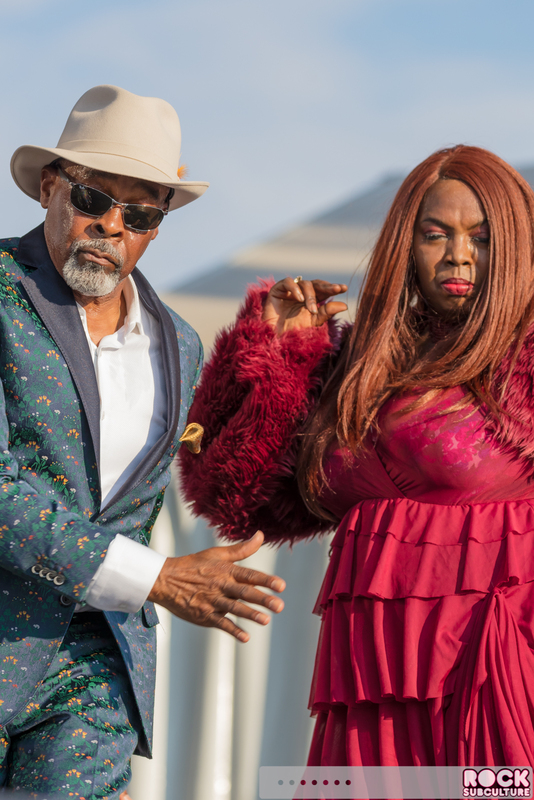 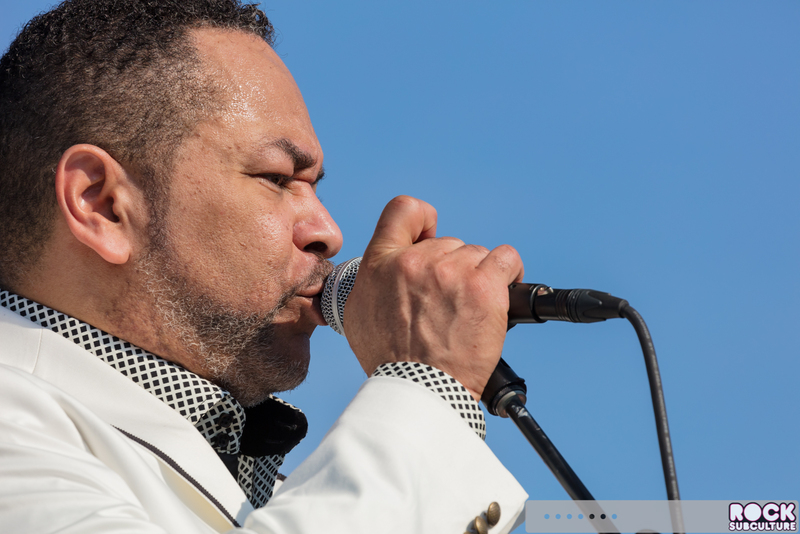 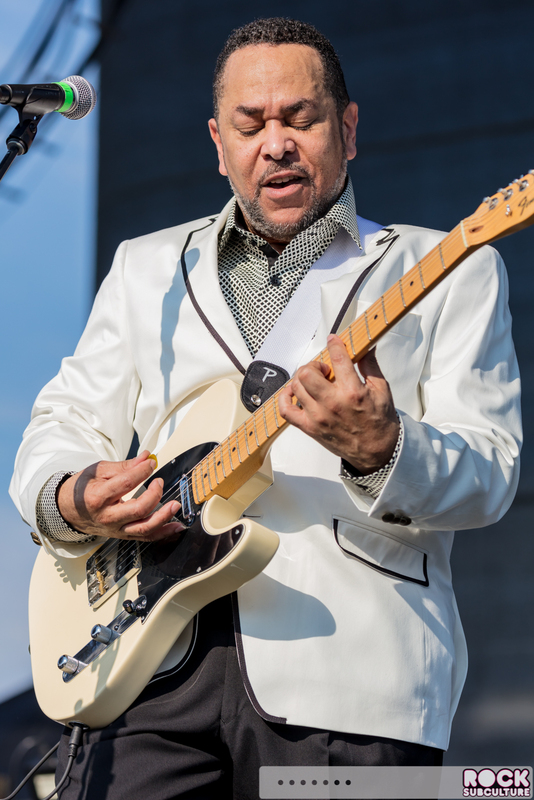 GQ was originally formed in 1968 as Sabu & the Survivors, which changed to The Rhythm Makers with Emmanuel Rahiem LeBlanc on lead vocals and guitar. 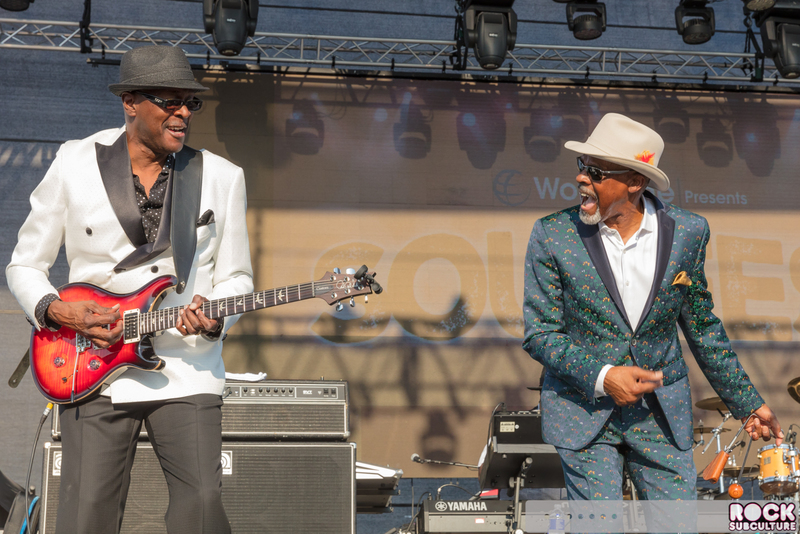 They released one album, Soul On Your Side, in 1976, which resulted in one hit, “Zone”. 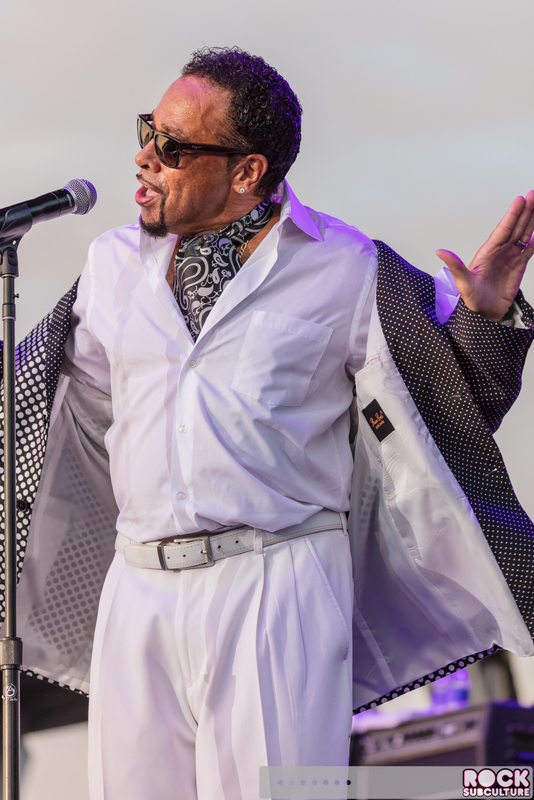 In 1978, they signed with Arista Records and changed their name to GQ (an acronym for “good quality”). 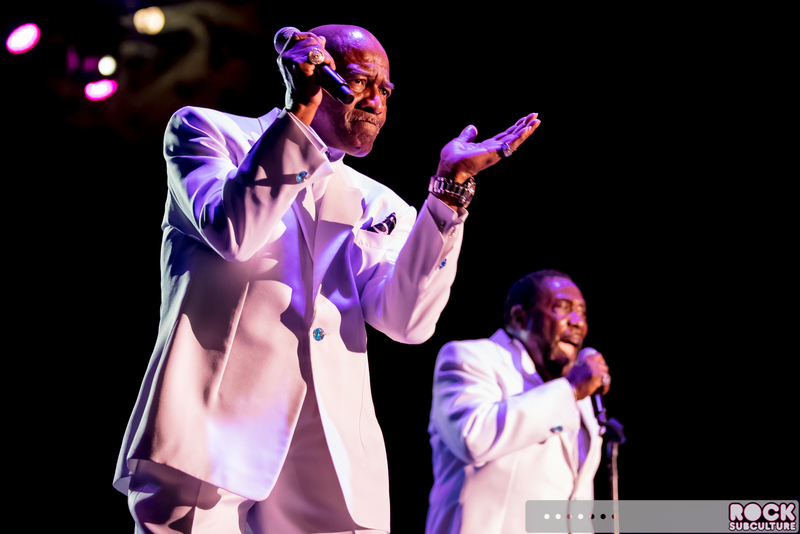 They had their biggest hit in 1979 with their first album as GQ, Disco Nights, with the single “Disco Nights (Rock-Freak)” which went to #1 on the R&B singles chart. 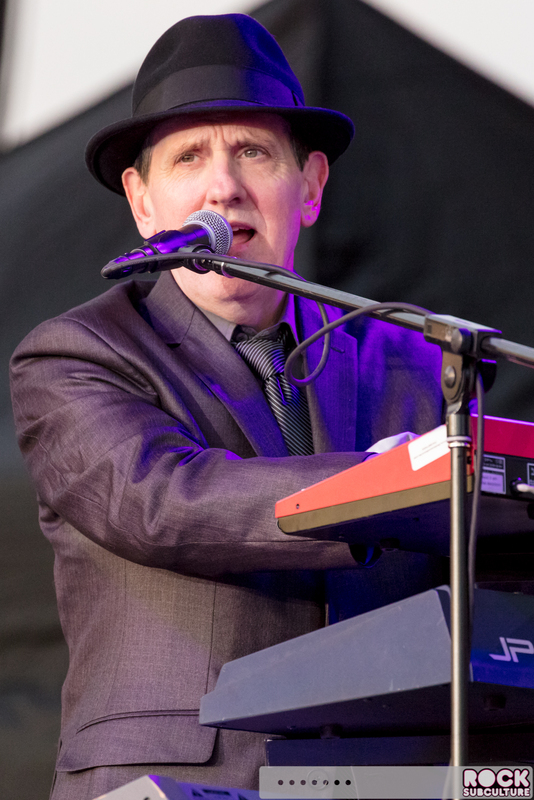 They also released albums in 1980 (Two) and 1981 (Face to Face). 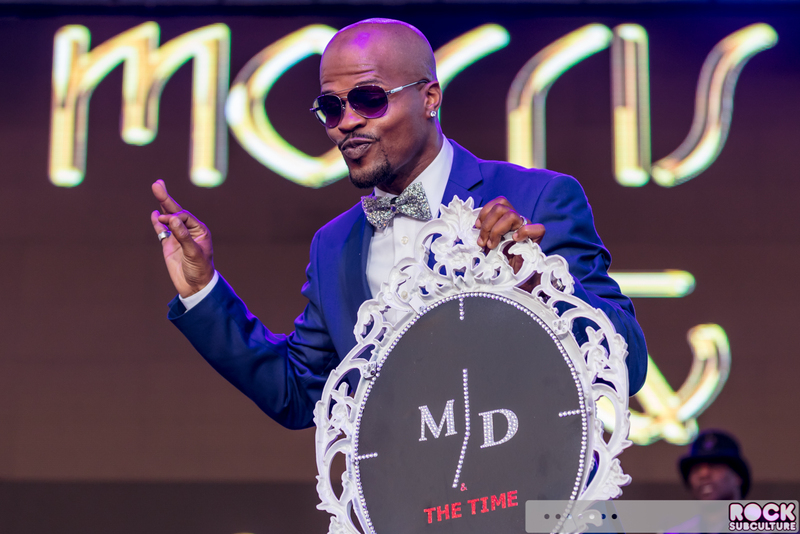 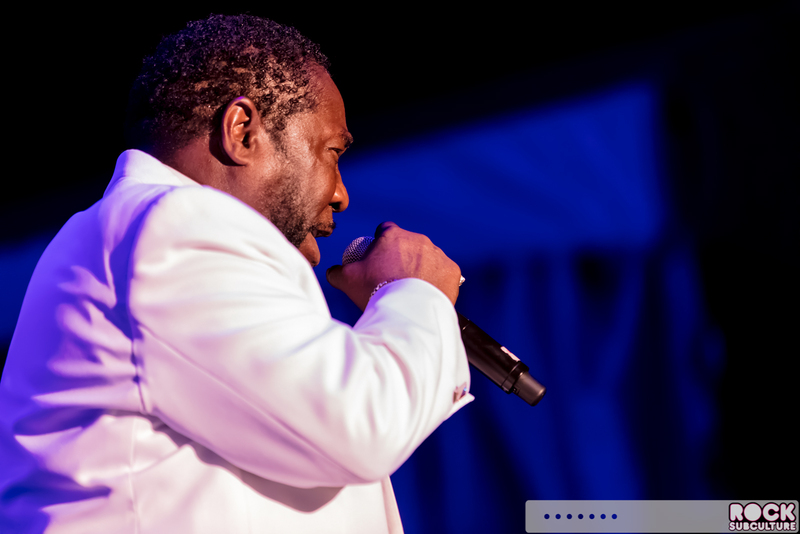 Emmanuel released a solo album, Always Be Around, in 1991 and also goes by the moniker “Mr. 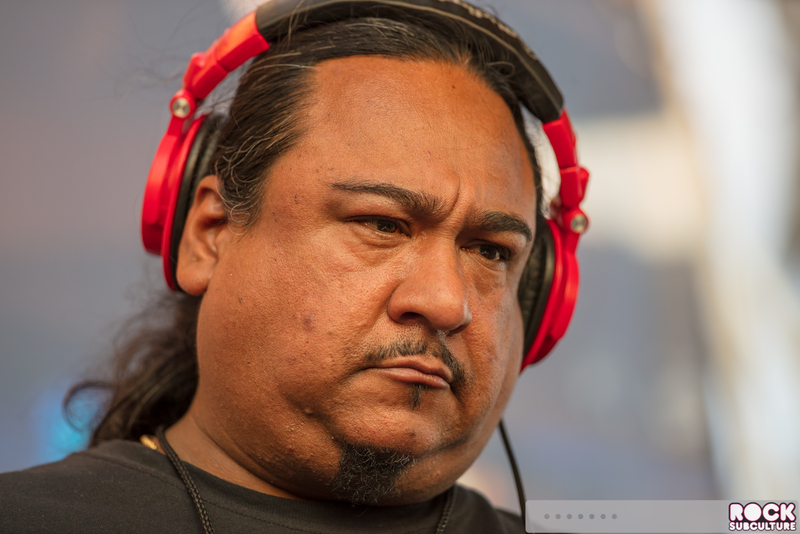 Q”. 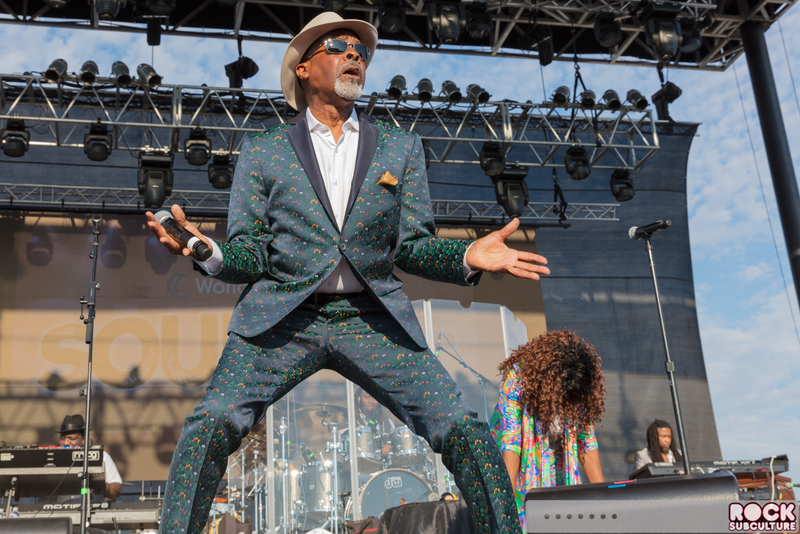 The song I most remember from GQ is “Boogie Oogie Oogie”, which was the B-side to the aforementioned “Disco Nights (Rock-Freak)”. 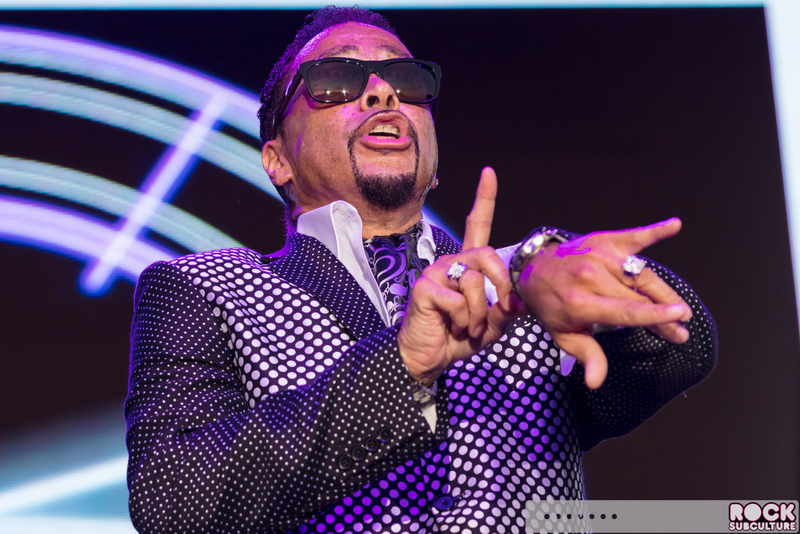 I love music of this disco era with the funky bright guitar riffs and catchy beats and vocals. 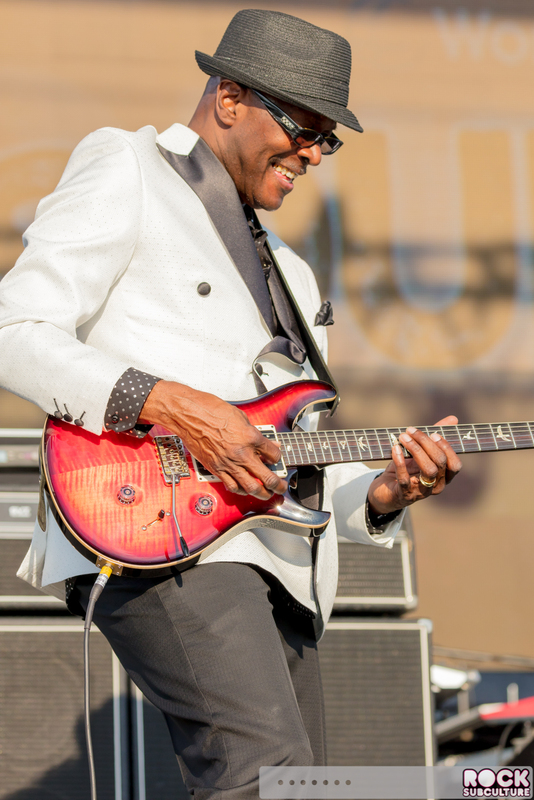 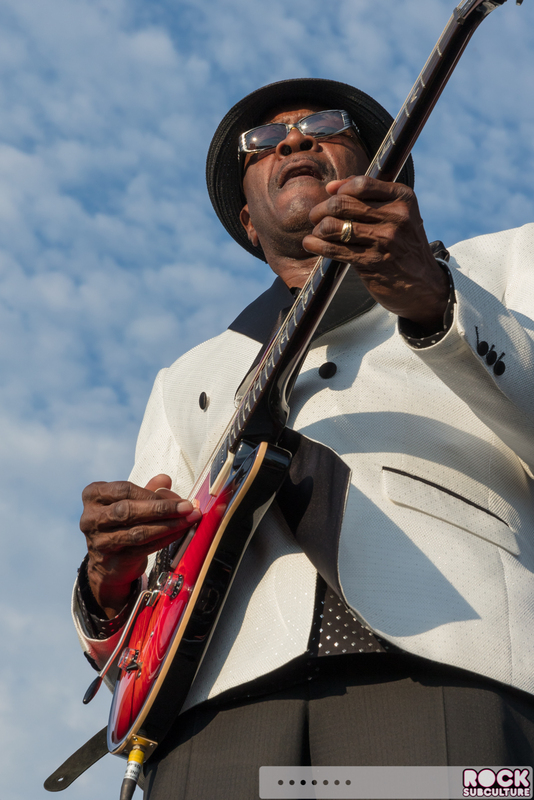 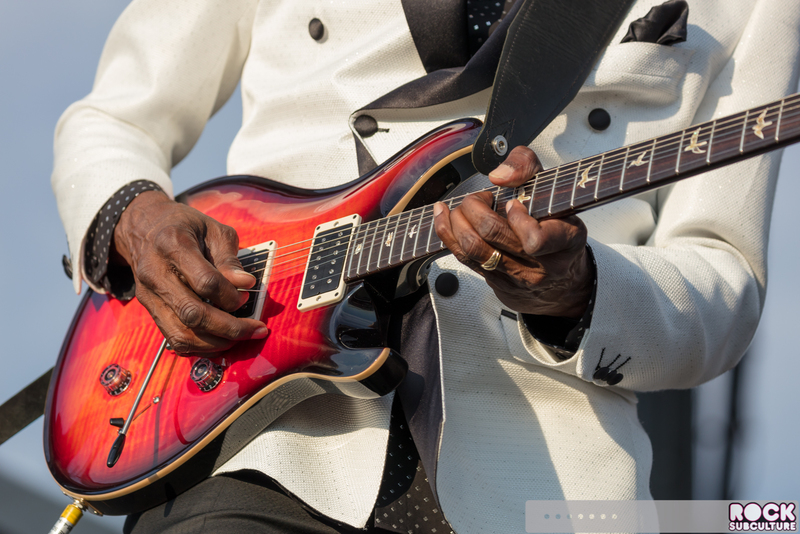 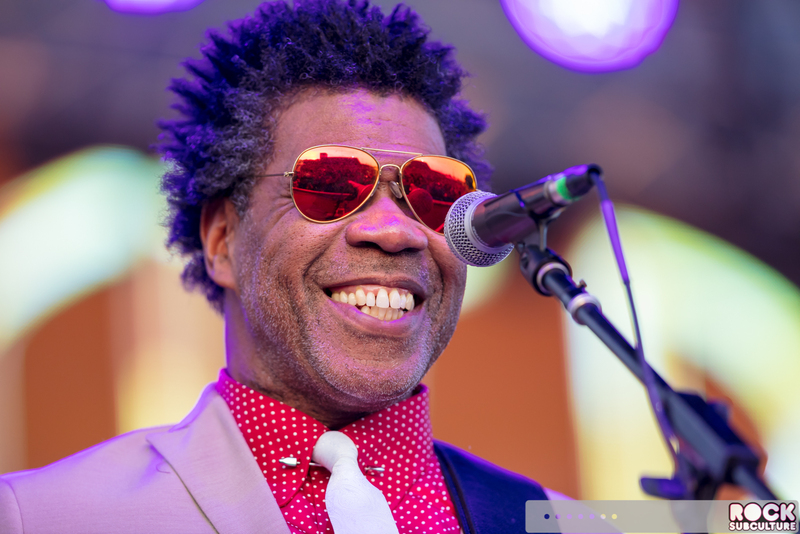 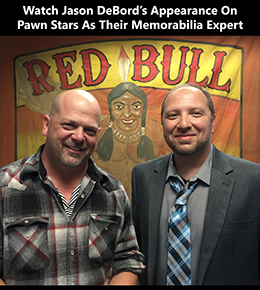 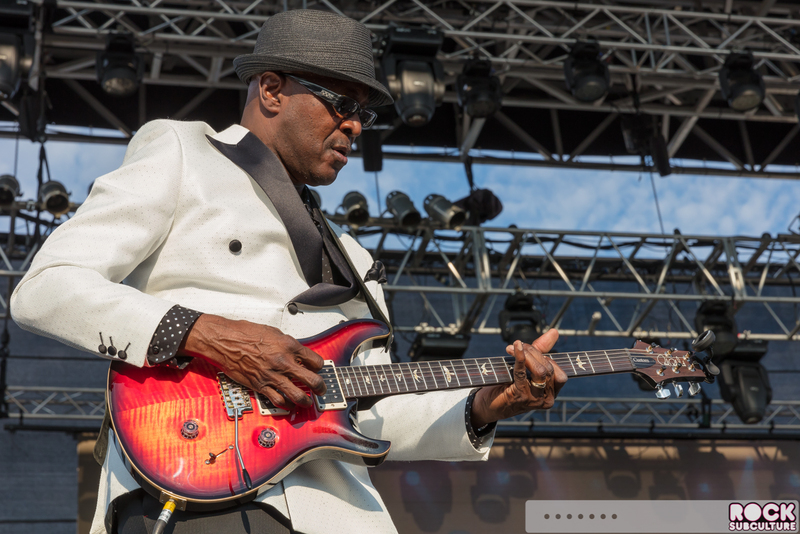 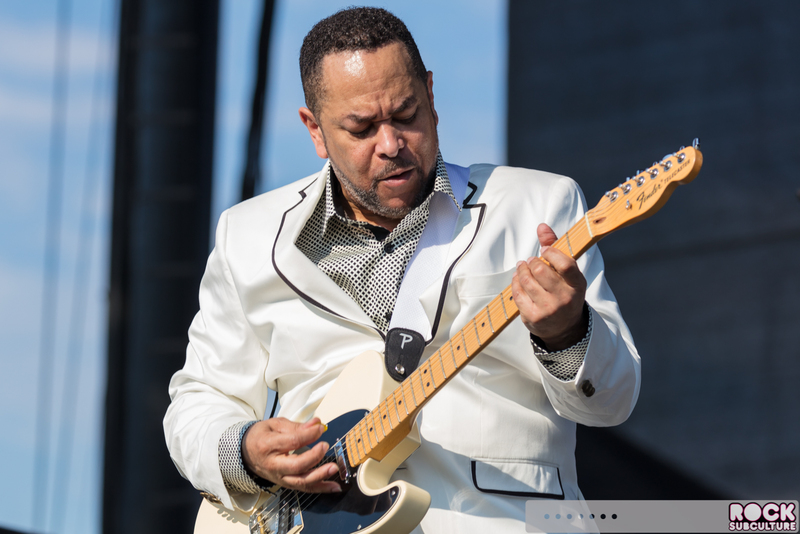 I was really impressed with LeBlanc’s performance – his work on guitar and vocals were top notch. 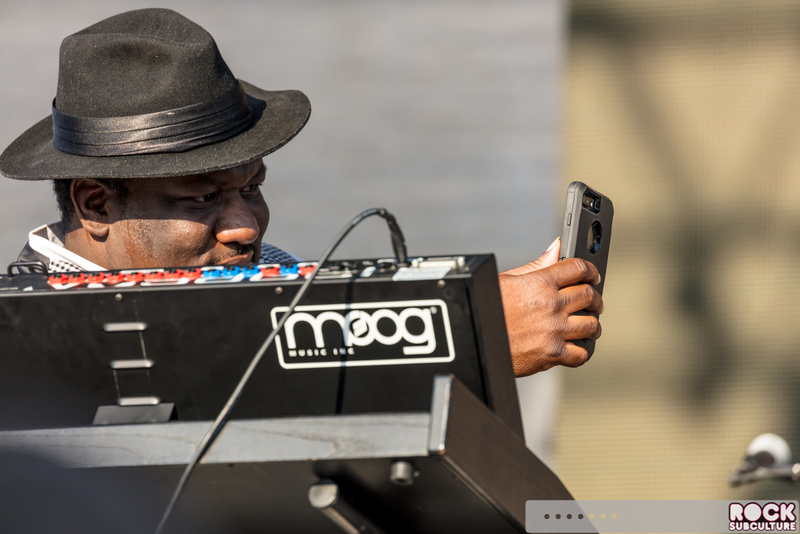 Would love to see him do an even longer set. 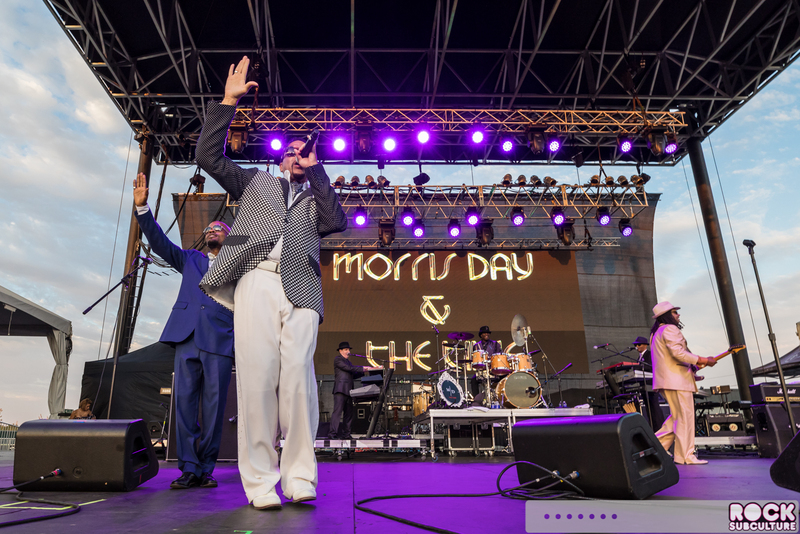 Originally formed as Santa Monica, The S.O.S. 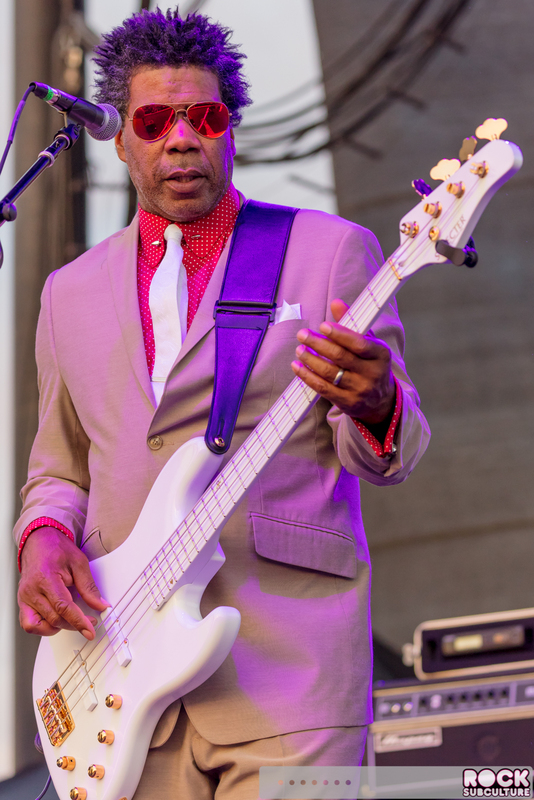 Band began in Atlanta, Georgia in 1977. 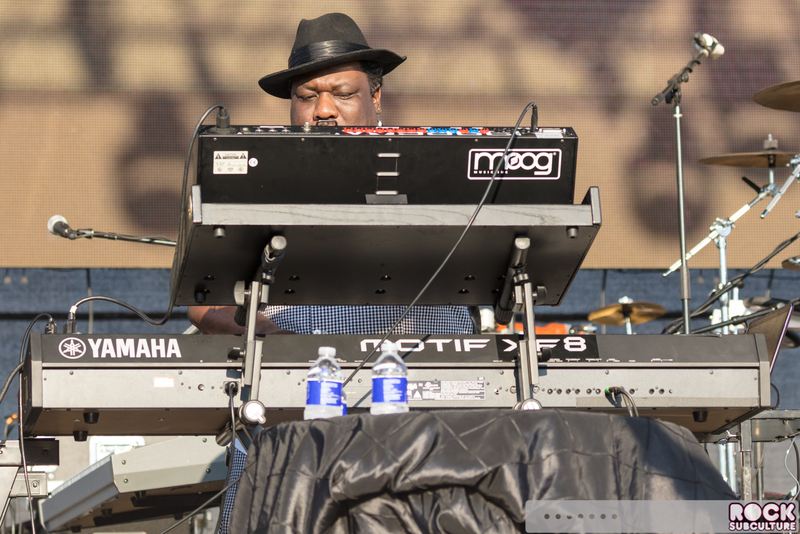 Mary Davis was the original lead vocalist and Jason Bryant was the original keyboardist. 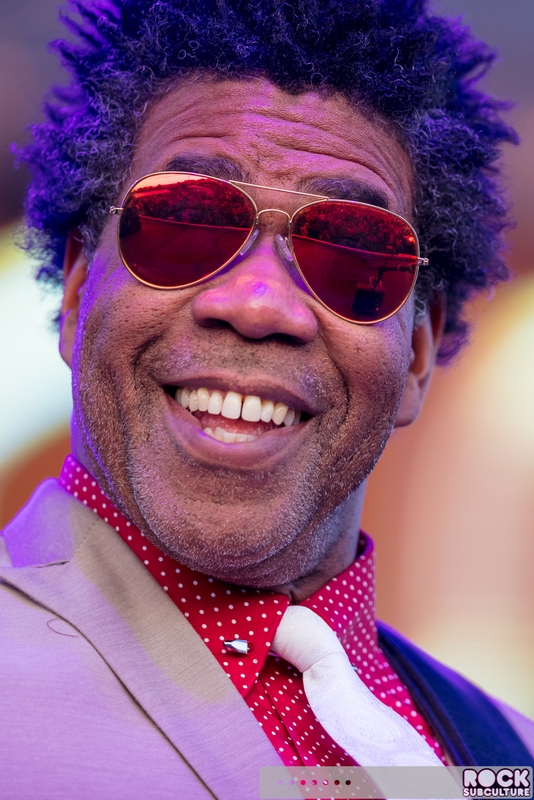 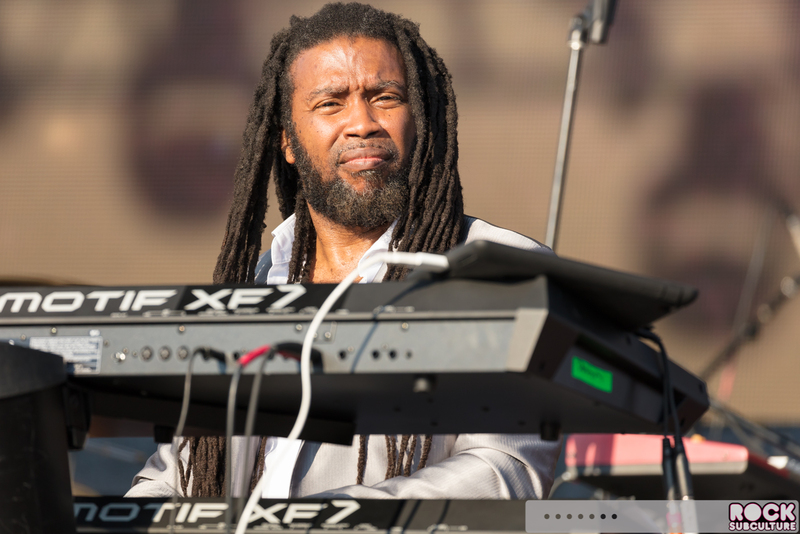 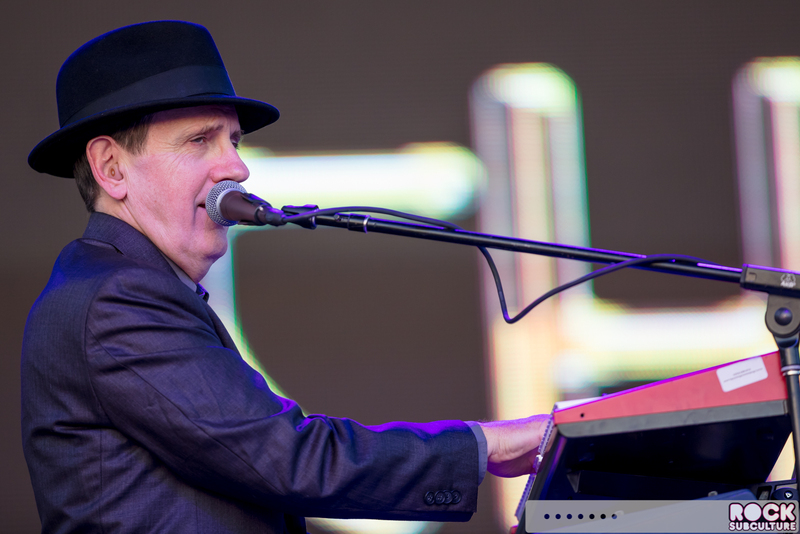 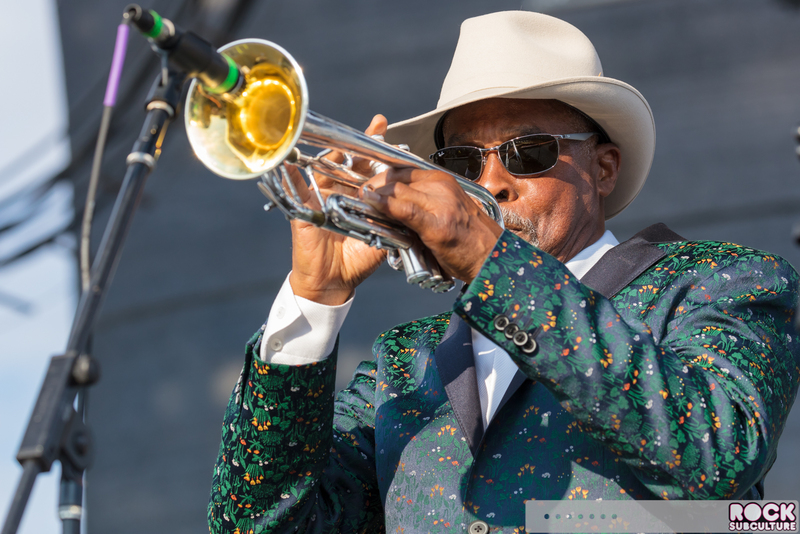 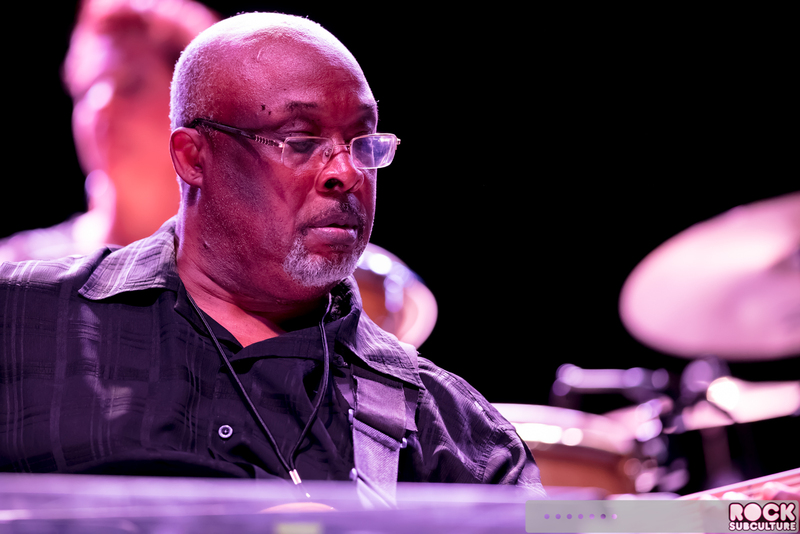 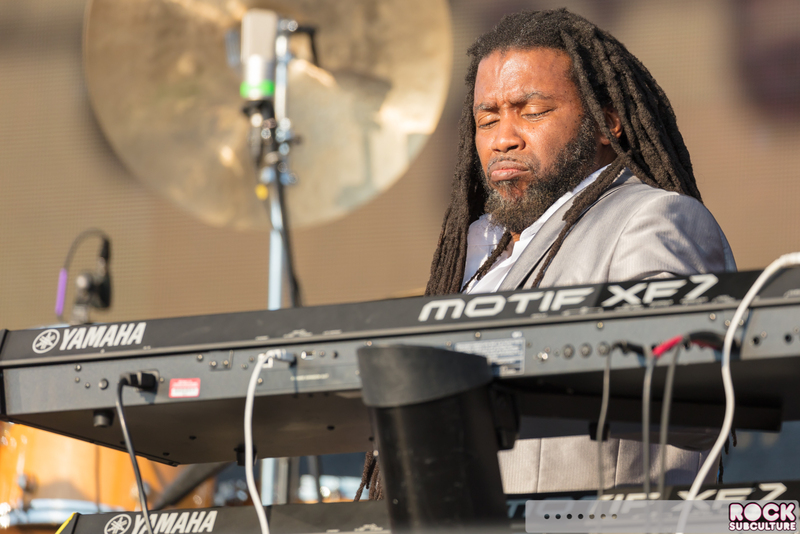 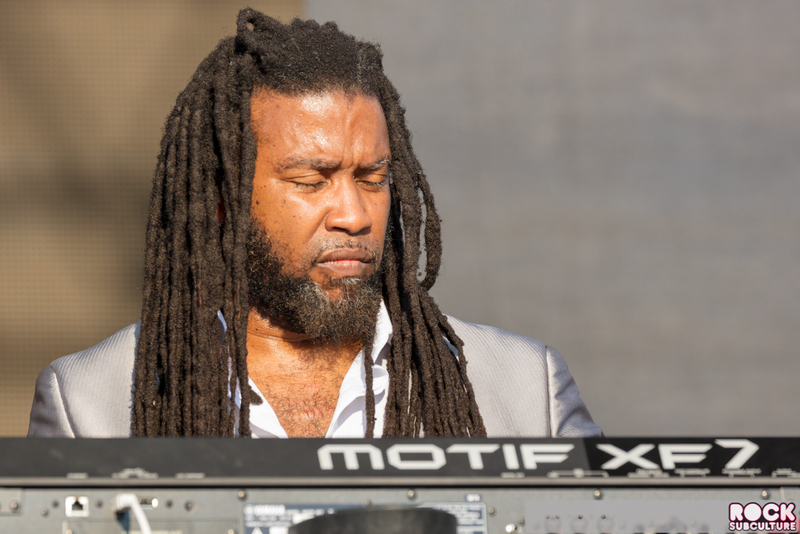 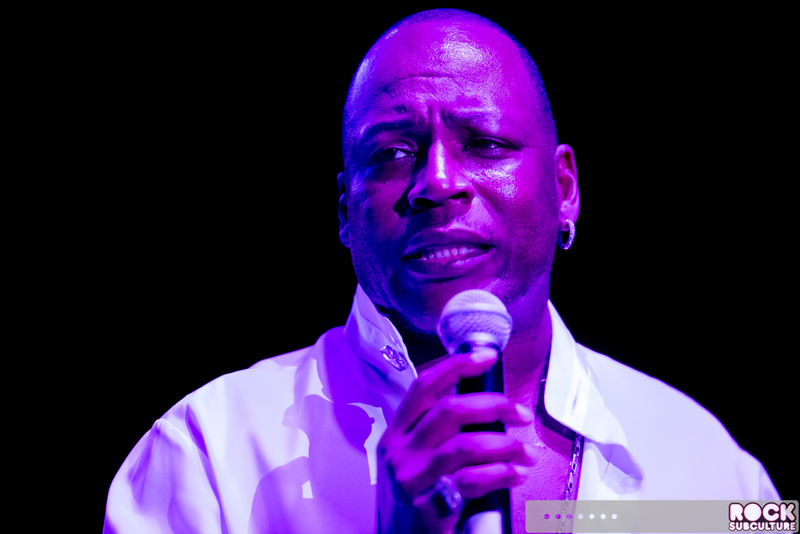 The band’s first big hit was “Take Your Time (Do It Right)” in 1980, and Abdul Ra’oof joined the group on their world tour on trumpet, vocals, and percussion. 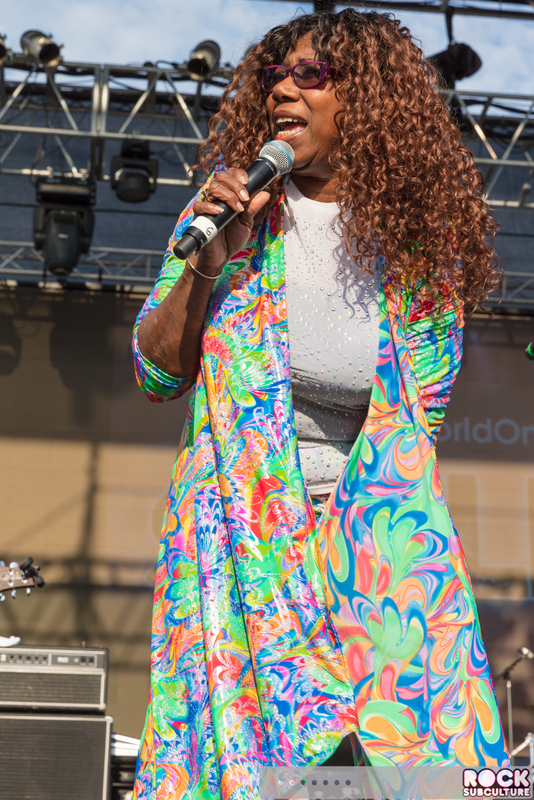 They had a number of hits in the 80s, and Mary Davis left the band in 1987 to pursue a solo career, and later returned in 1994. 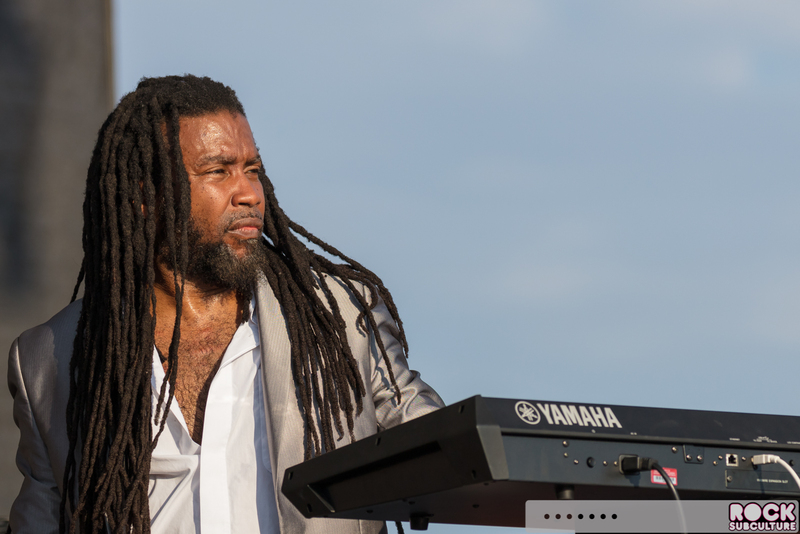 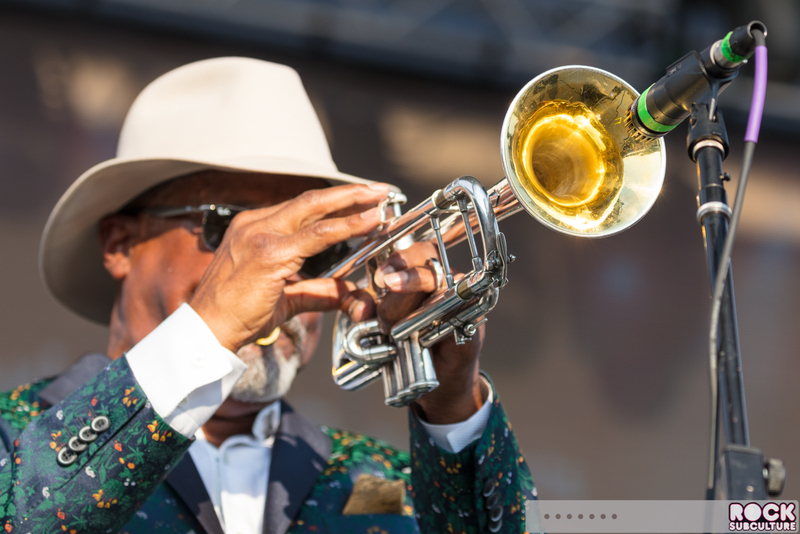 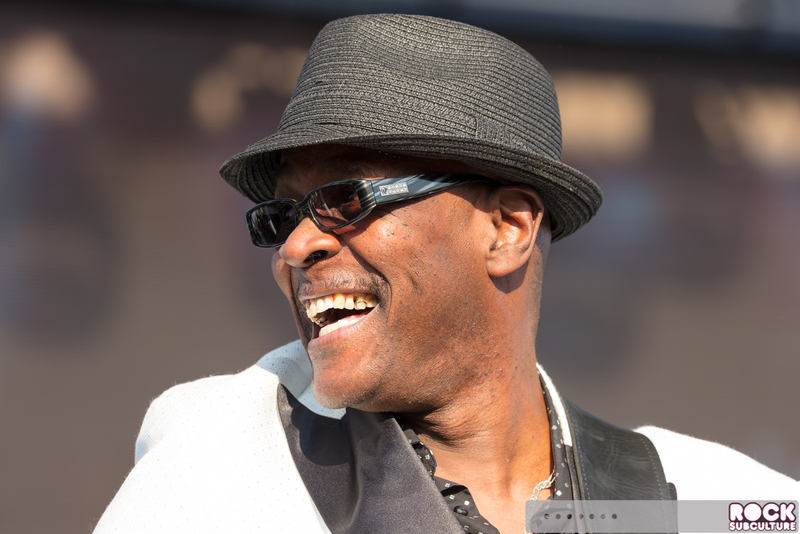 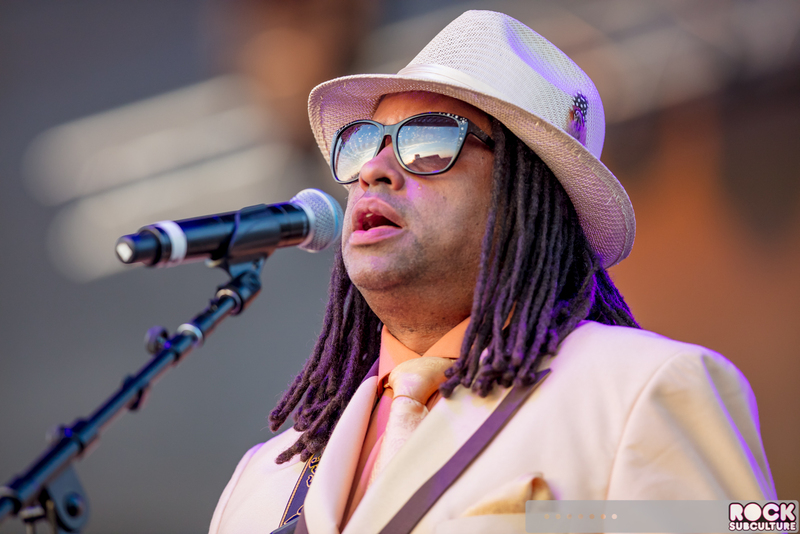 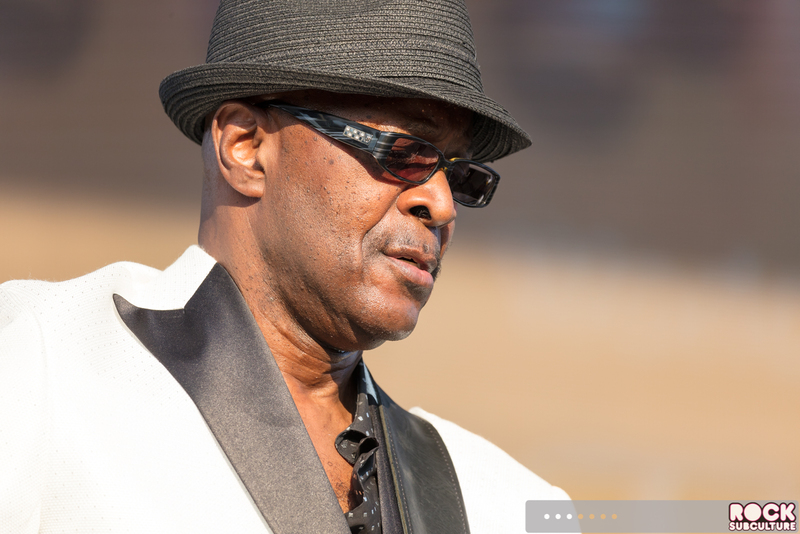 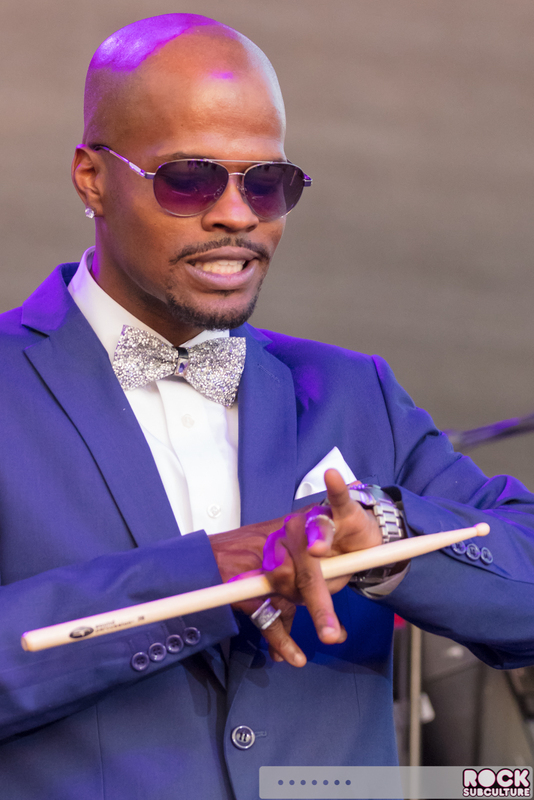 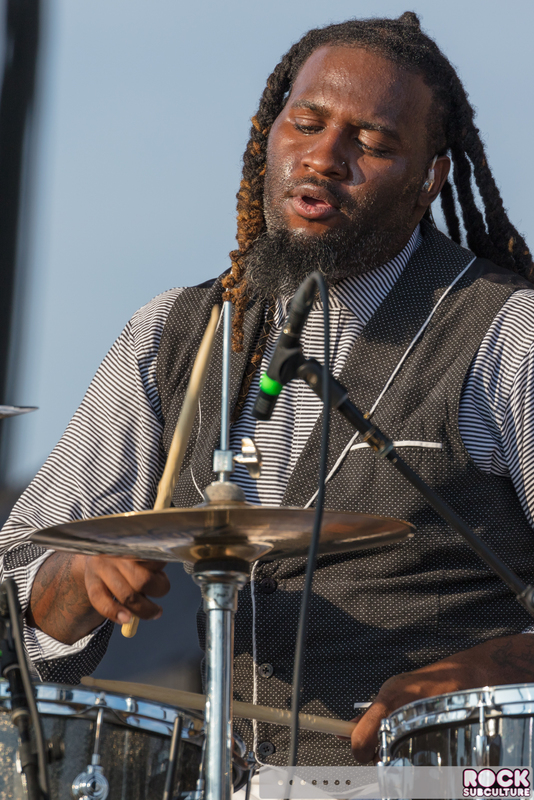 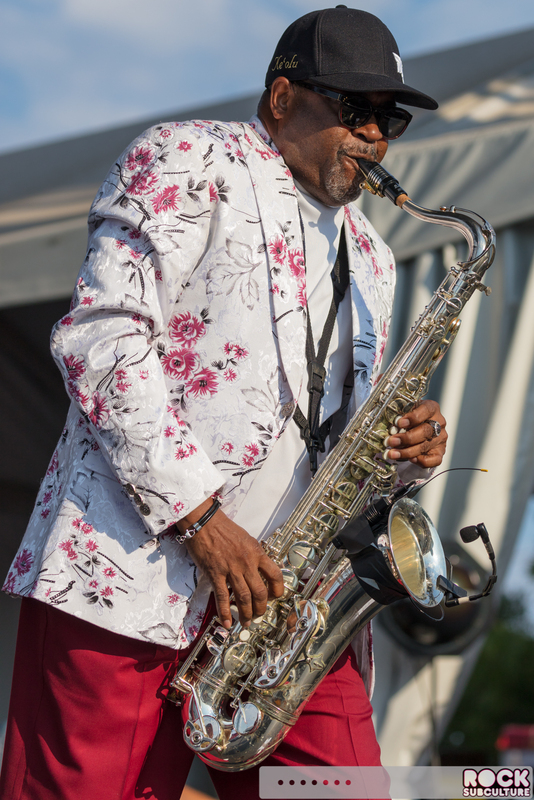 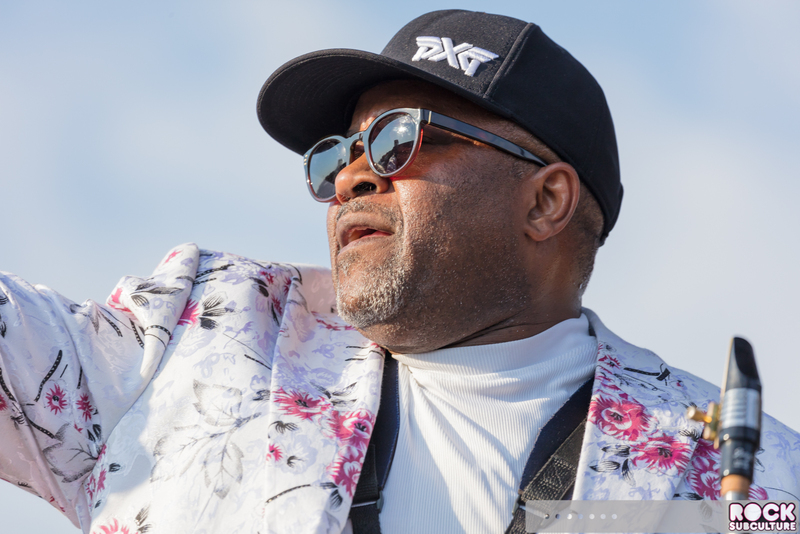 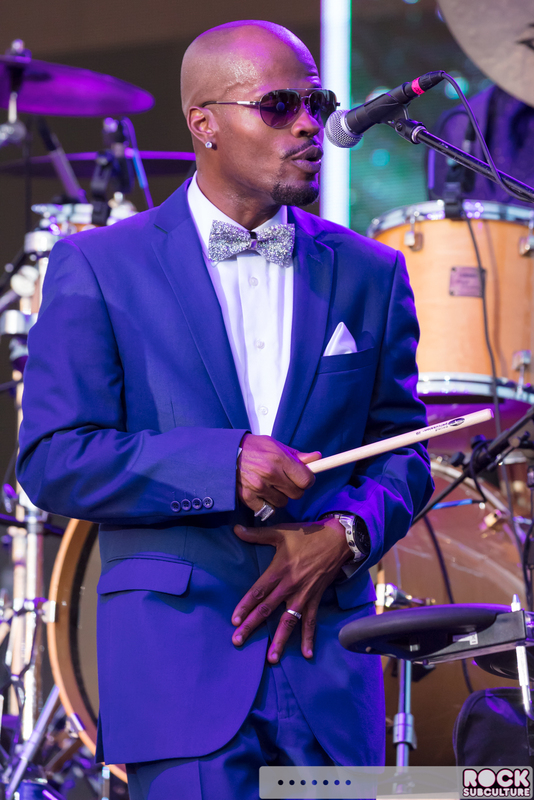 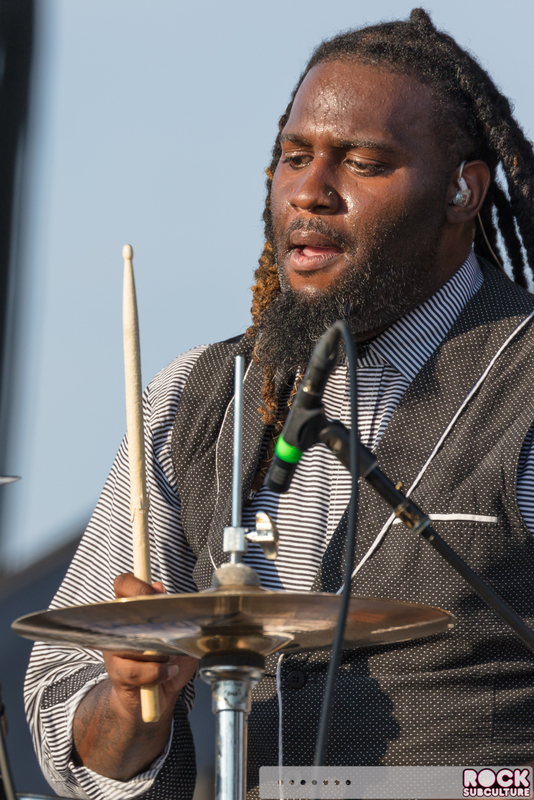 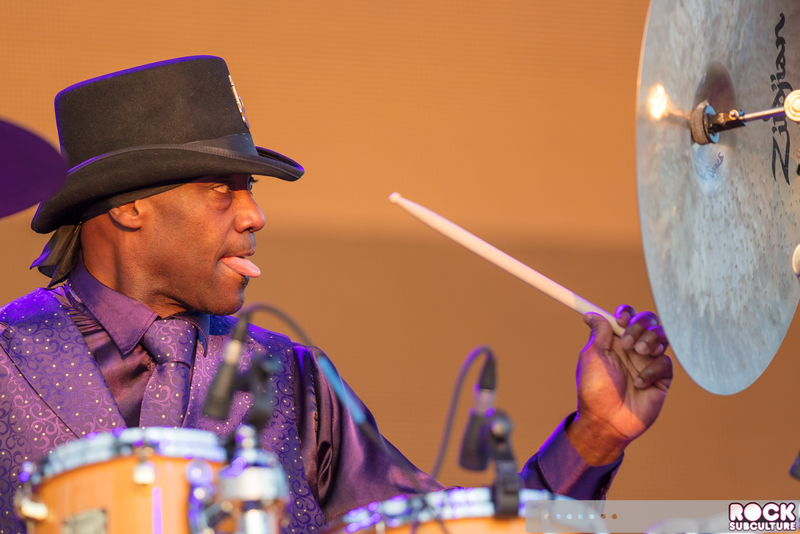 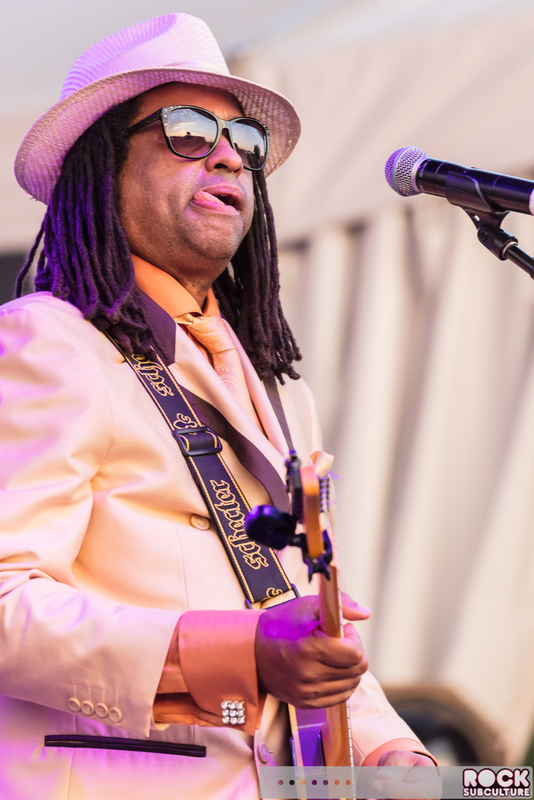 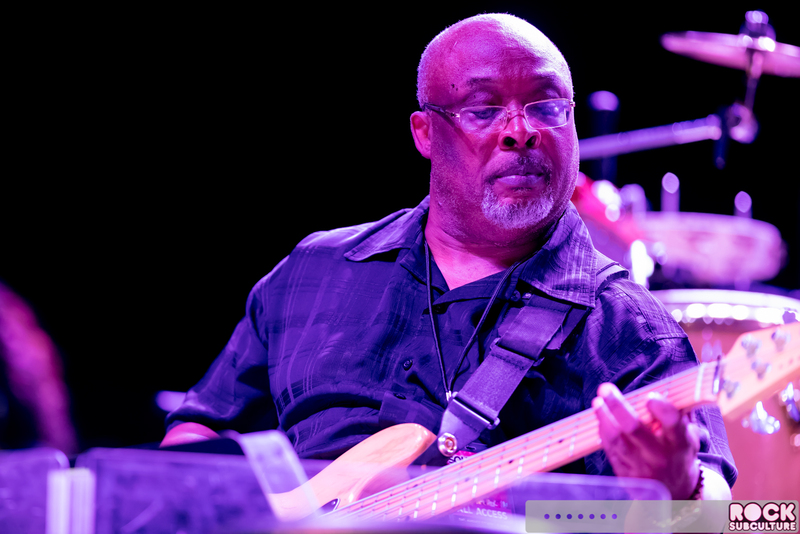 One of the other founding members of the band, Bruno Speight, tours and performs as The S.O.S. 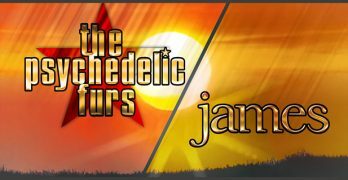 Band with another line-up. 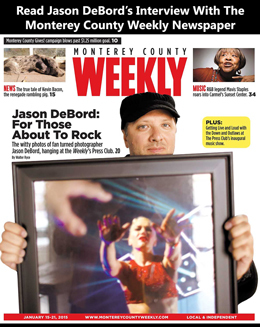 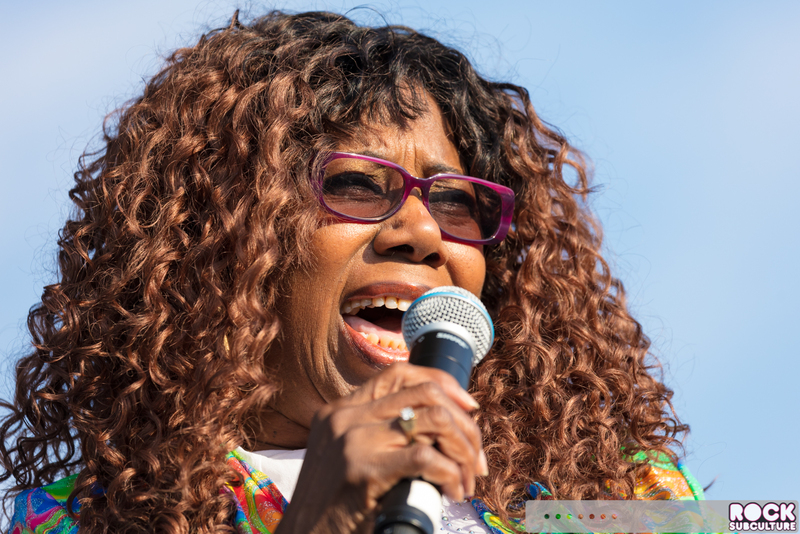 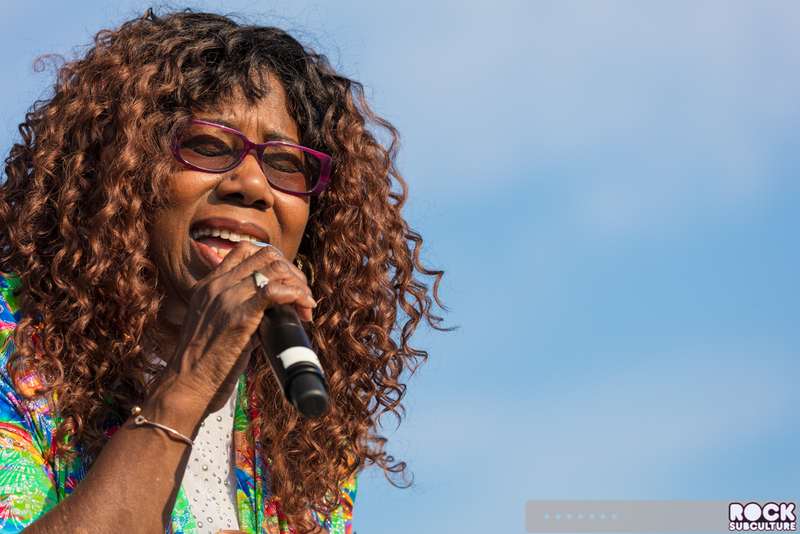 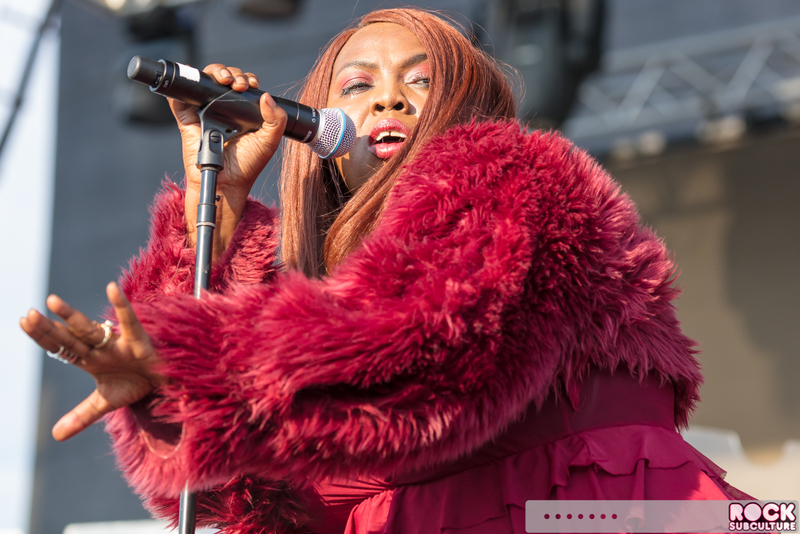 The version of the band fronted by Mary Davis that performed at Thunder Valley on Saturday night released a new song recently, “Just Get Ready”, which you can check out on YouTube. 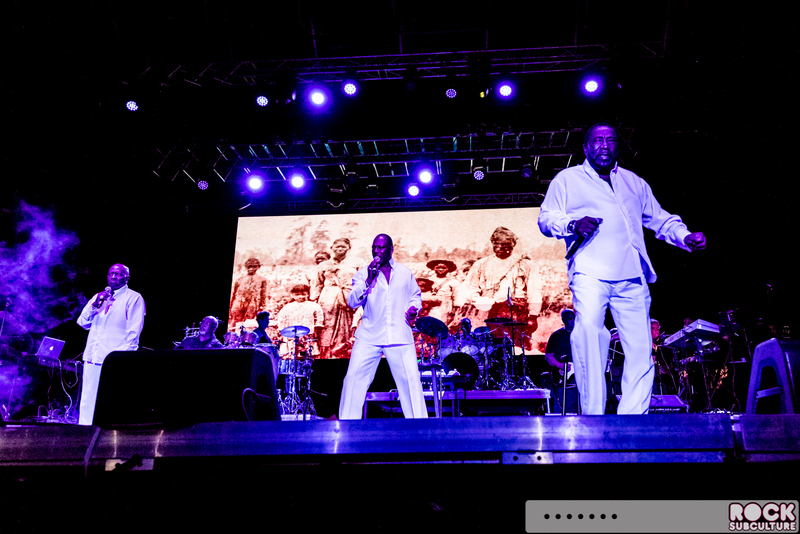 I’ve seen them perform once before and they were as impressive as ever. 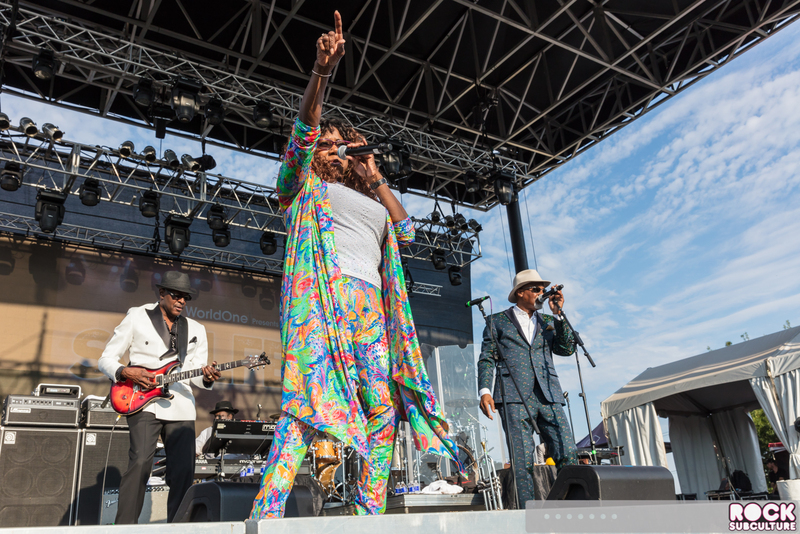 Such great energy and music, and an extended version of their biggest hit. 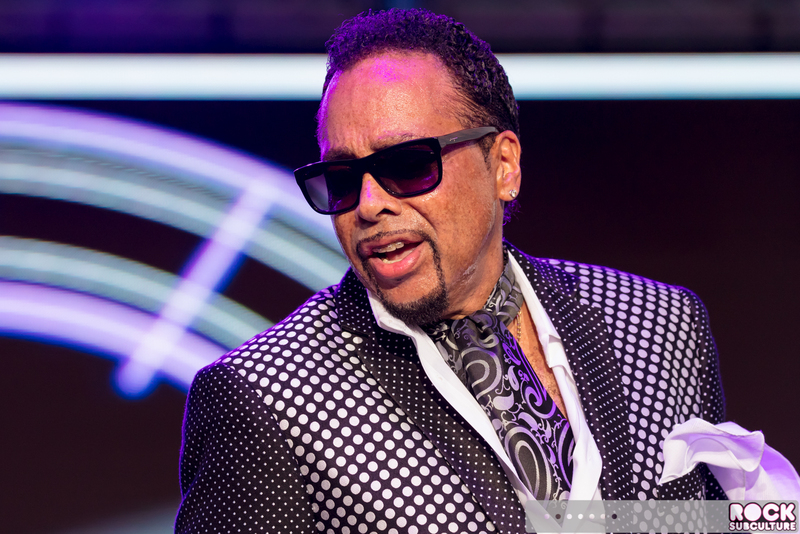 People who were paying any attention to music or pop culture in the early to mid-80s would immediately associate Morris Day & The Time with Prince, and with the landmark album, Purple Rain and associated film that was released in 1984. 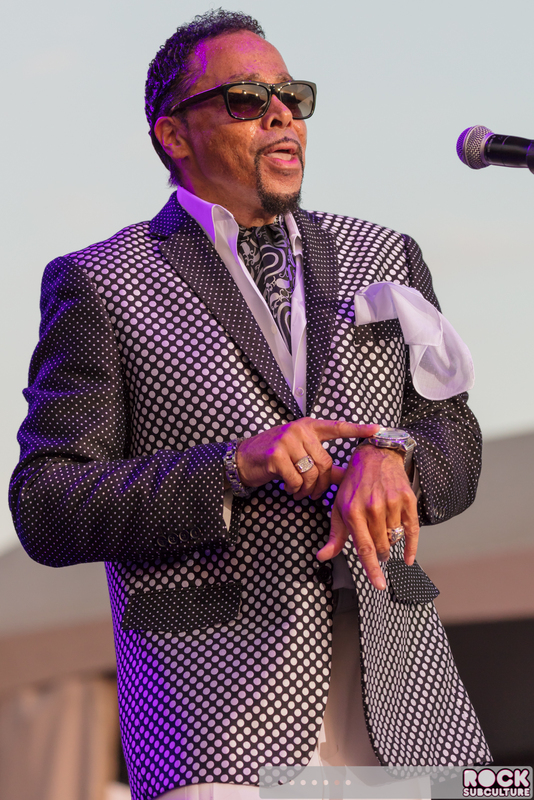 Morris Day and his band served as competitors in the film, and their song, “Jungle Love”, became a huge hit in its own right. 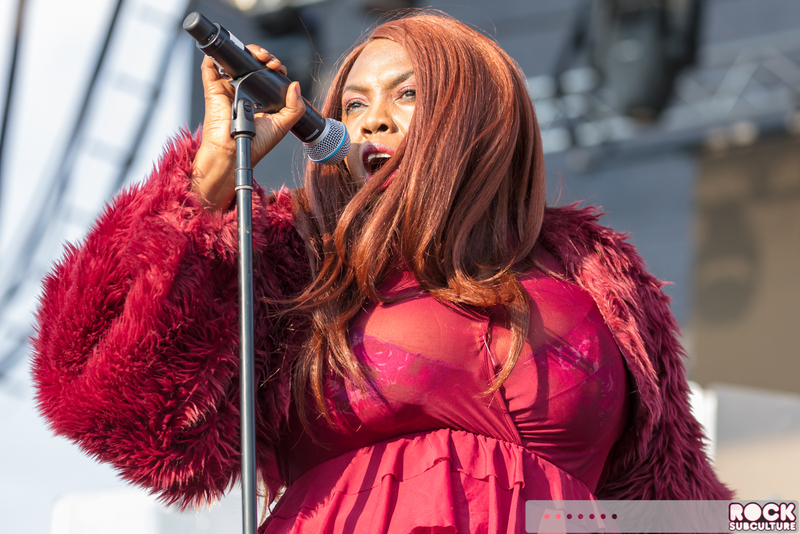 Prior to that, they performed the backing music to the hit song, “Nasty Girl” by Prince protégé girl group Vanity 6. 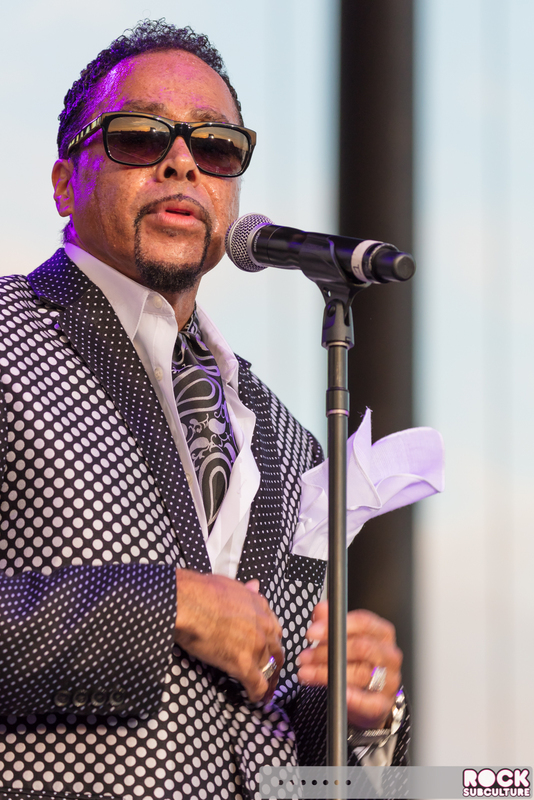 Fascinatingly, Prince wrote and composed all of the songs on the first eponymous album by The Time before the band was truly formed, only allowing vocals to be recorded by Morris Day. 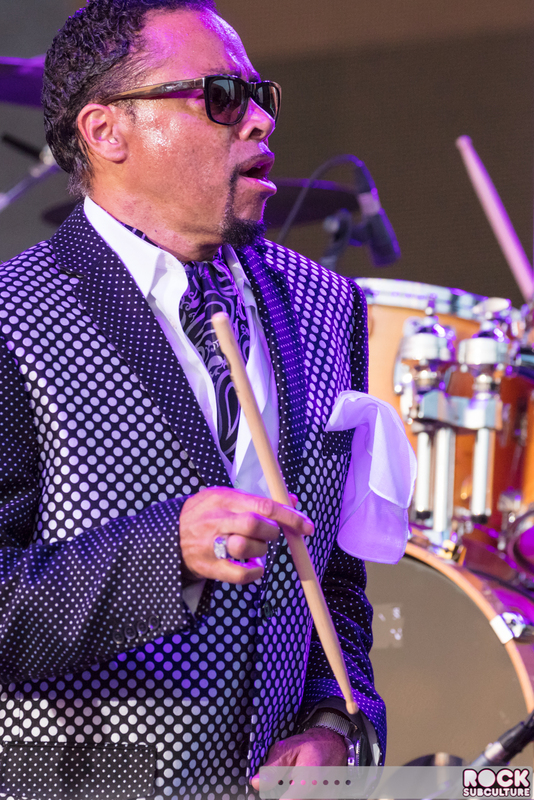 Prince and Morris Day grew up together, and apparently Day was behind the song “Partyup”, which Prince recorded on Dirty Mind and did give him credit. 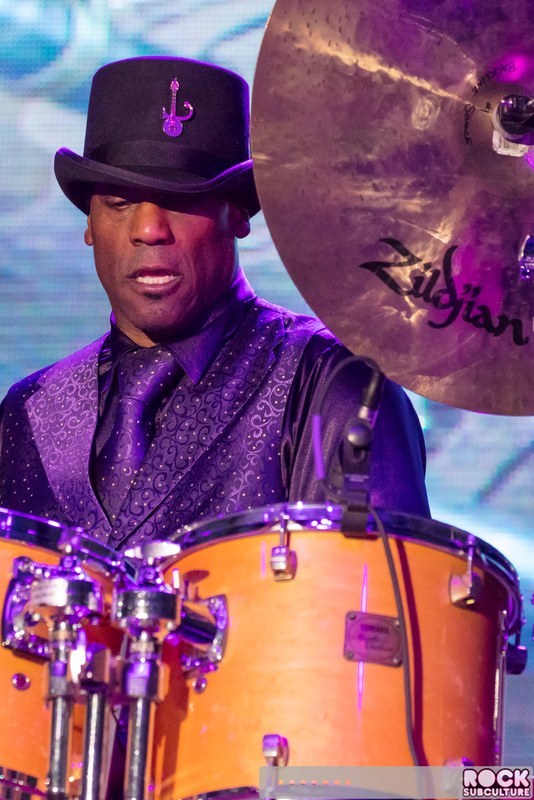 The band The Time was created by Prince as part of his deal with Warner Bros. as an outlet to create music in a different style from his solo material. 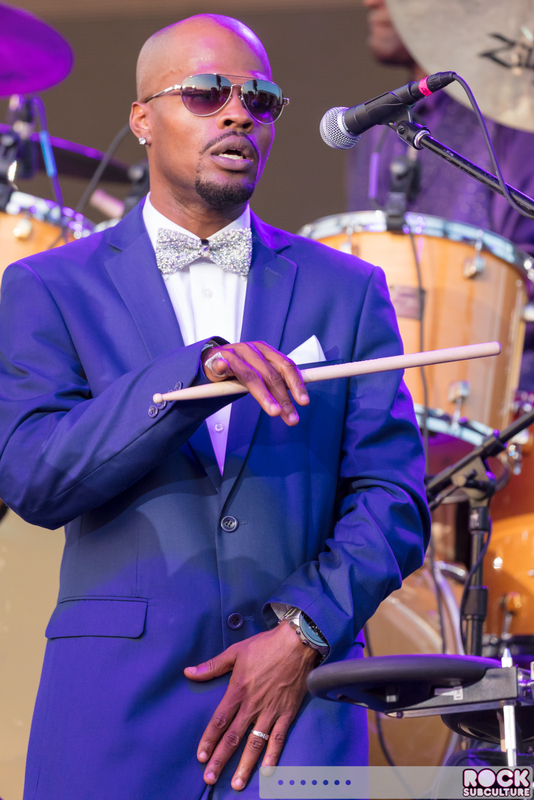 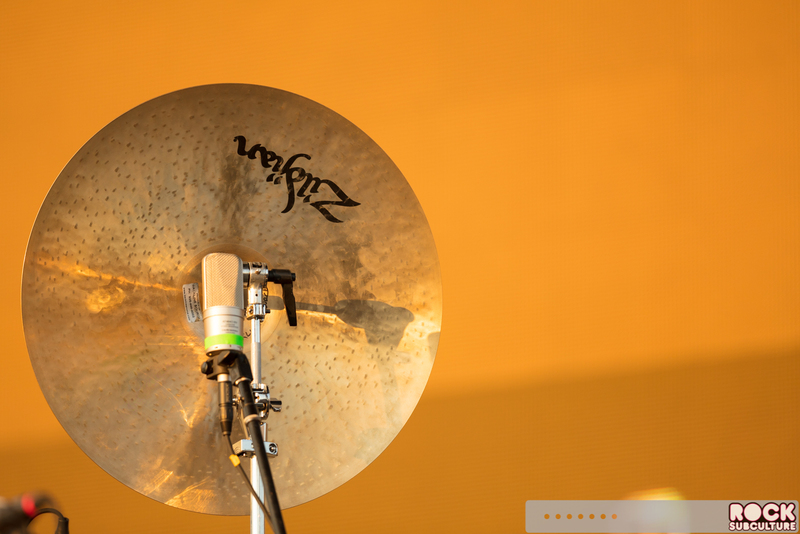 The Time was formed with some members of an existing Minneapolis funk band, Flyte Time. 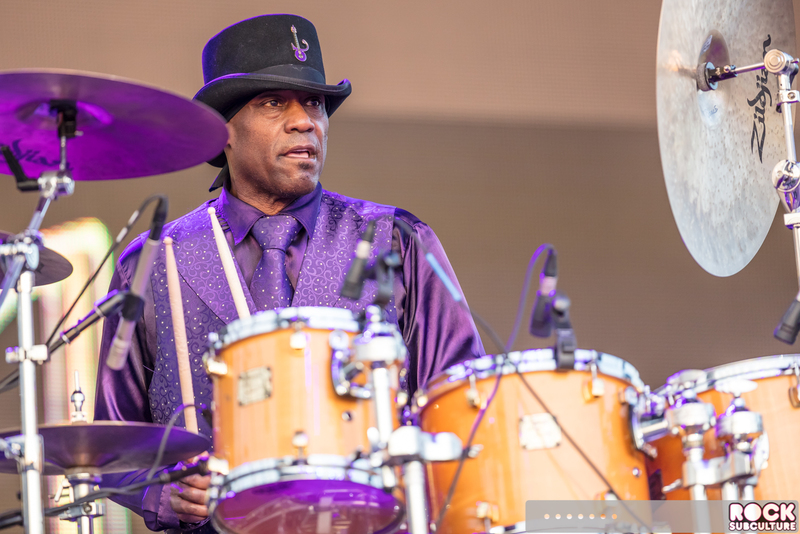 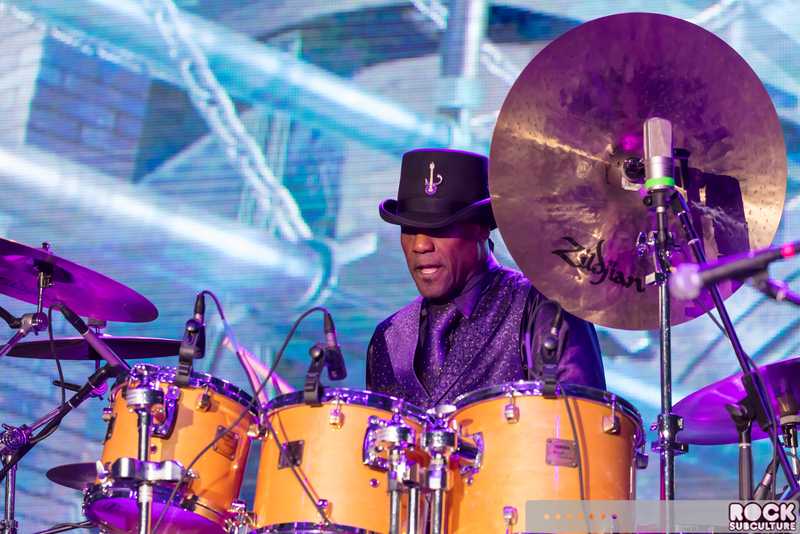 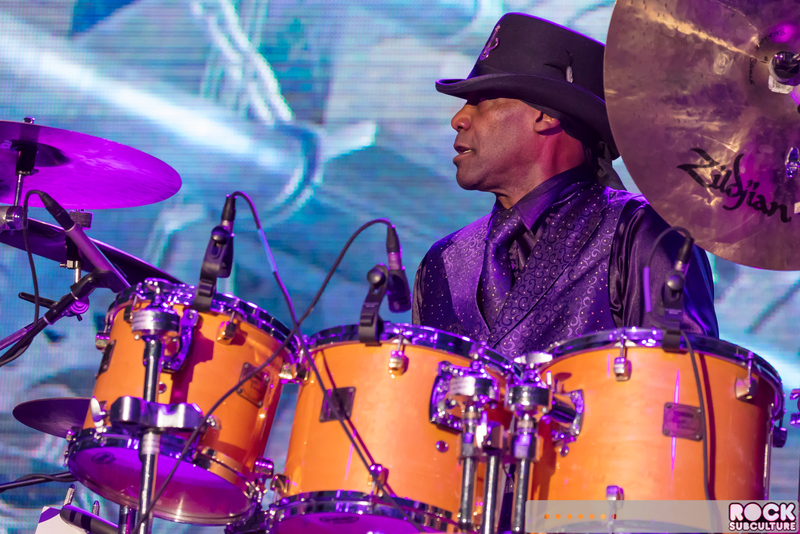 This included Jellybean Johnson (drums), Jimmy Jam (keyboards), Monte Moir (keyboards) and Terry Lewis (bass), as well as Jesse Johnson (guitar) and Jerome Benton. 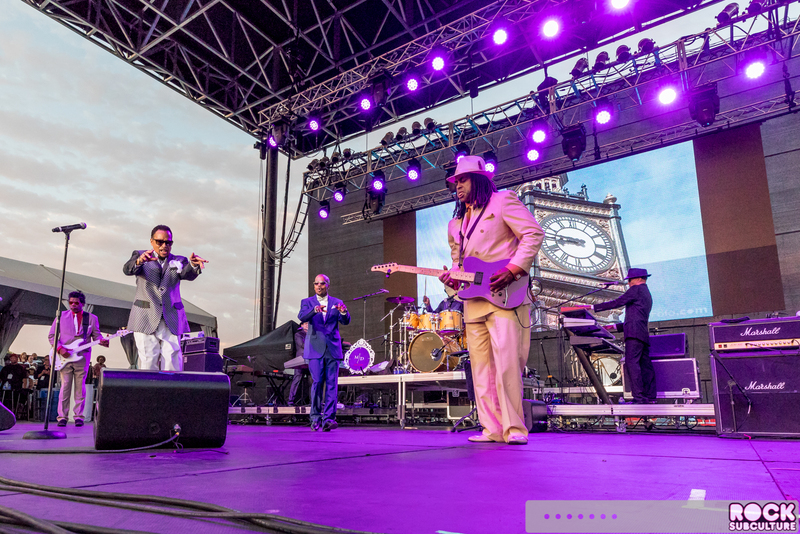 Those who have followed The Time and their careers closely hail them as one of the best old school funk bands of all time. 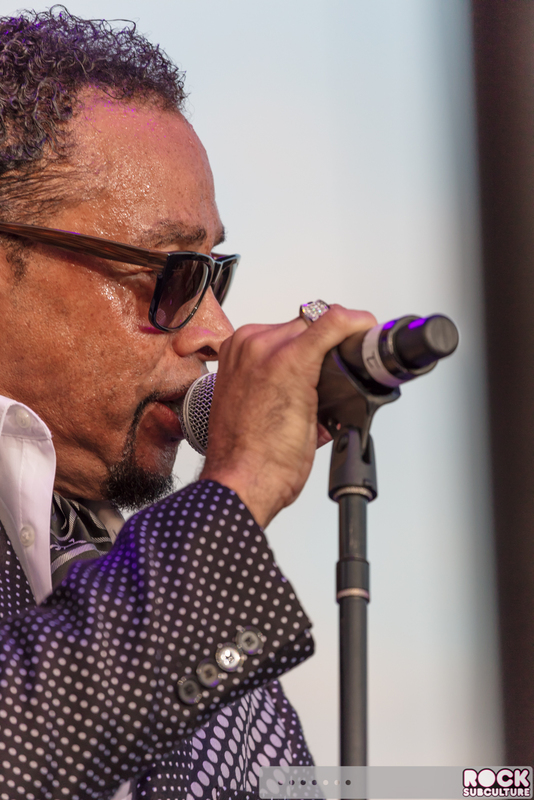 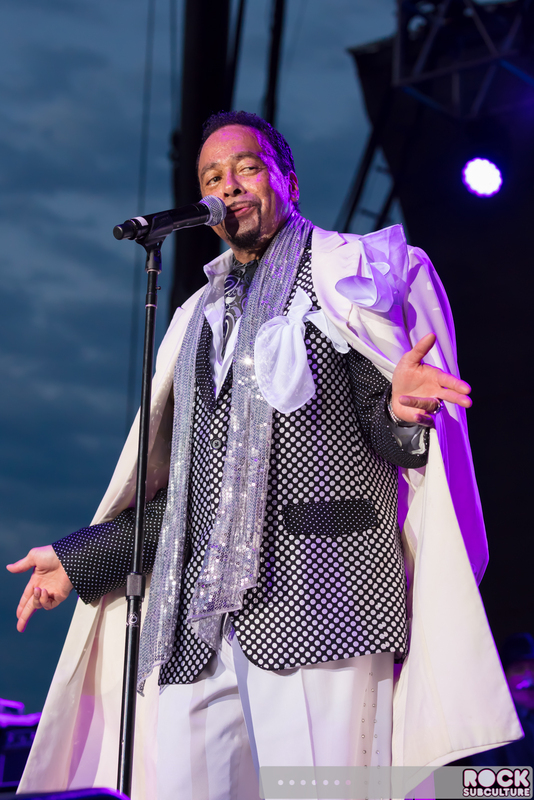 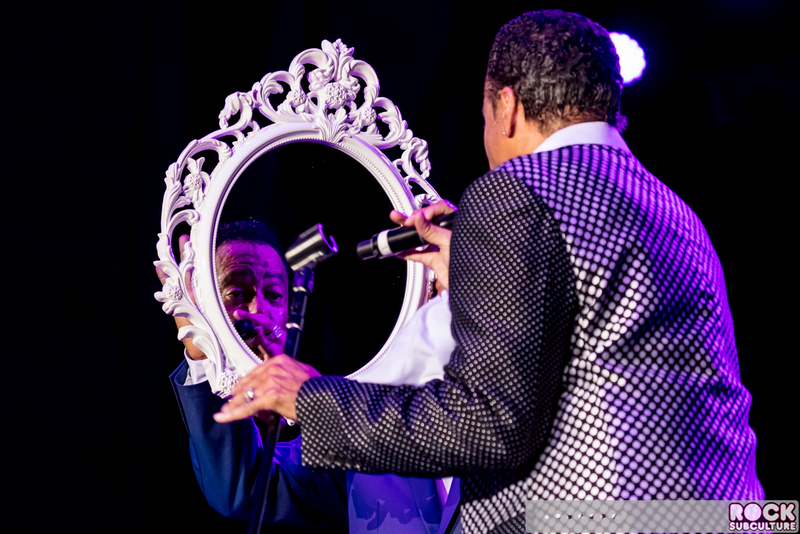 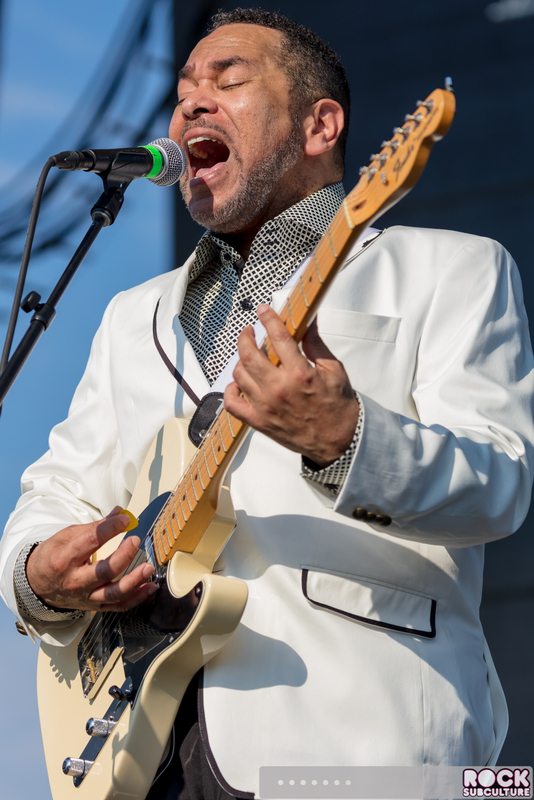 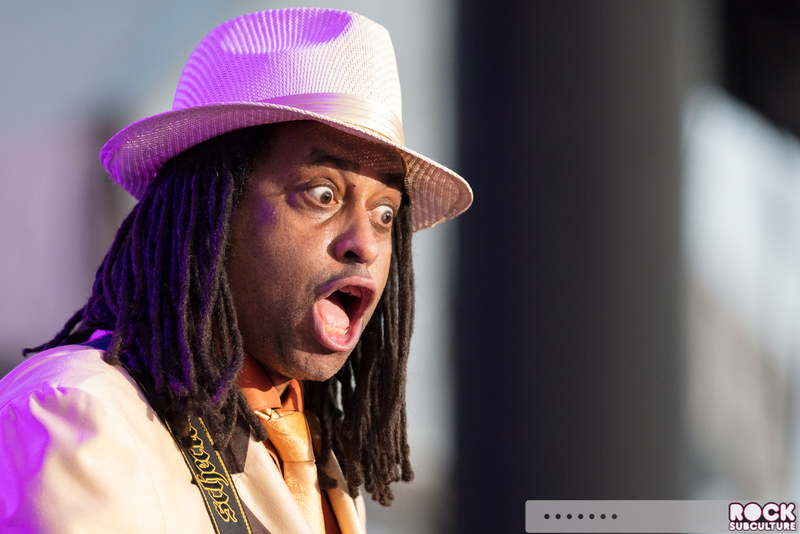 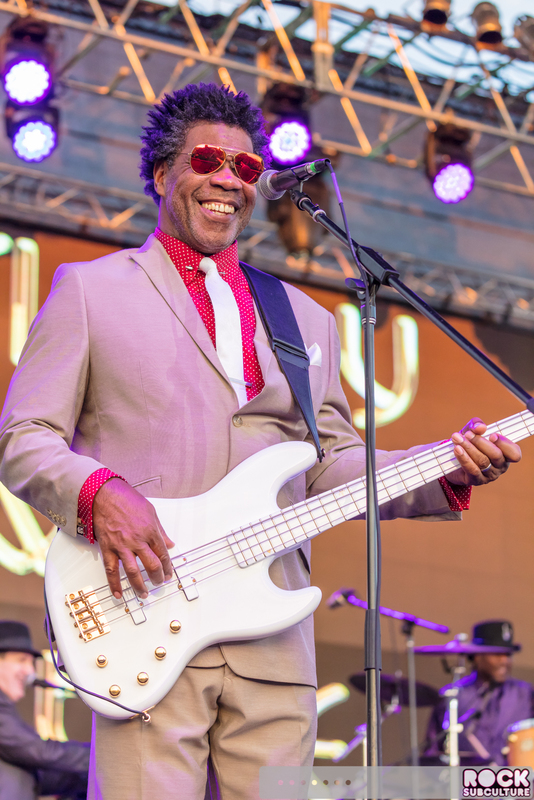 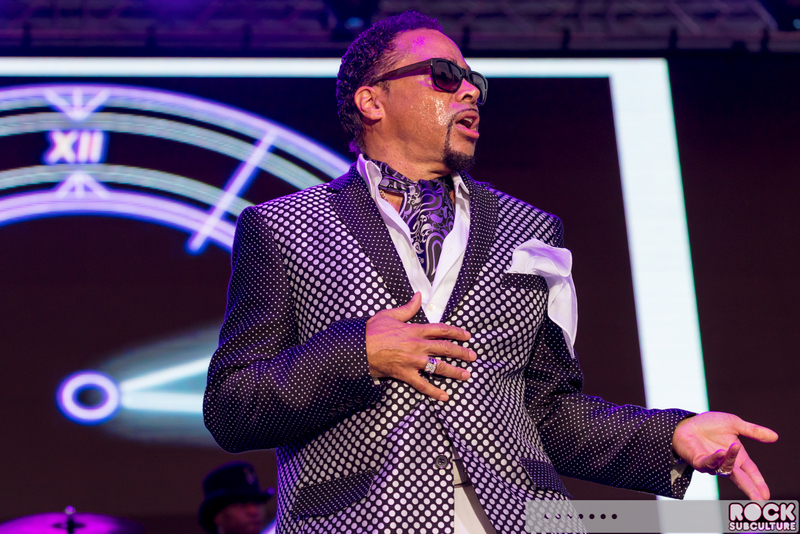 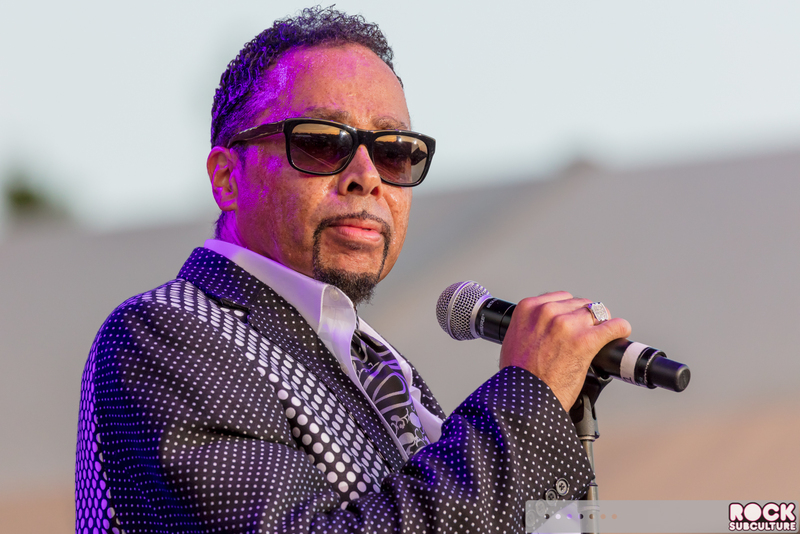 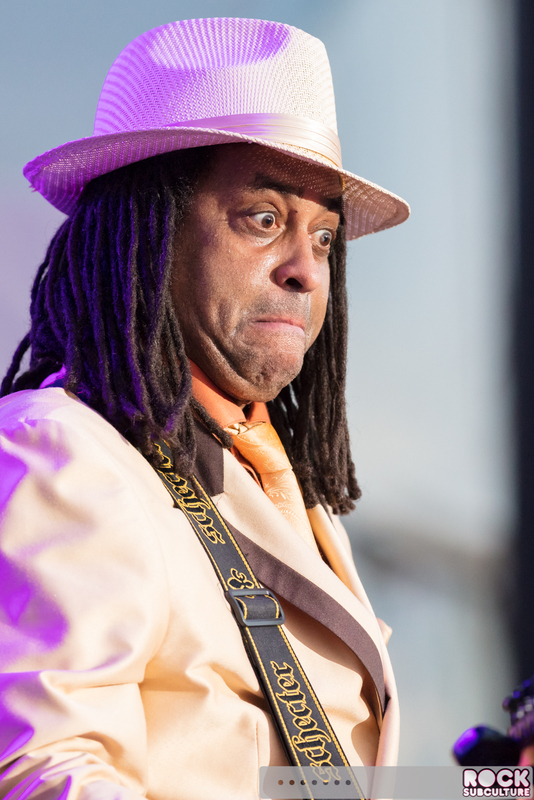 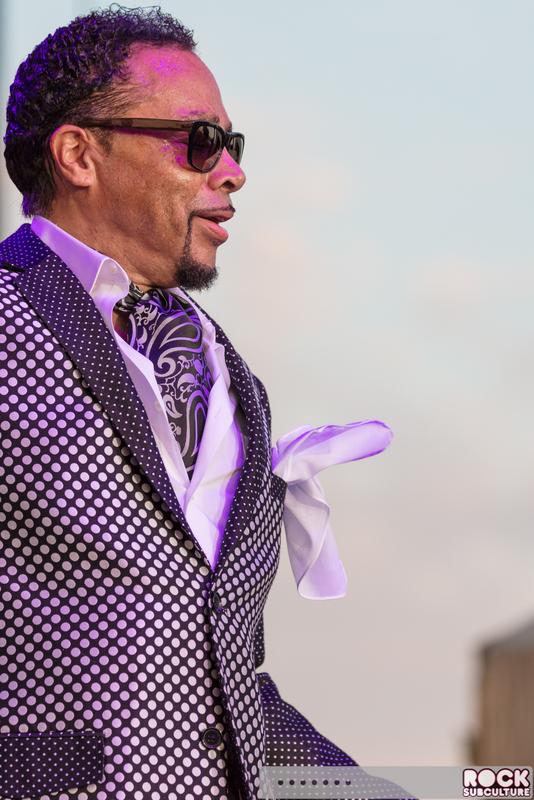 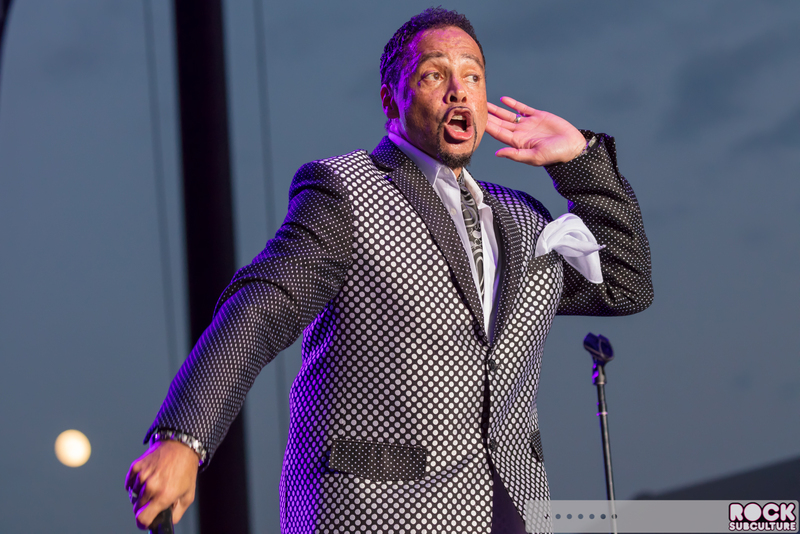 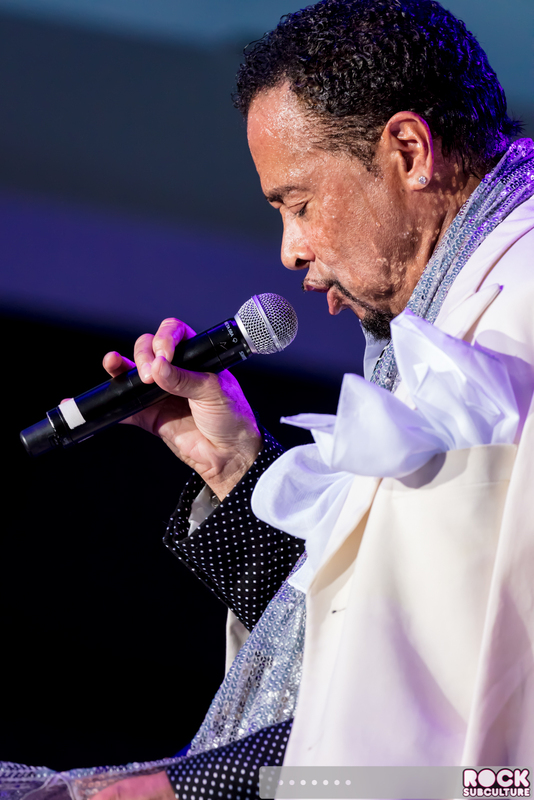 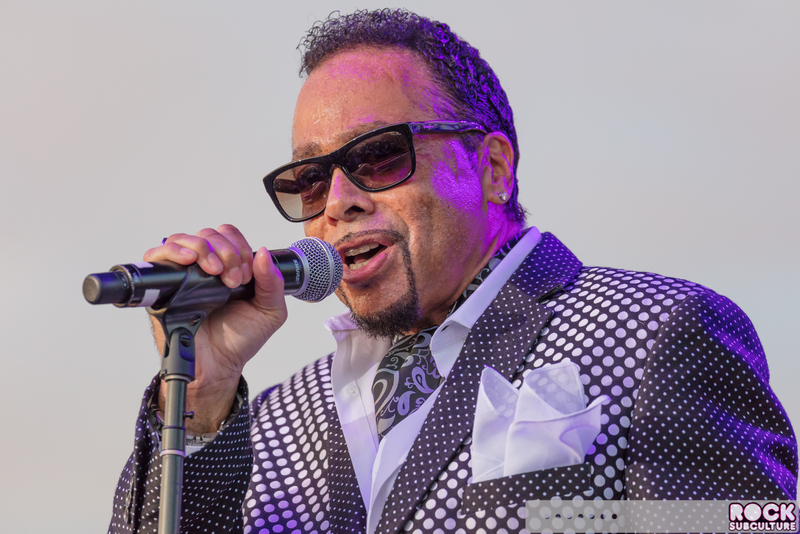 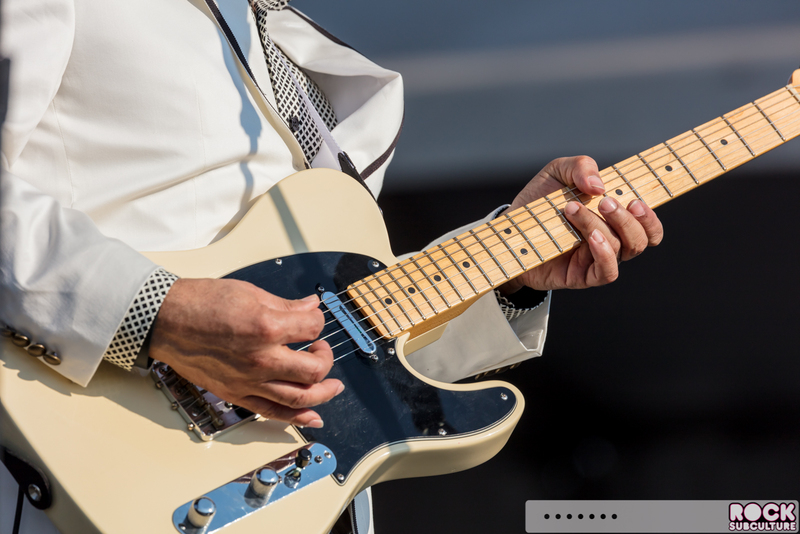 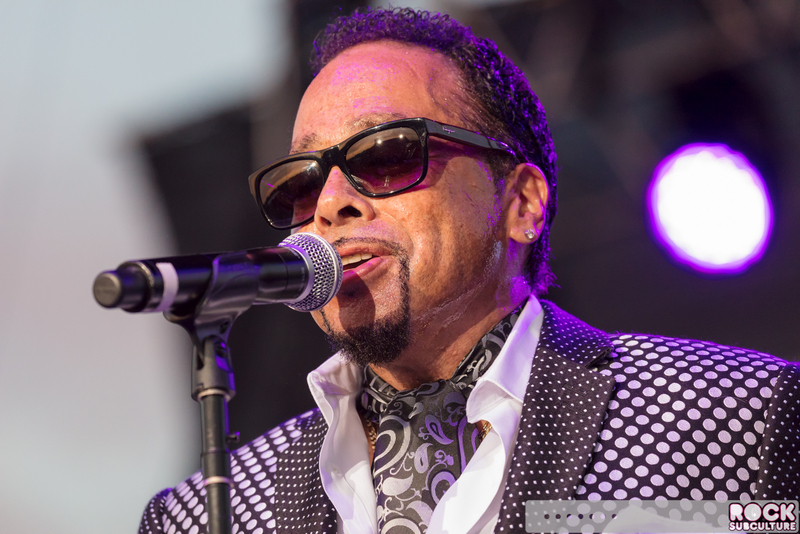 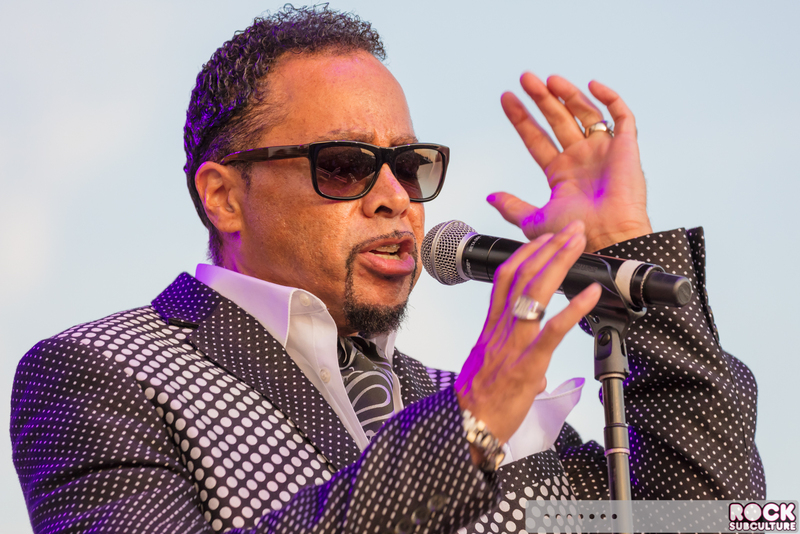 Due to the structure and ownership of the band and ongoing issues and rivalries with Prince, members had come and gone over the years, and Morris Day himself left to pursue a solo career and acting as well. 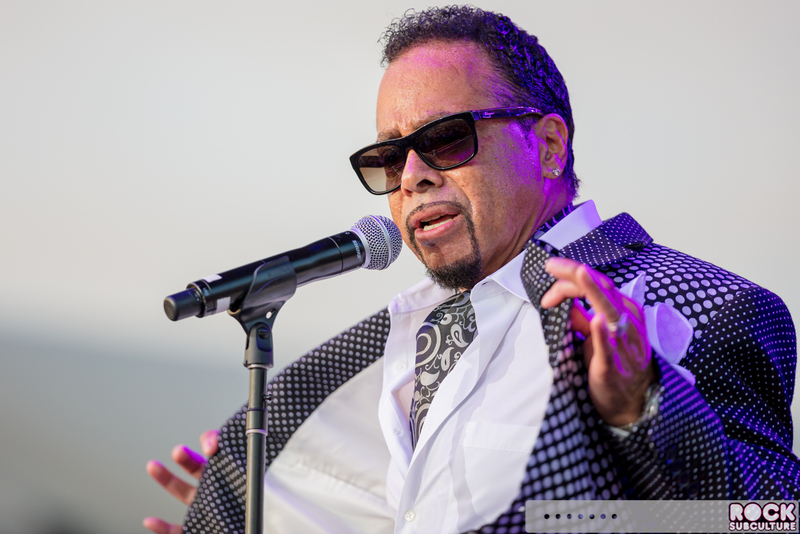 The band’s original members did reunite in 1990 for the Graffiti Bridge album and soundtrack, as required by Warner Bros. more than out of any desire by Prince to make it happen. 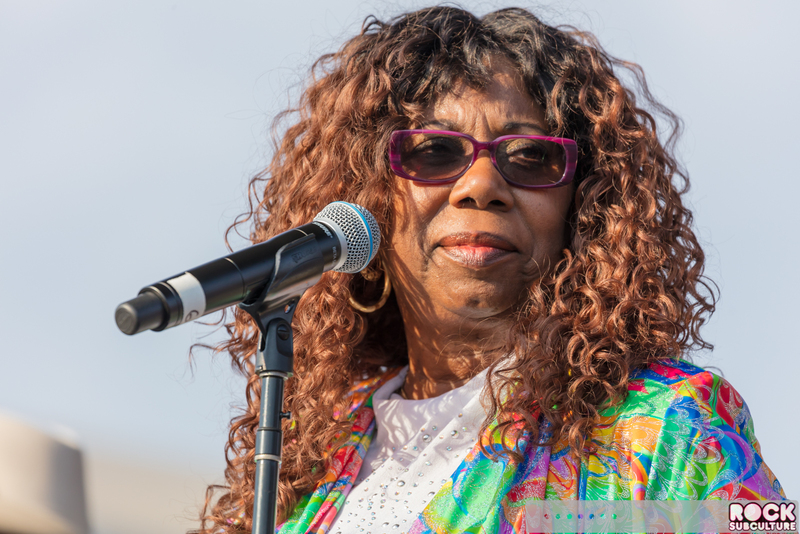 Over the years, there have been a variety of reunions and reshuffling of members, new and old. 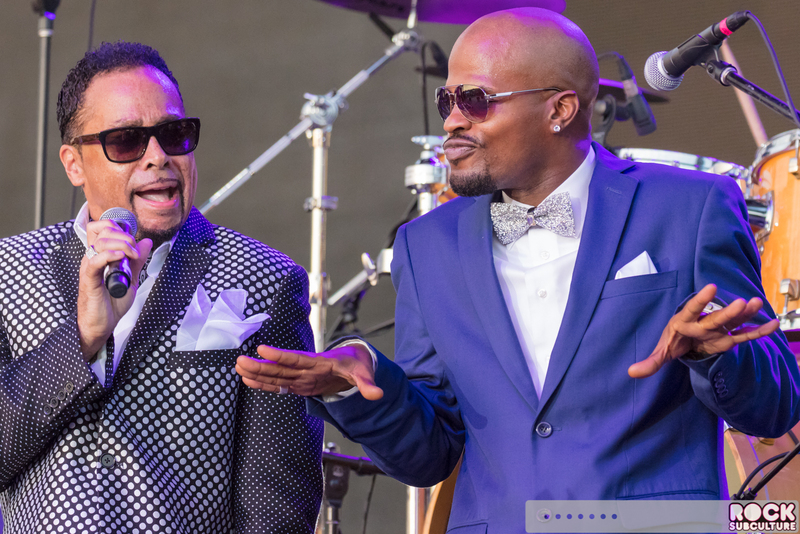 They did supposedly put together a fifth album in the late 90s, but were not able to come to terms with Prince to complete and release it. 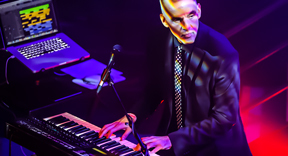 In 2011, the core original members decided to change the name of the band to afford themselves the freedom to produce and release new music, so they reformed as The Original 7ven and released the album, Condensate in 2011. 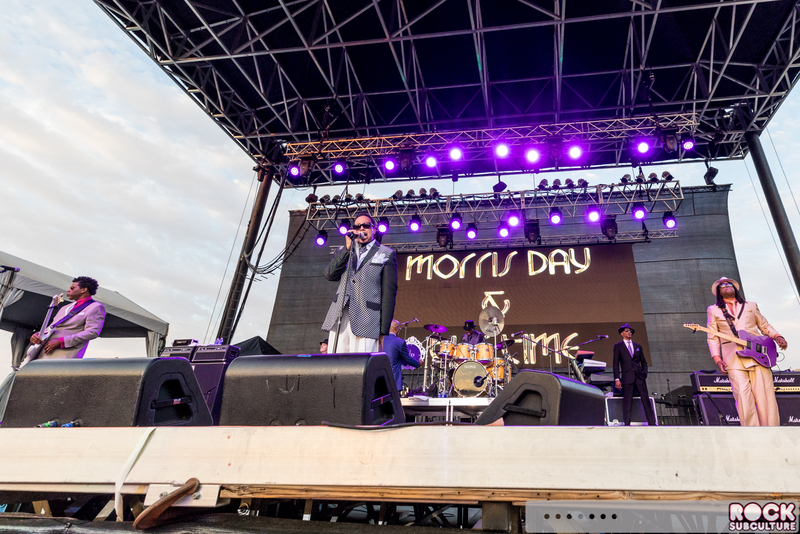 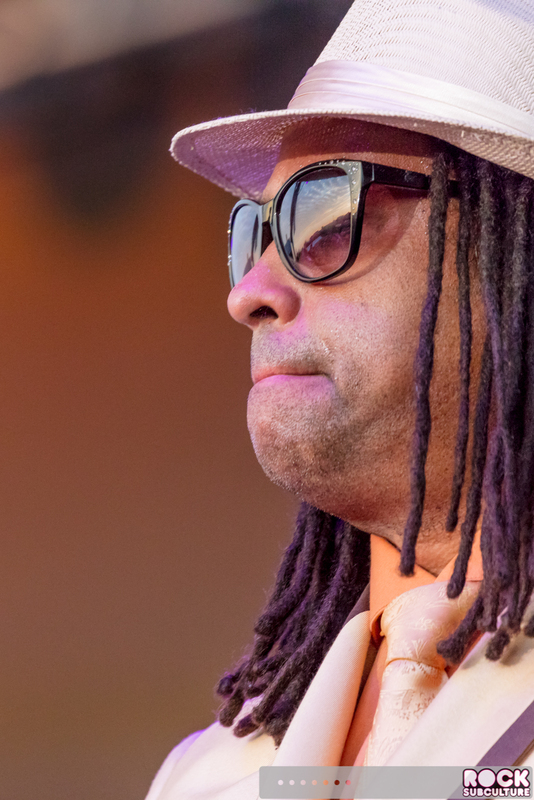 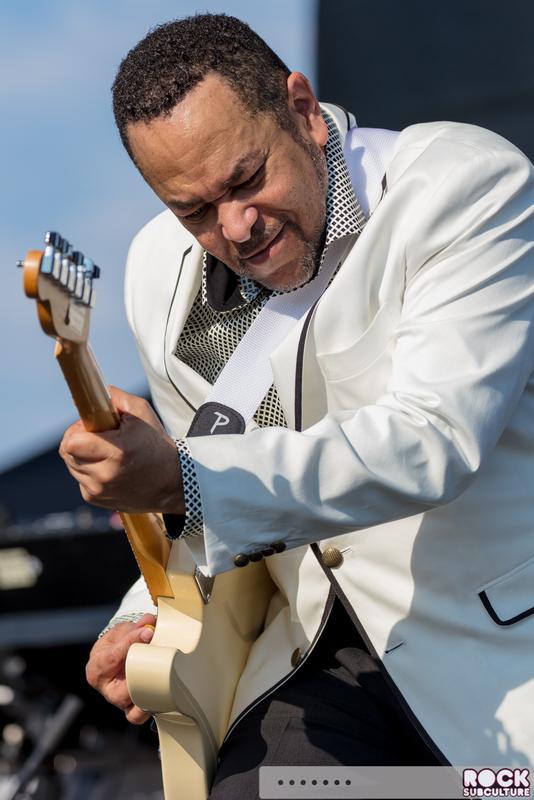 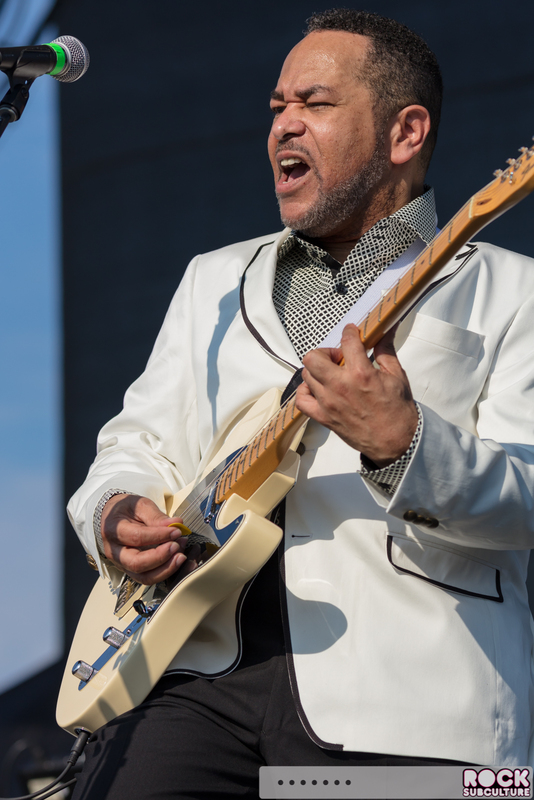 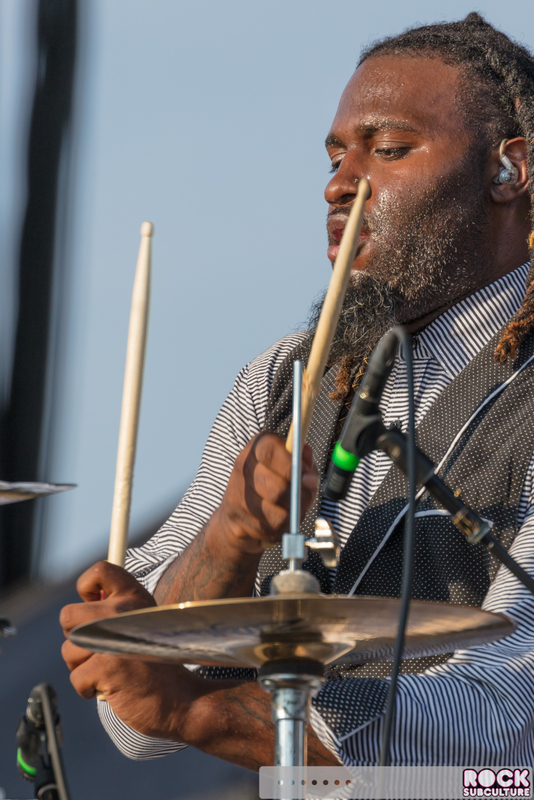 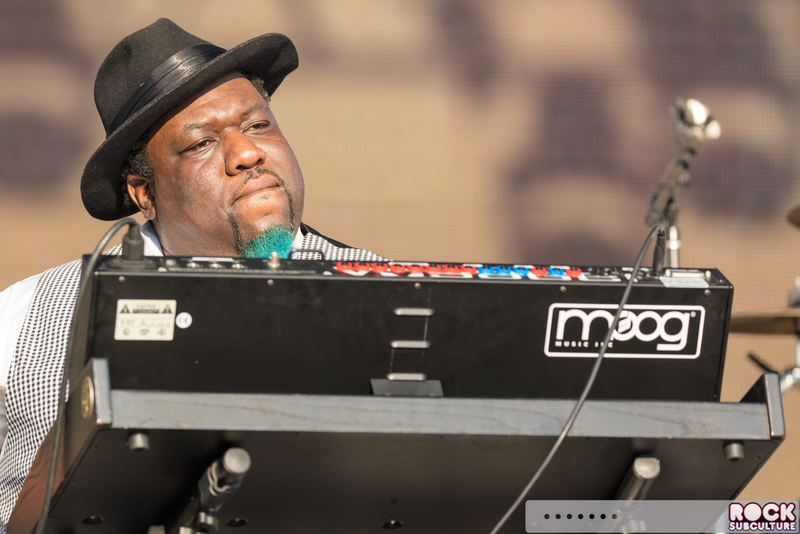 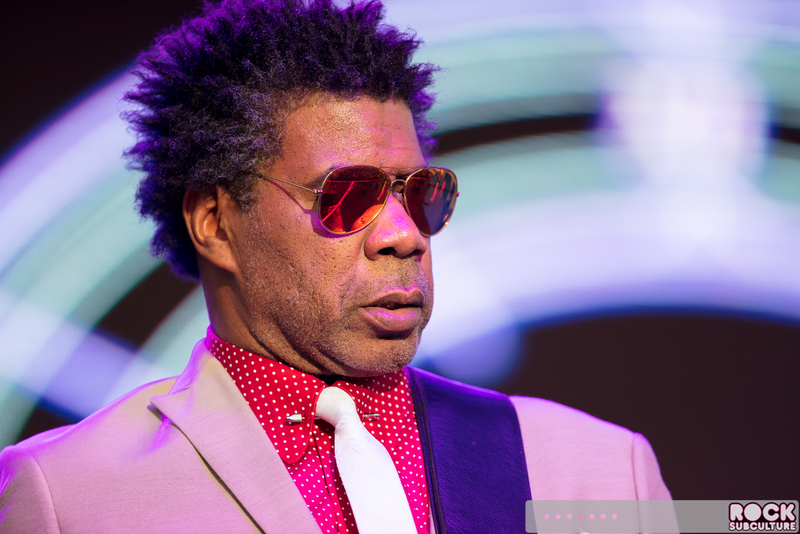 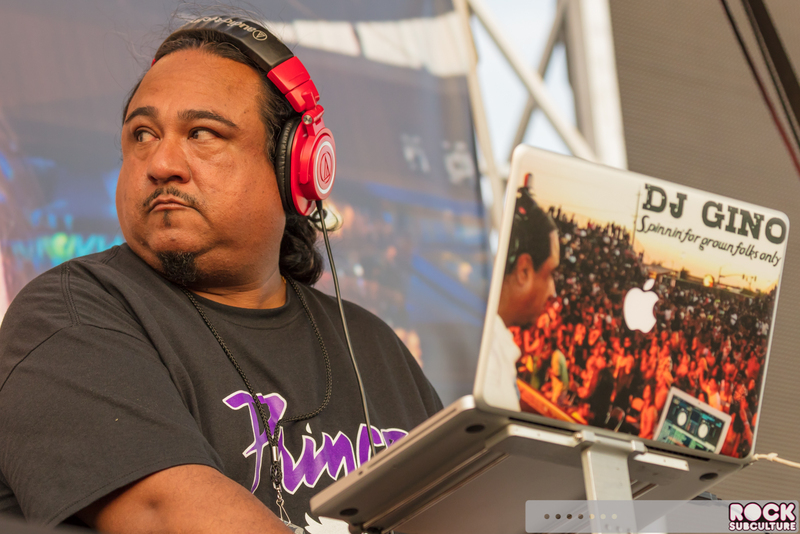 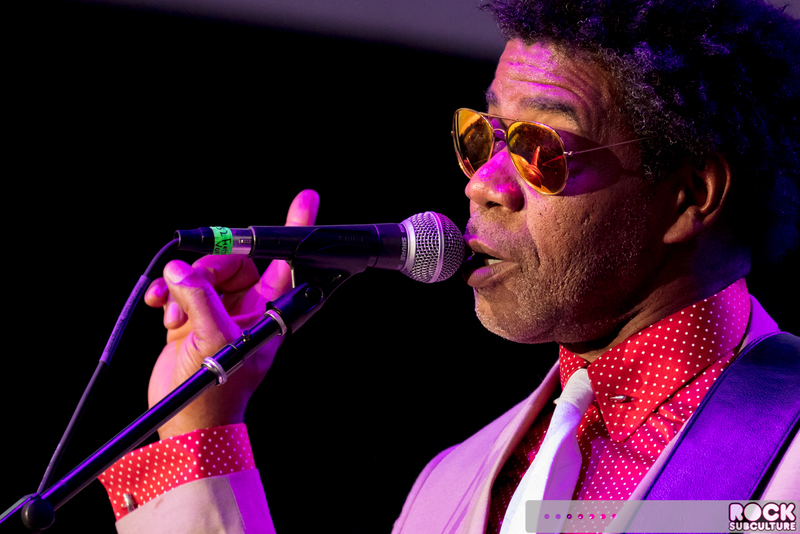 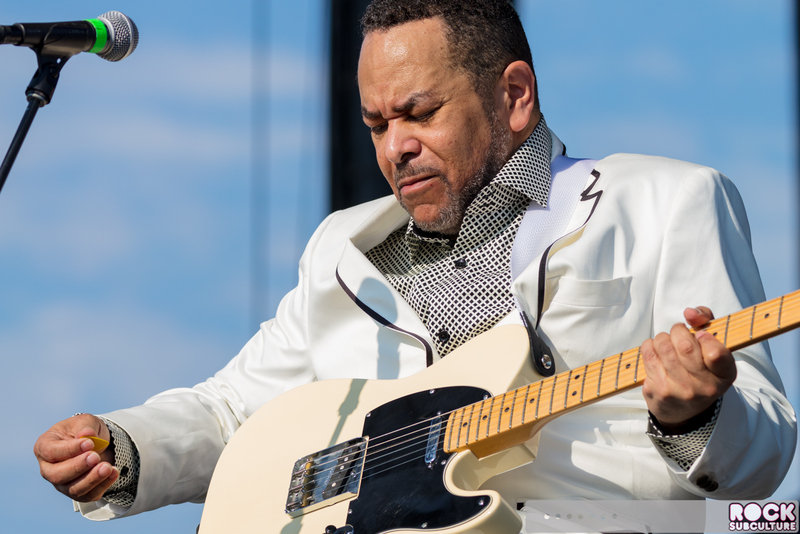 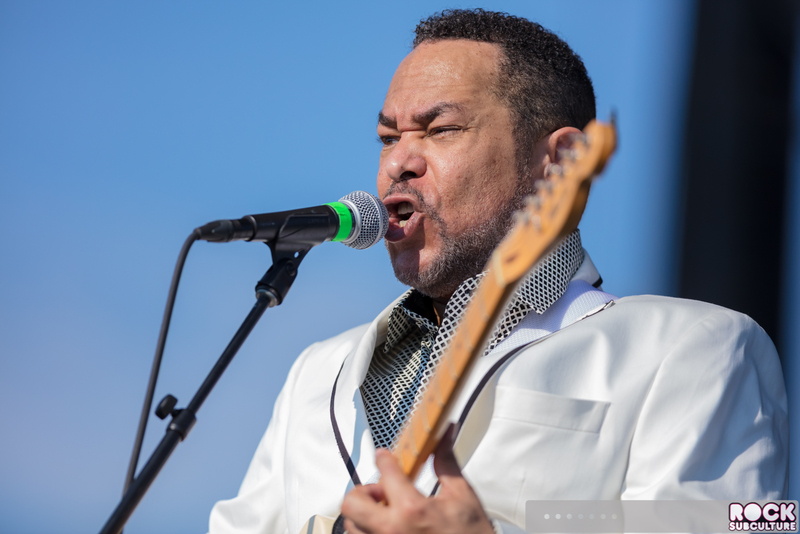 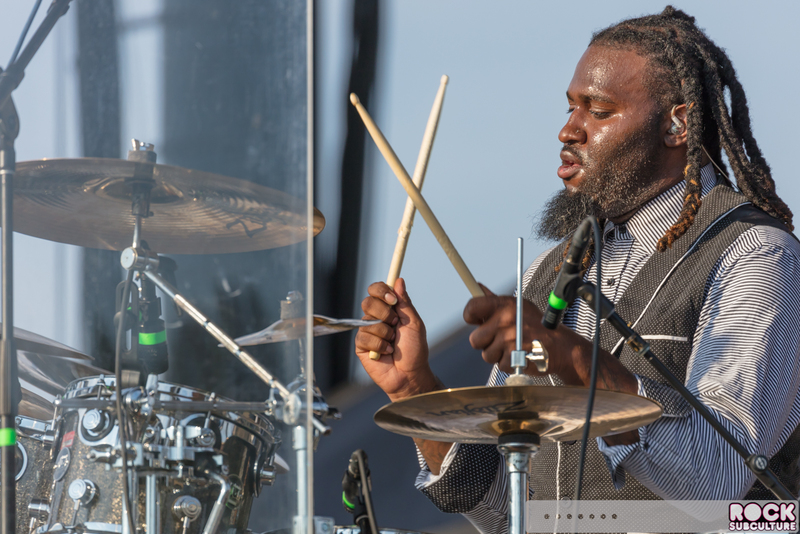 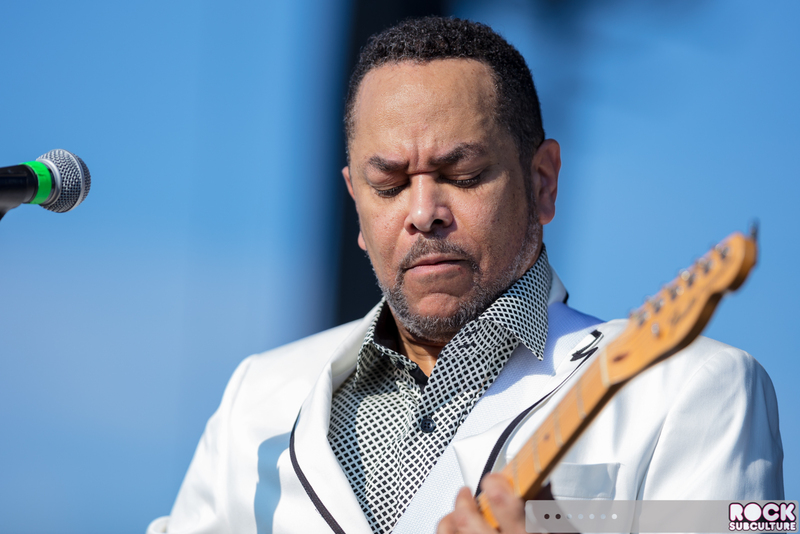 I last saw Morris Day and The Time perform back in 2014, with the band headlining “The Big Block Party”, and at the time I expressed my disappointment with Prince in trying to sort out his relationship with fellow artists that he’s worked with in the past, as there sometimes seemed to be some conflict. 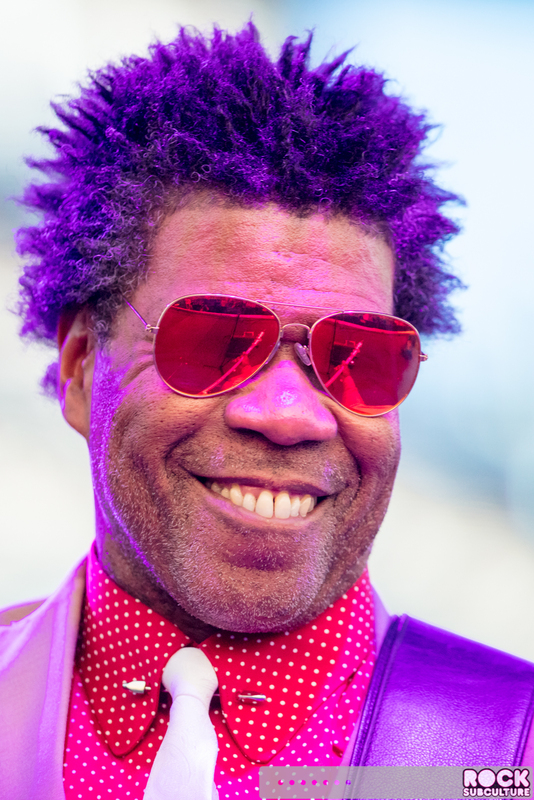 Well, obviously, since then Prince has tragically passed away, which appears to have changed things with some of the artists and collaborators who worked with him in the past. 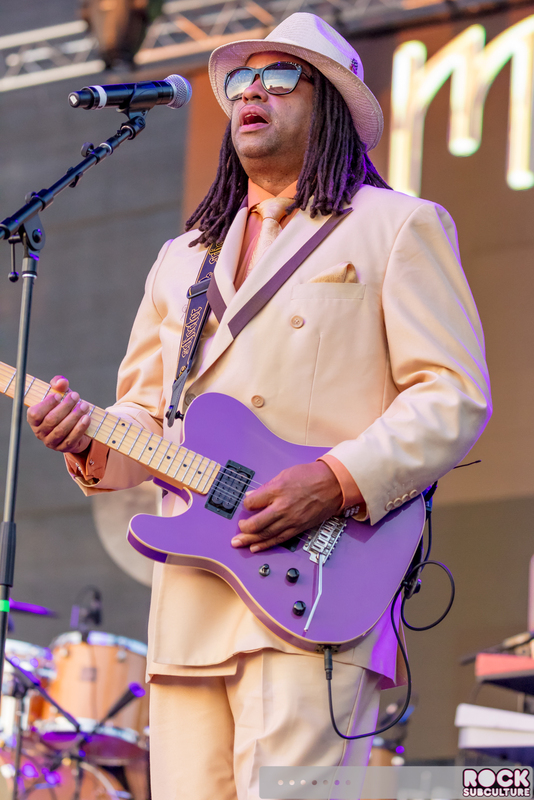 With The Time at Thunder Valley on Saturday night, they actually opened with a Prince song and paid tribute to him later in the show as well. 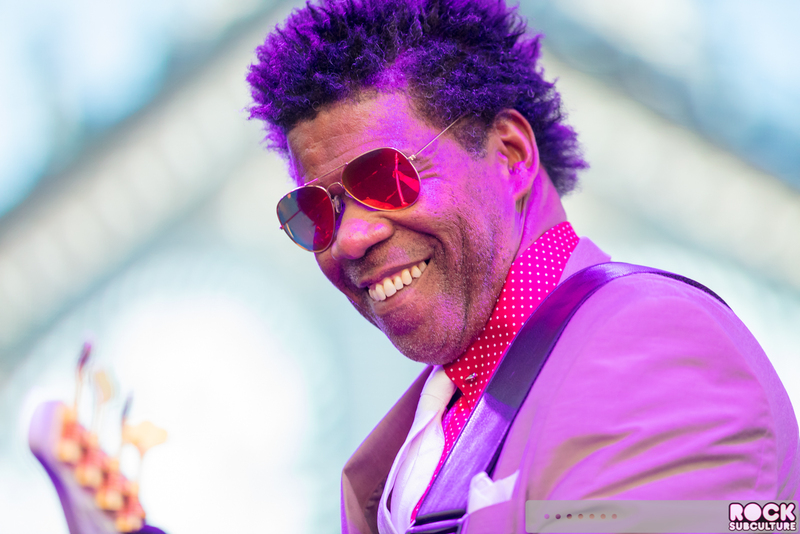 I feel like it is great that these artists with ties to Prince can keep him alive in some respects with their live music that has some connections with Prince. 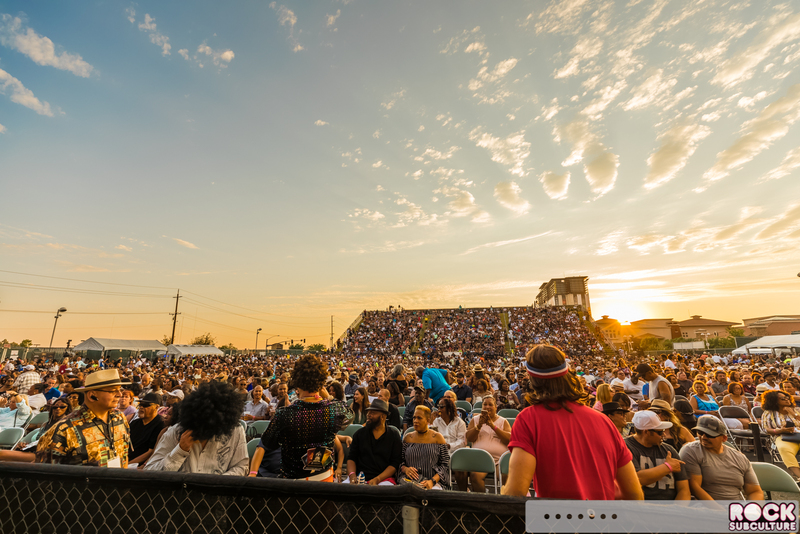 So with this show at Thunder Valley, it felt like the band were free of constraints and concerns of just a few years ago, and free to be themselves and perform. 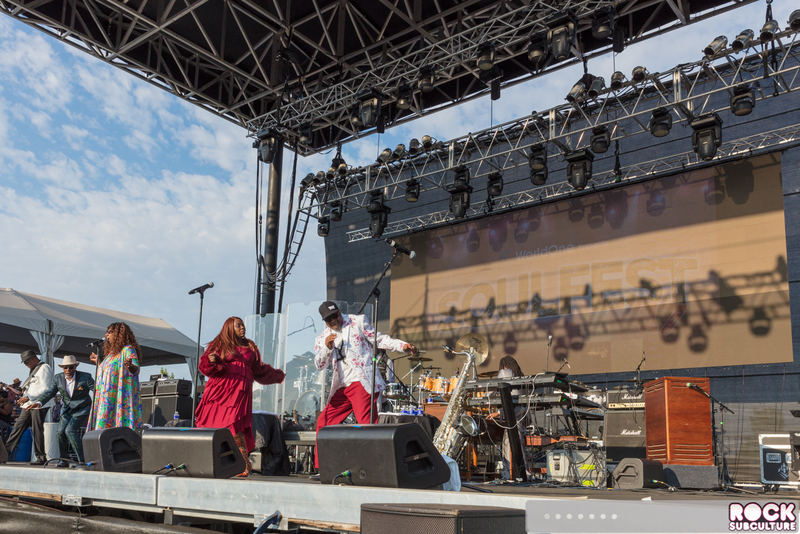 They put on an excellent show. 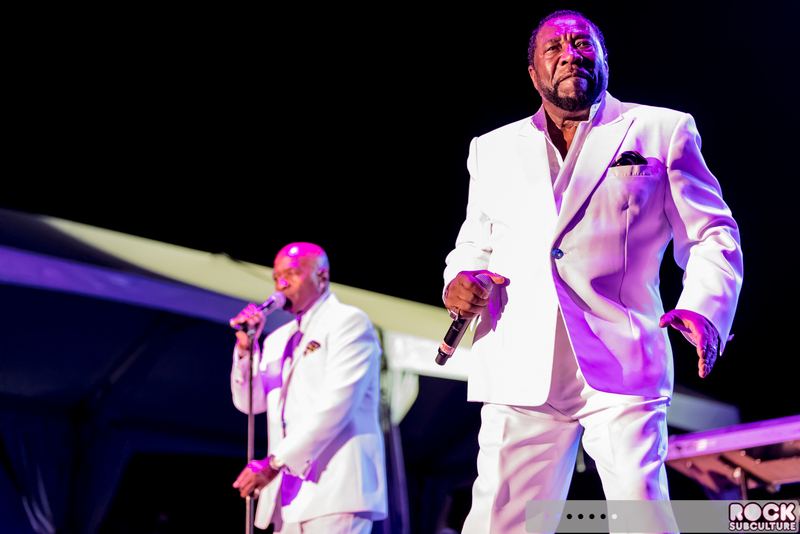 The O’Jays were formed as an R&B group in Canton, Ohio in 1958 while in high school. 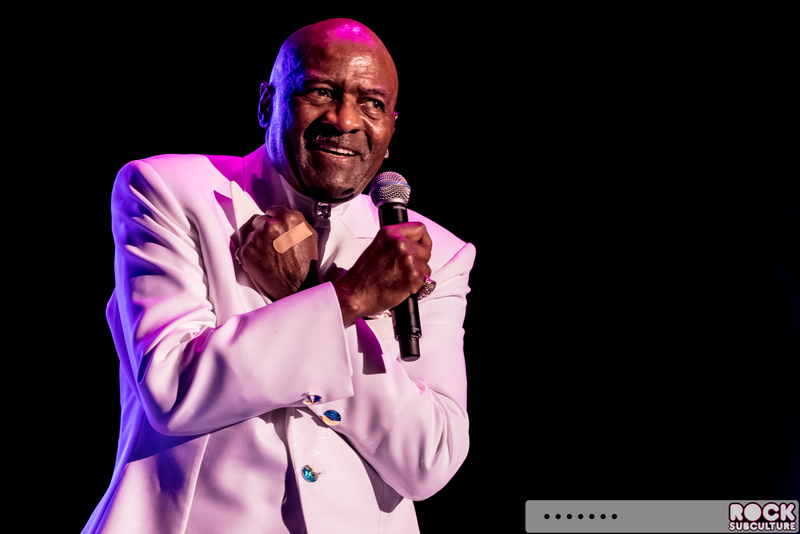 They performed at The Triumphs and The Mascots until settling on The O’Jays in 1963. 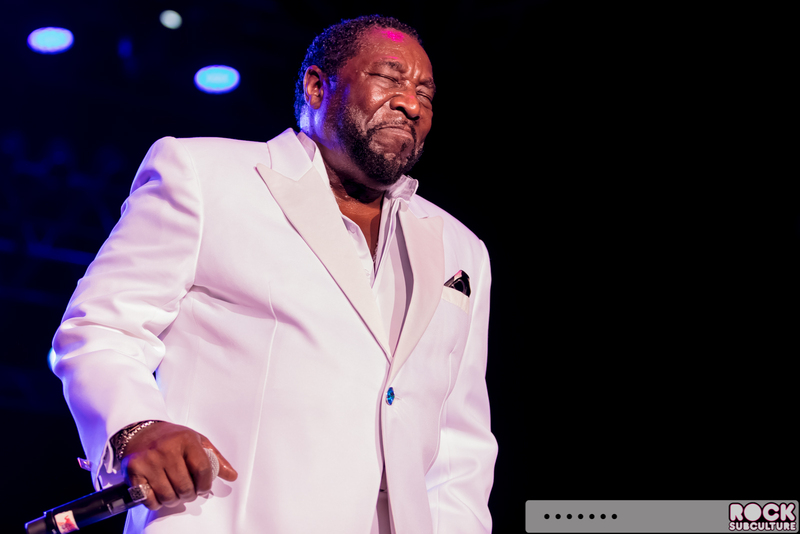 The original line-up included Eddie Levert, Walter Williams, William Powell, Bobby Massey, and Bill Isles. 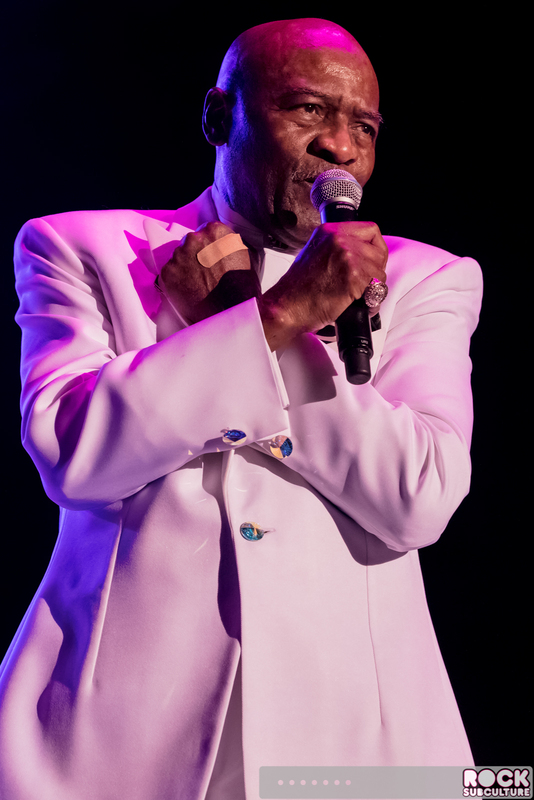 The band charted with numerous songs in the 60s. 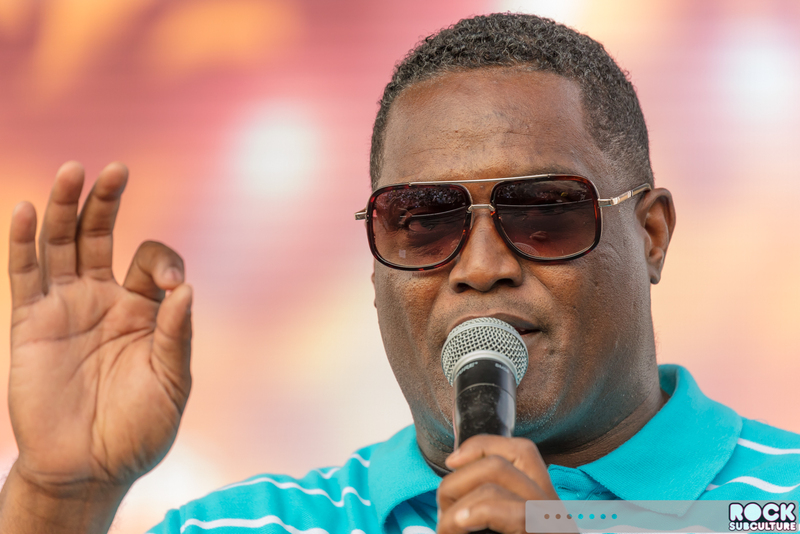 A few of the members left in the early 70s, making them a trio of Levert, Williams and Powell, after which they recorded Back Stabbers which produced a number of hit singles, including the #1 hit “Love Train”. 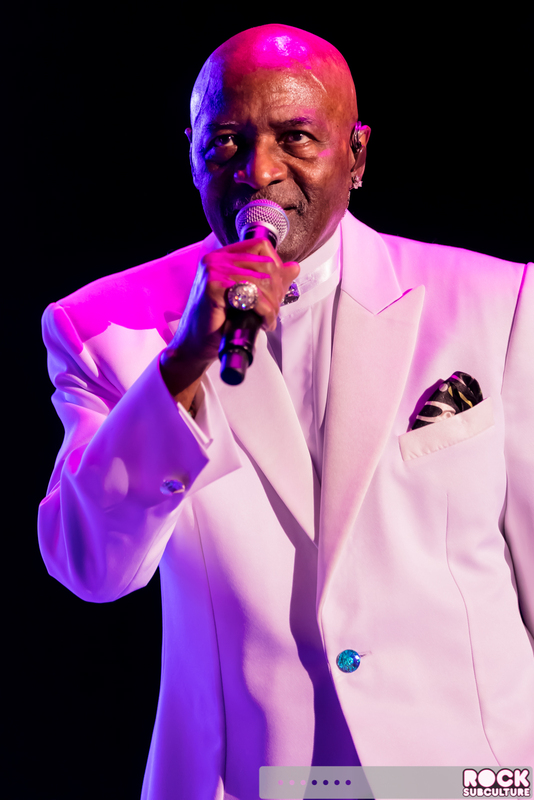 They charted with a number of other hit songs in the 70s, many in the Top Ten. 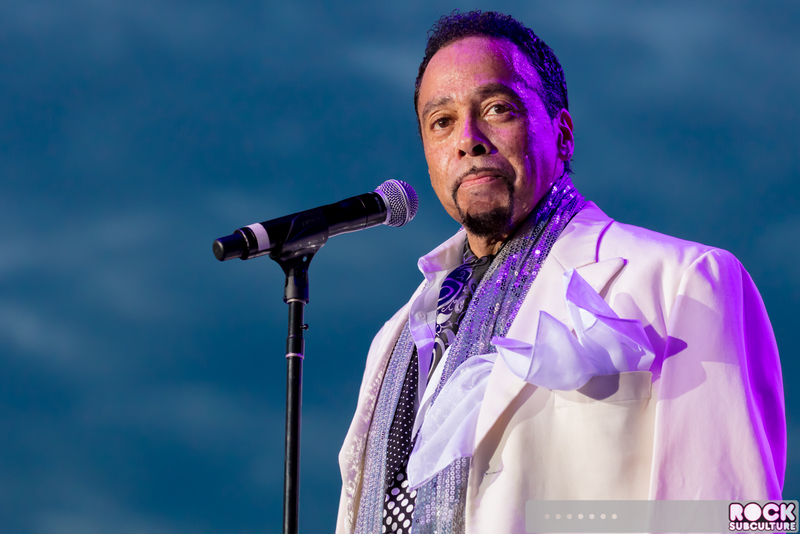 William Powell passed away as a result of cancer 1977 at only 35 years old. 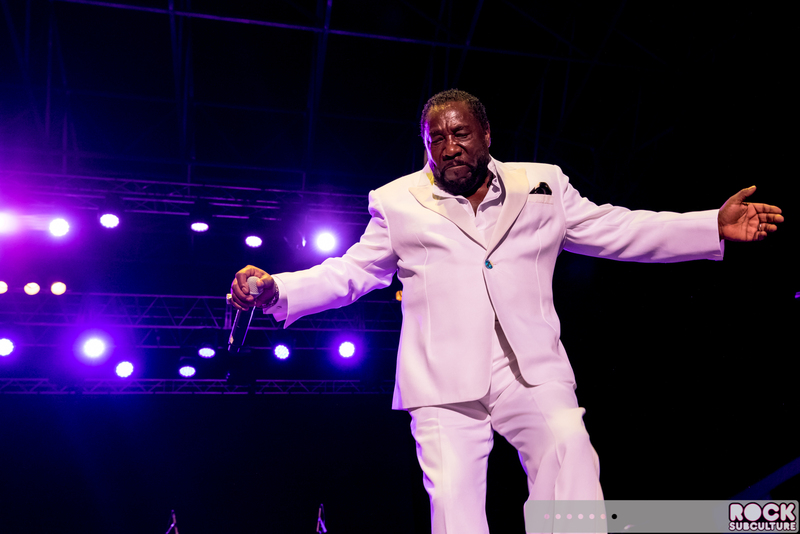 The O’Jays were inducted into the Rock and Roll Hall of Fame in 2005, received a BET Life Time Achievement Award in 2009, and were Grammy Hall of Fame Inductees for their songs “Love Train” and “For the Love of Money”. 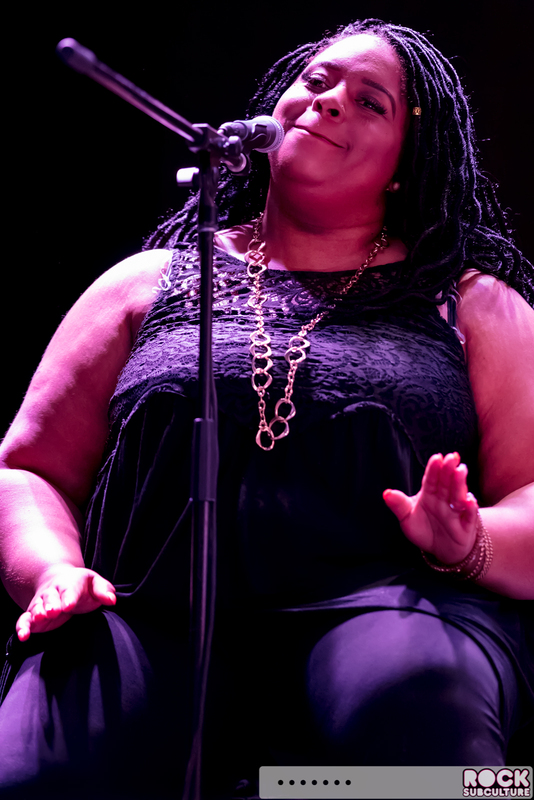 This was my first time seeing them and I was really impressed with their vocals, presentation, and the many other members of their band creating the music that created a foundation for singing. 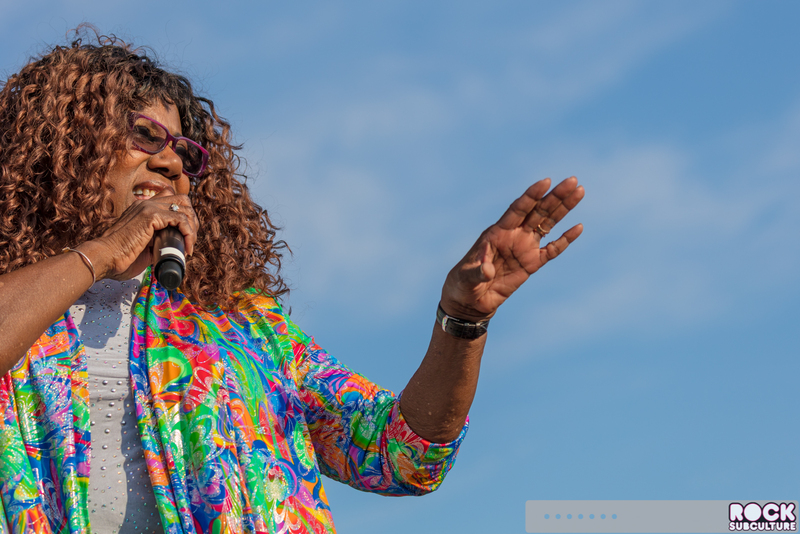 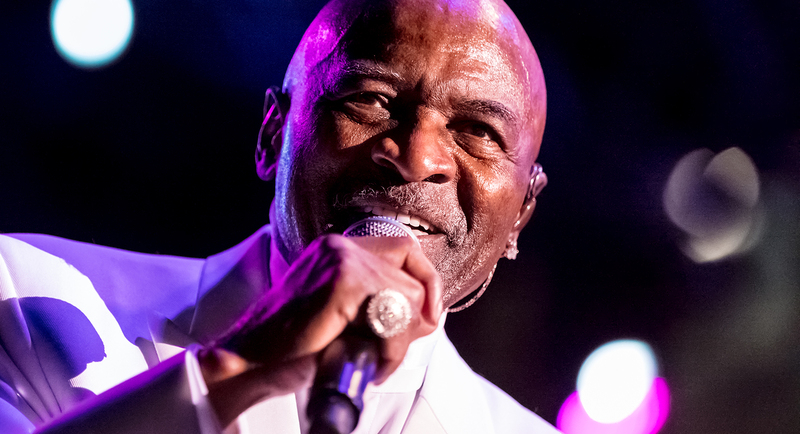 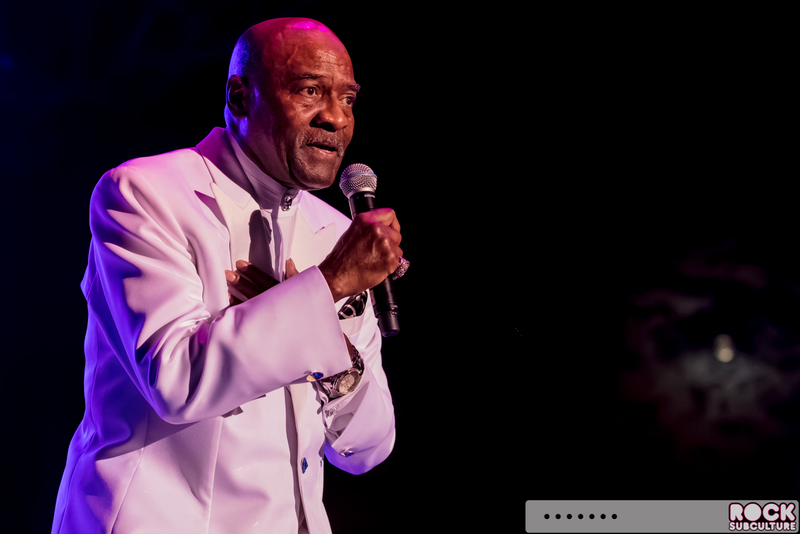 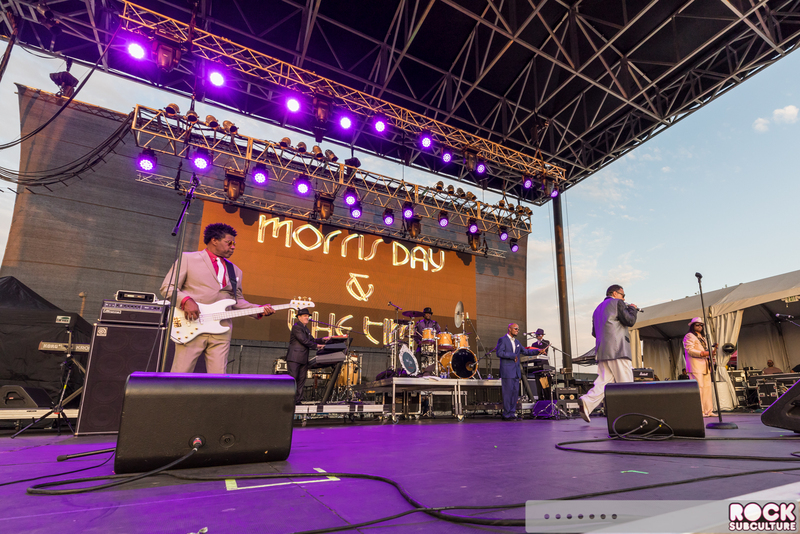 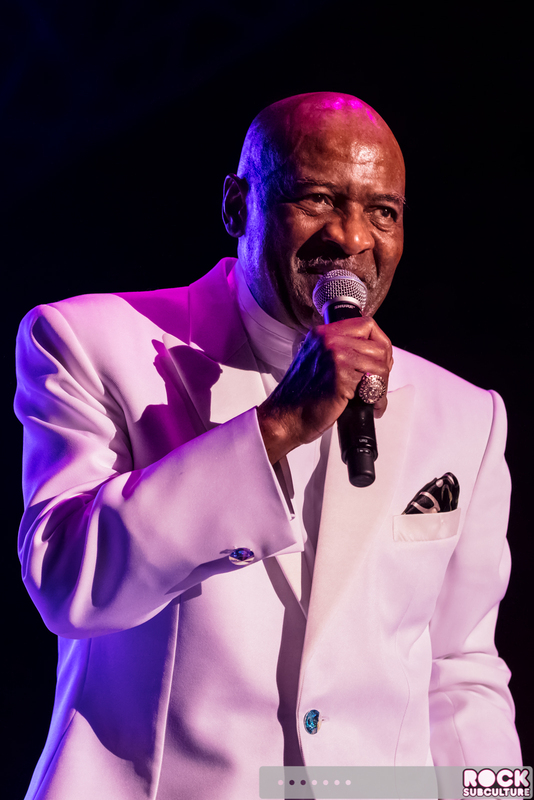 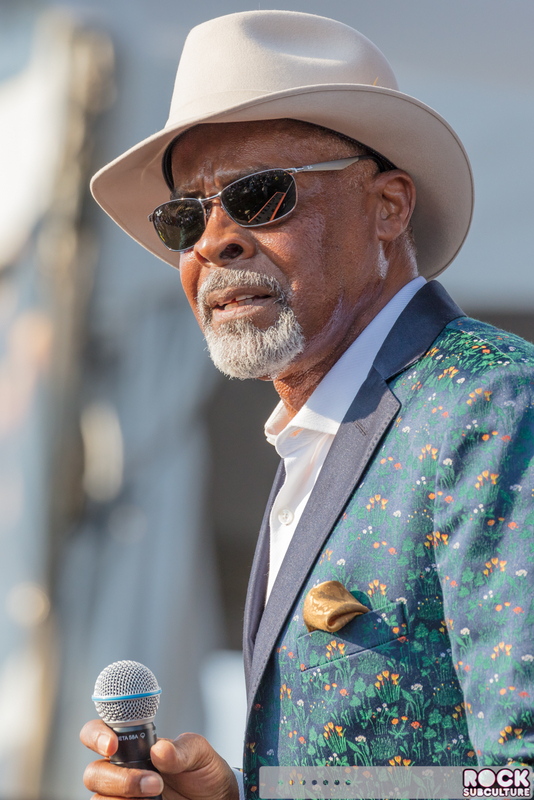 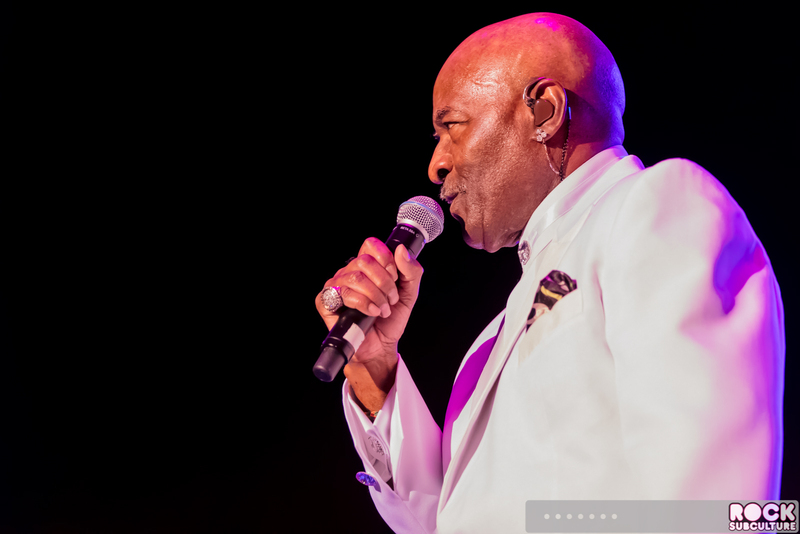 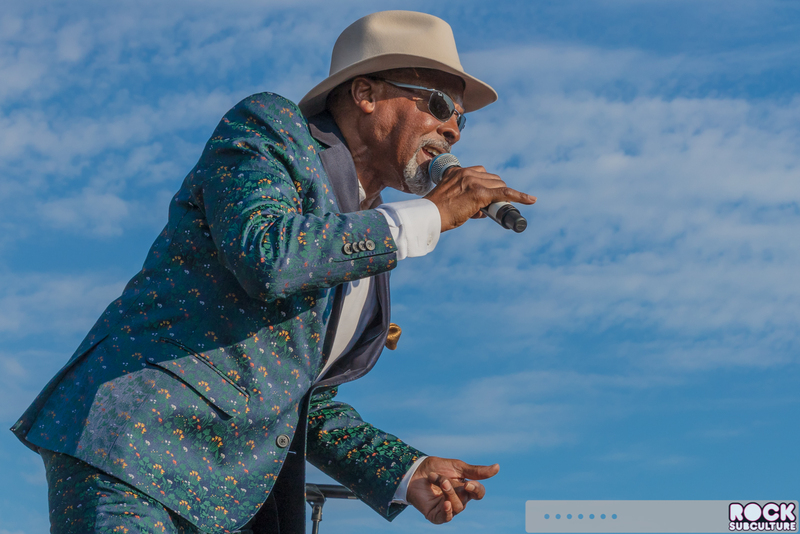 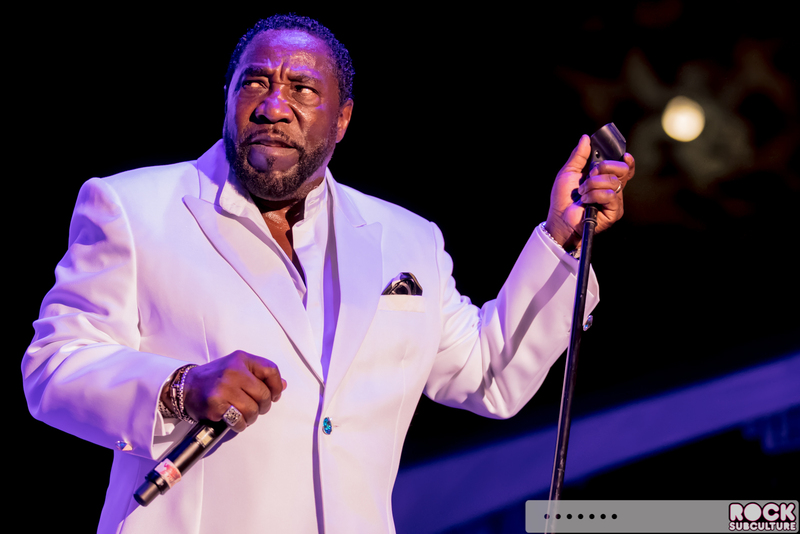 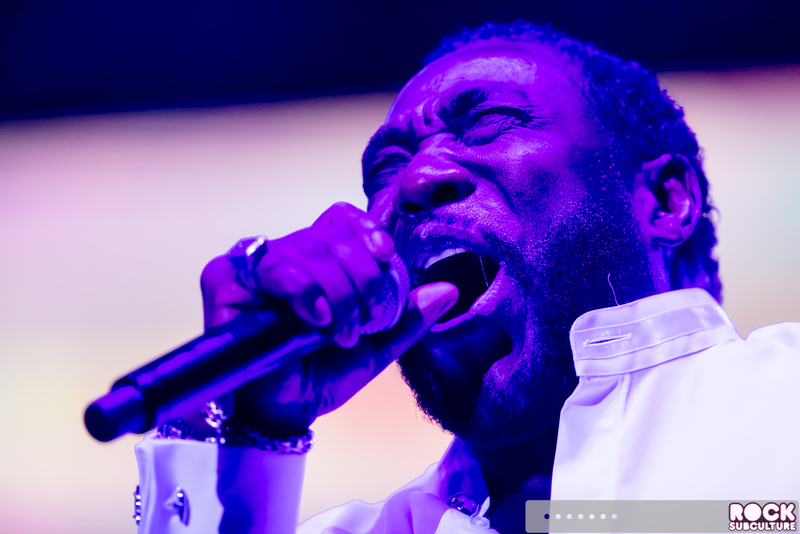 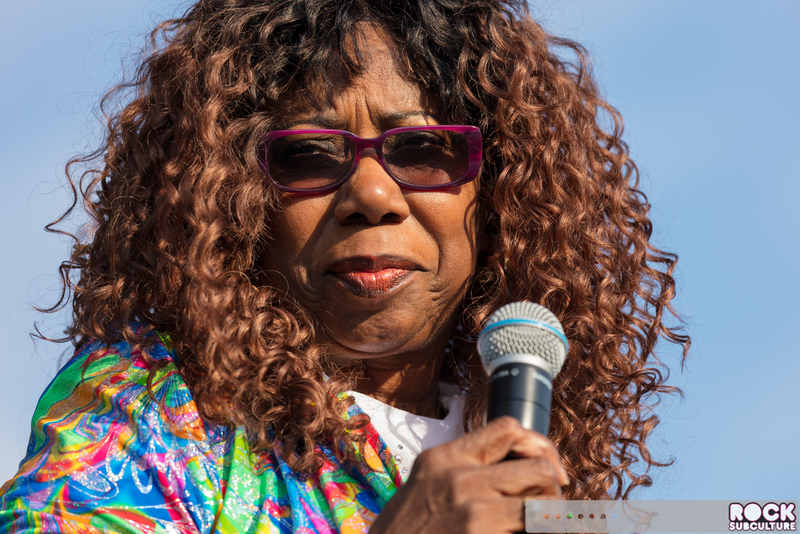 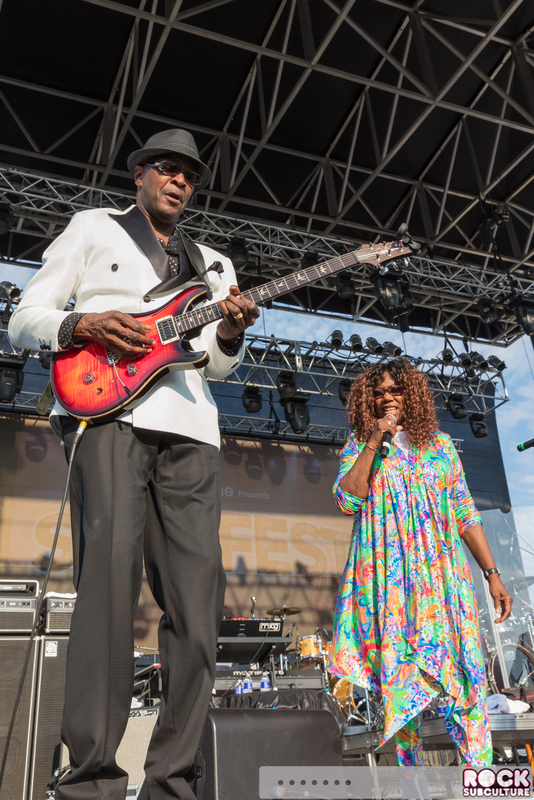 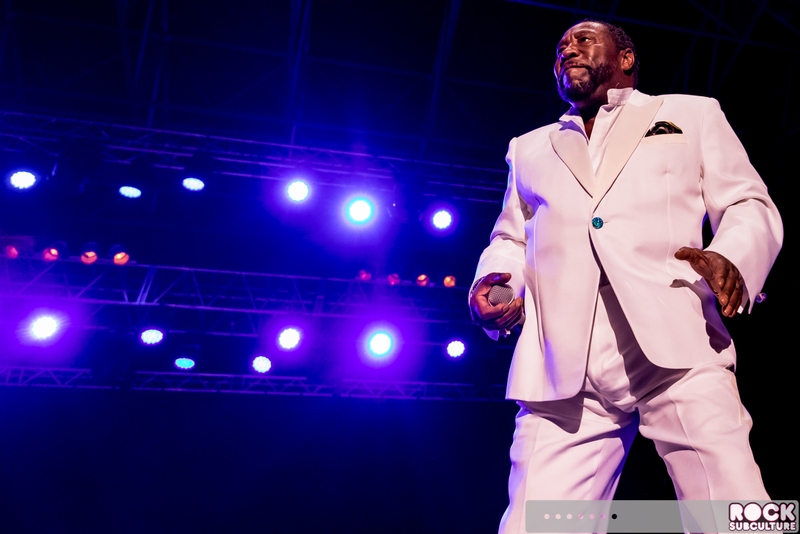 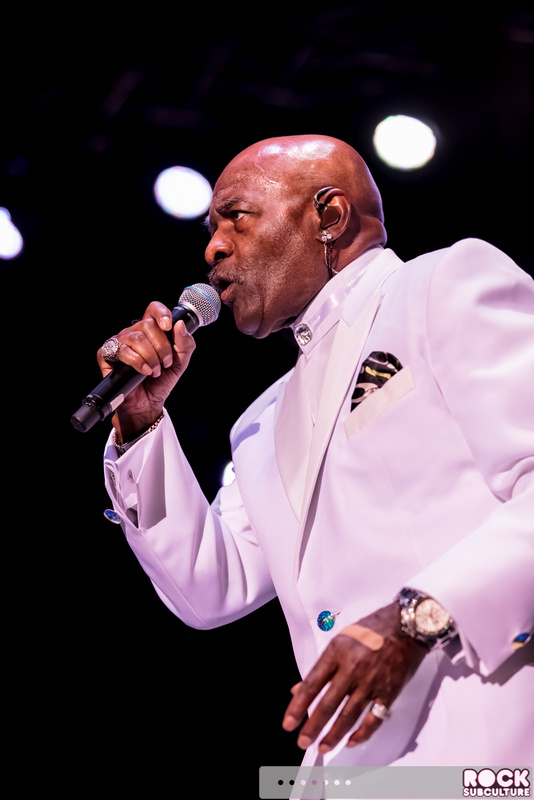 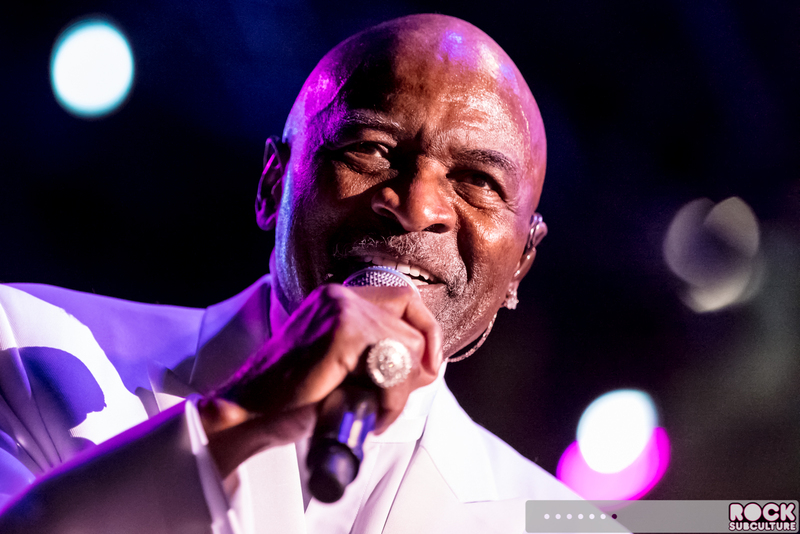 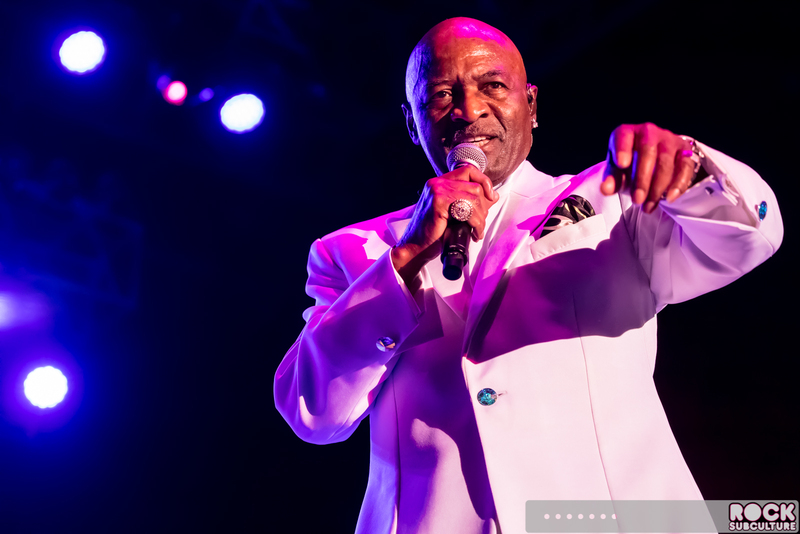 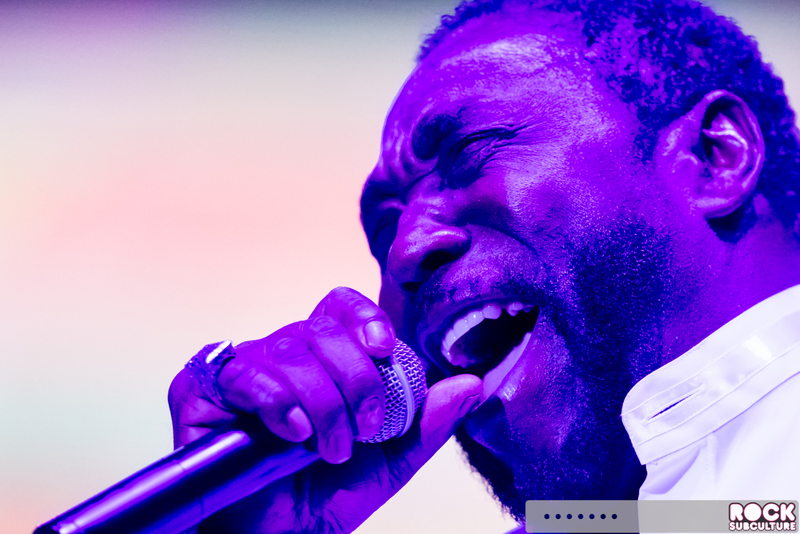 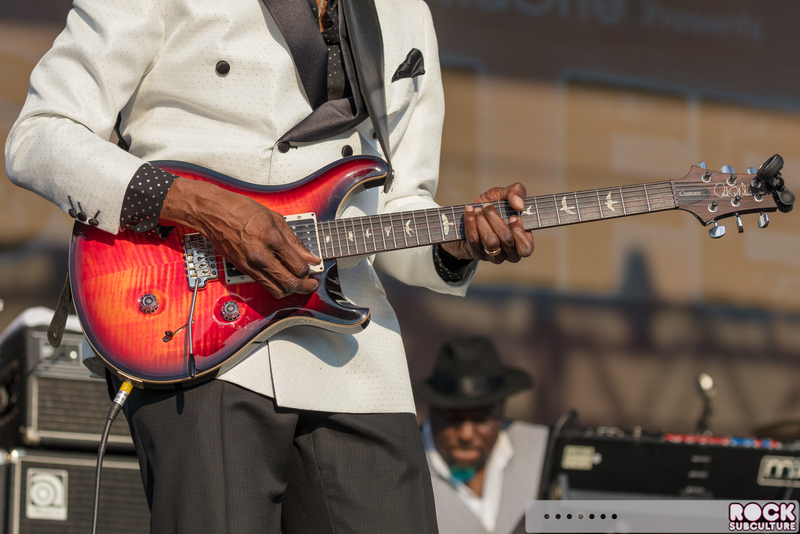 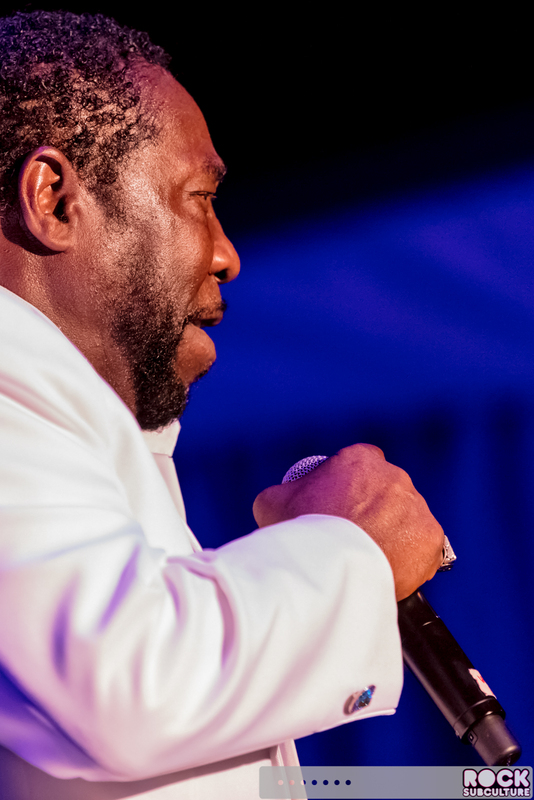 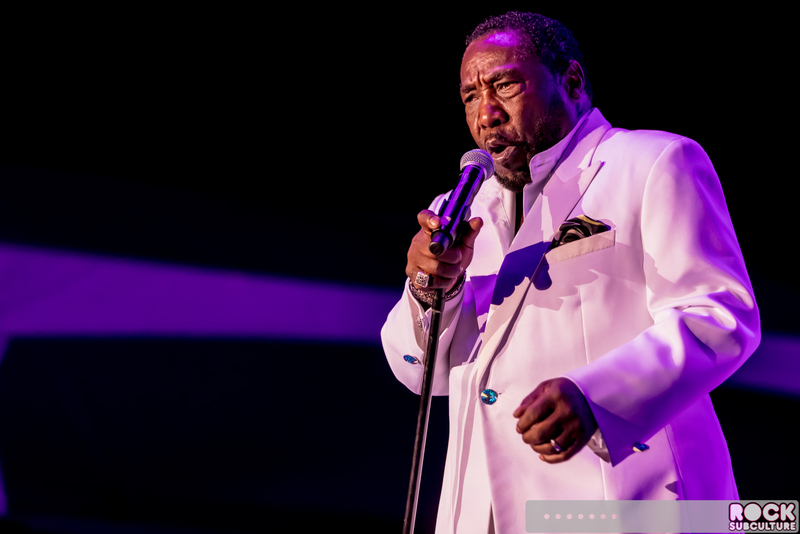 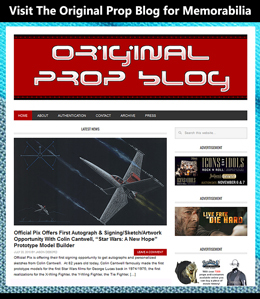 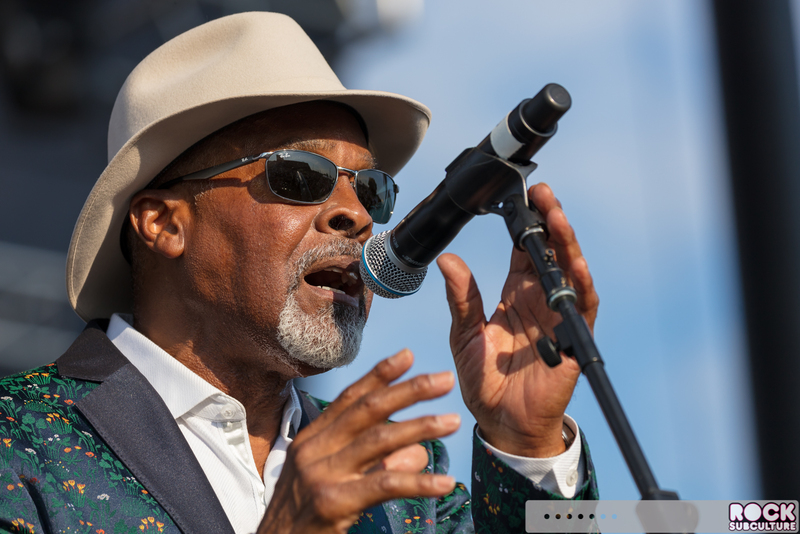 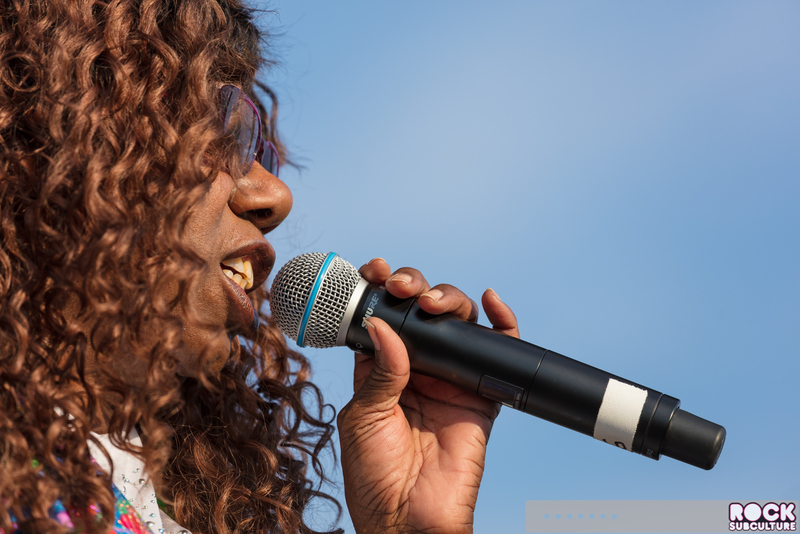 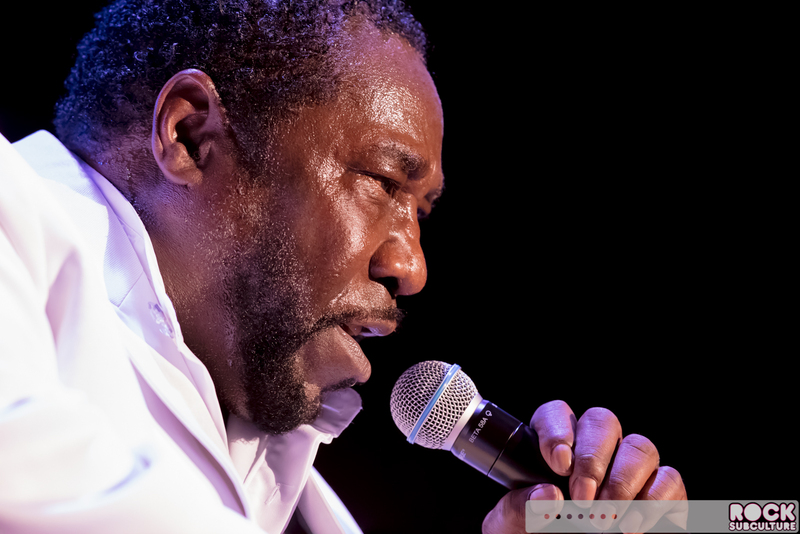 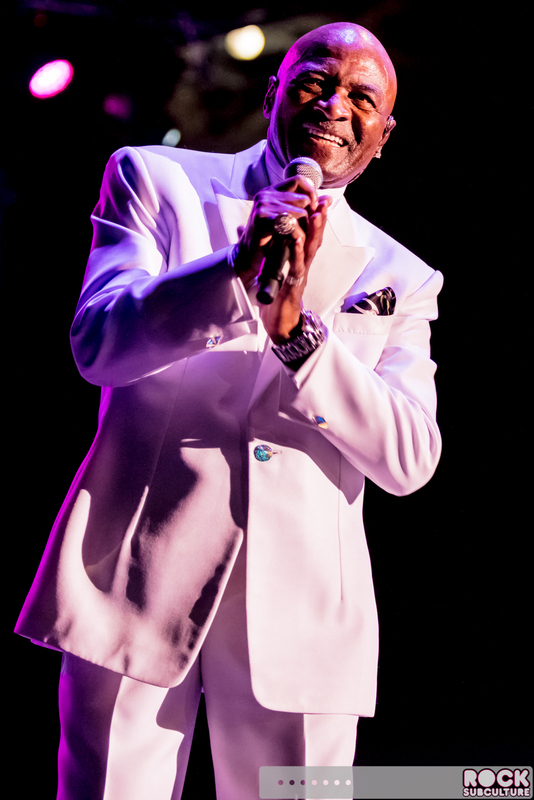 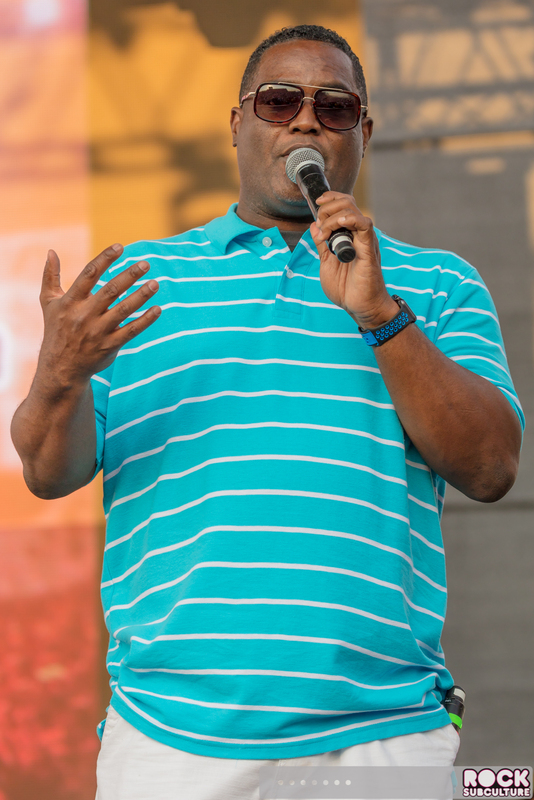 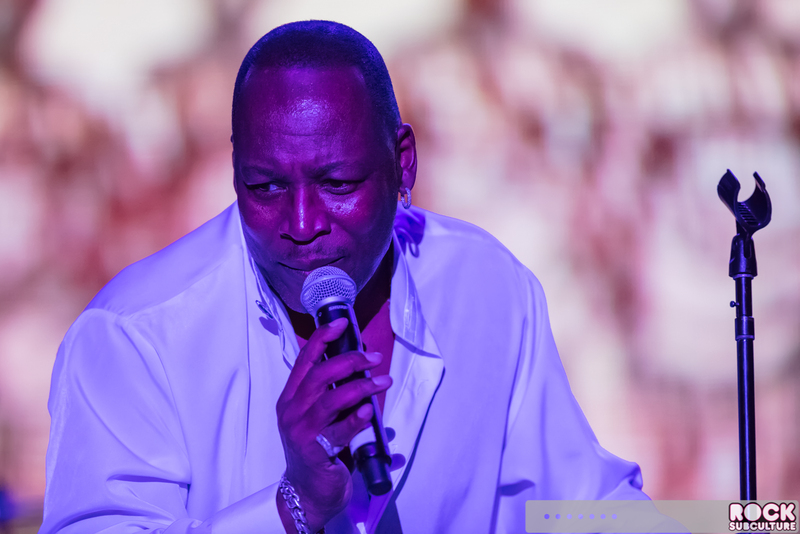 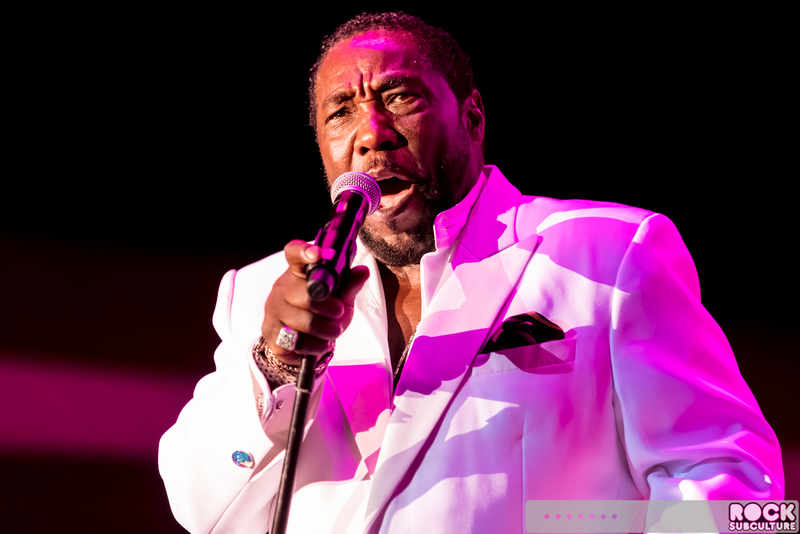 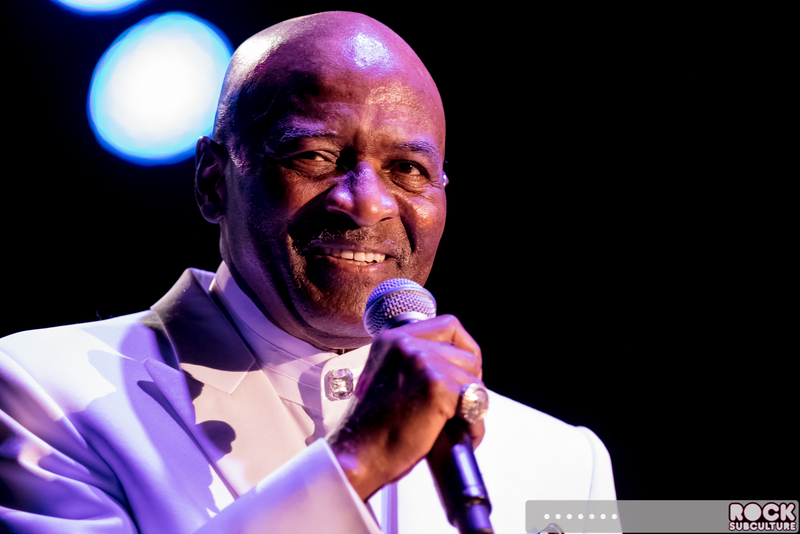 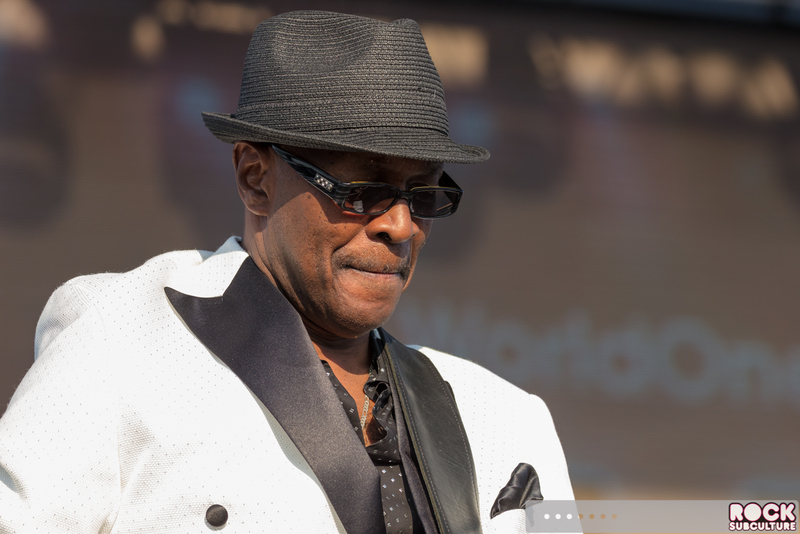 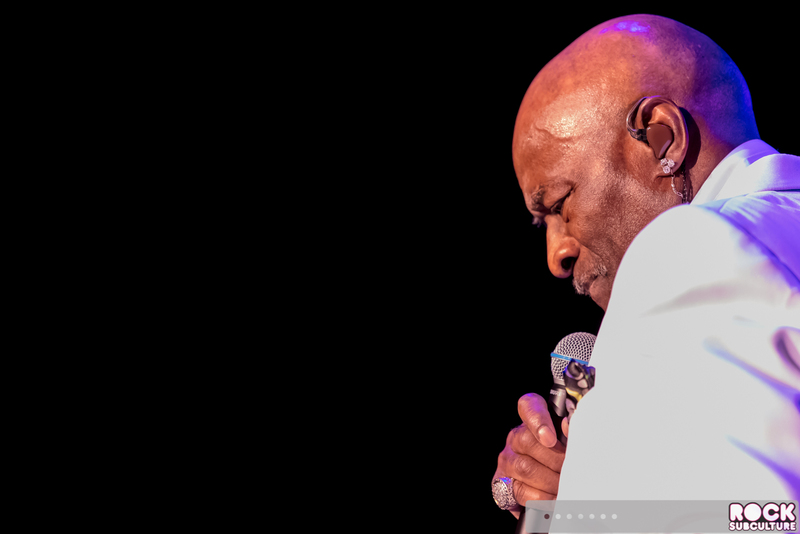 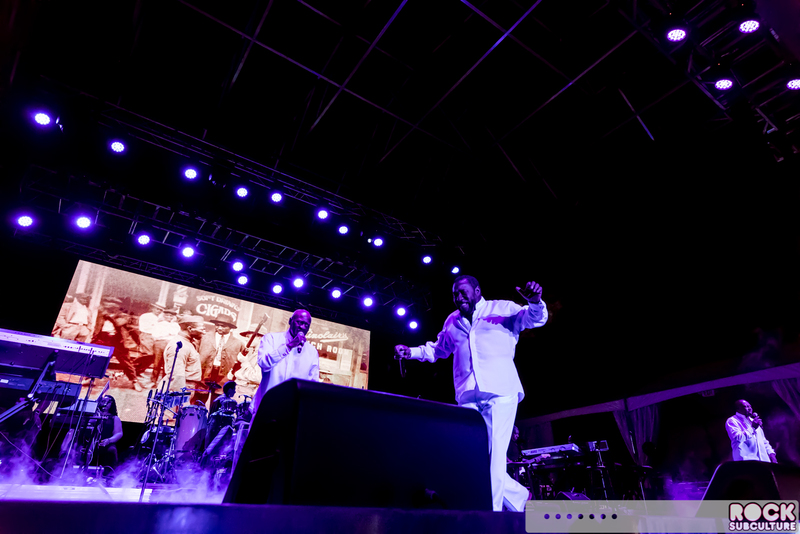 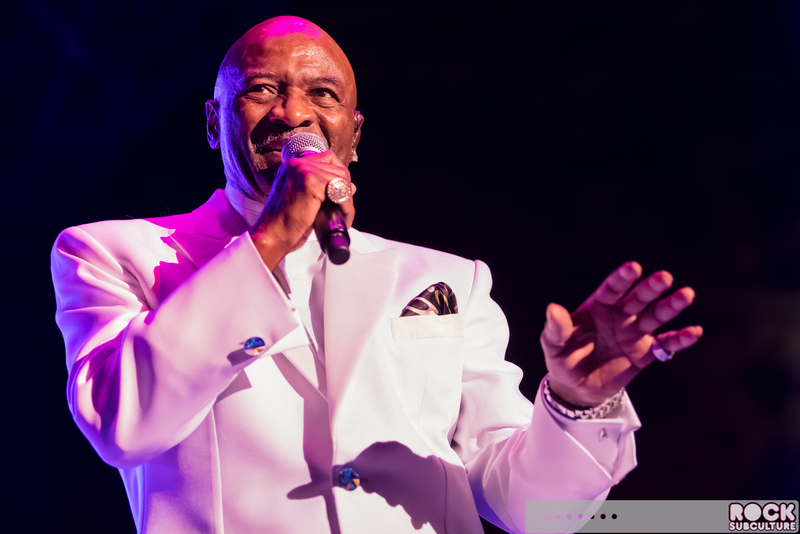 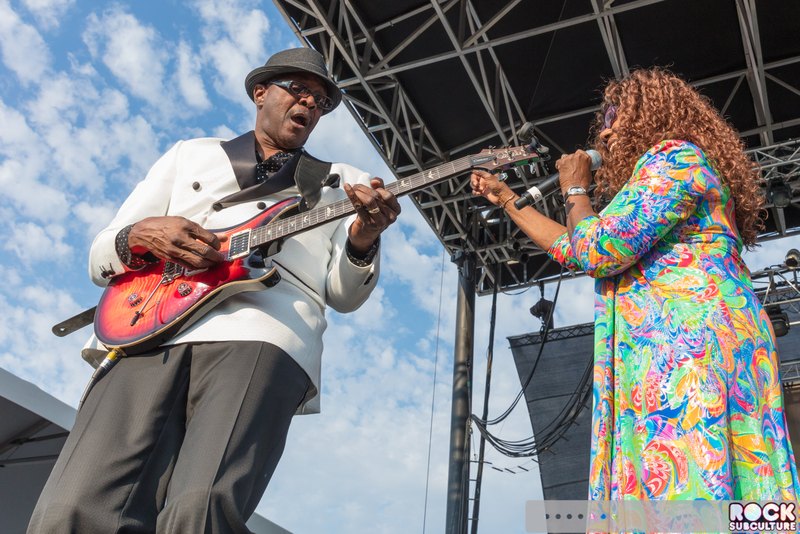 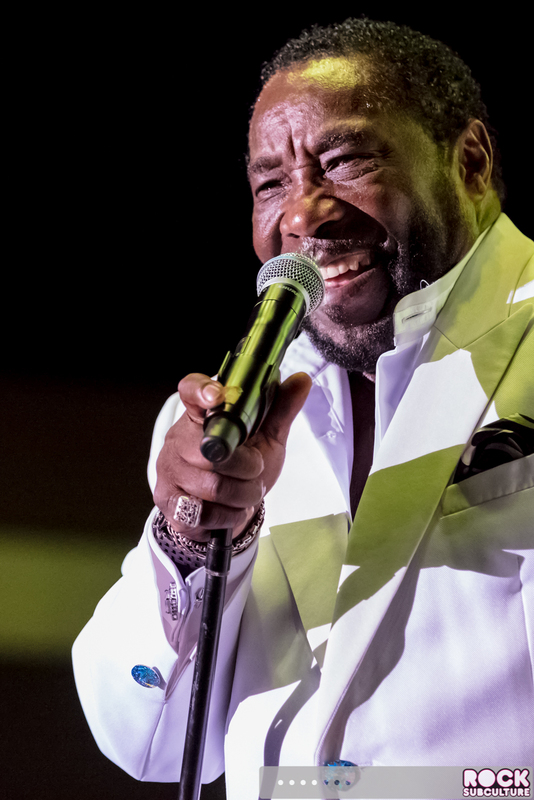 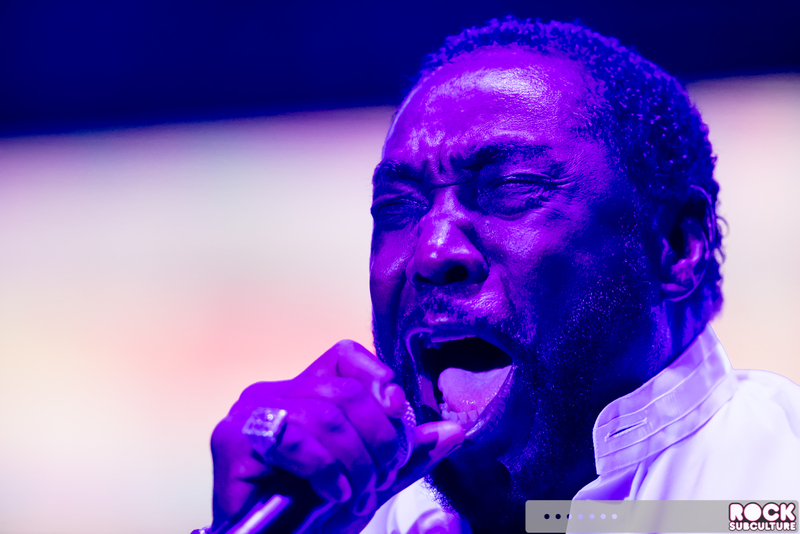 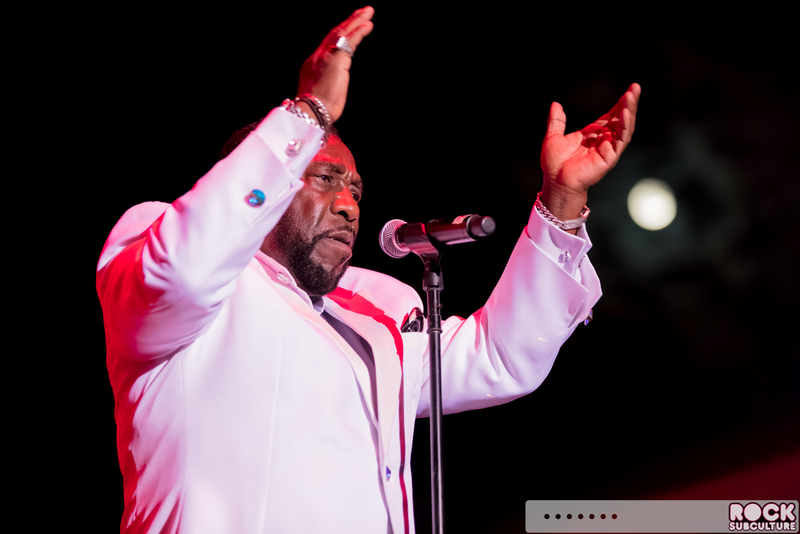 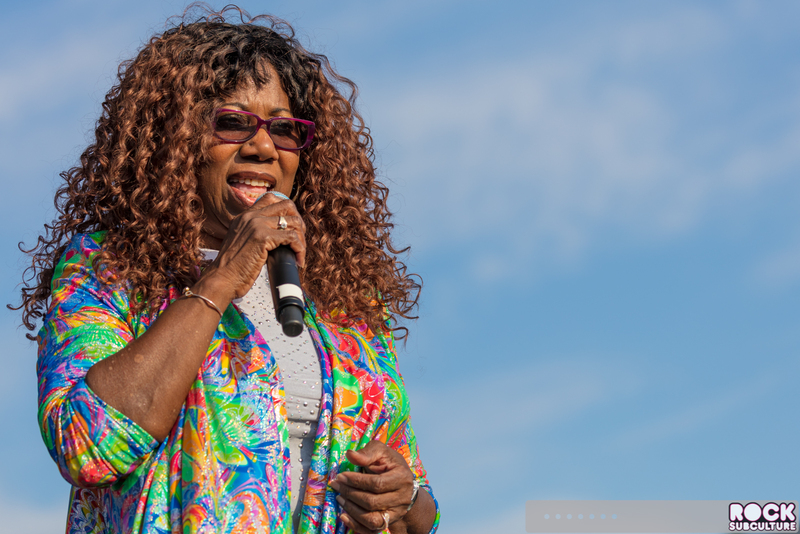 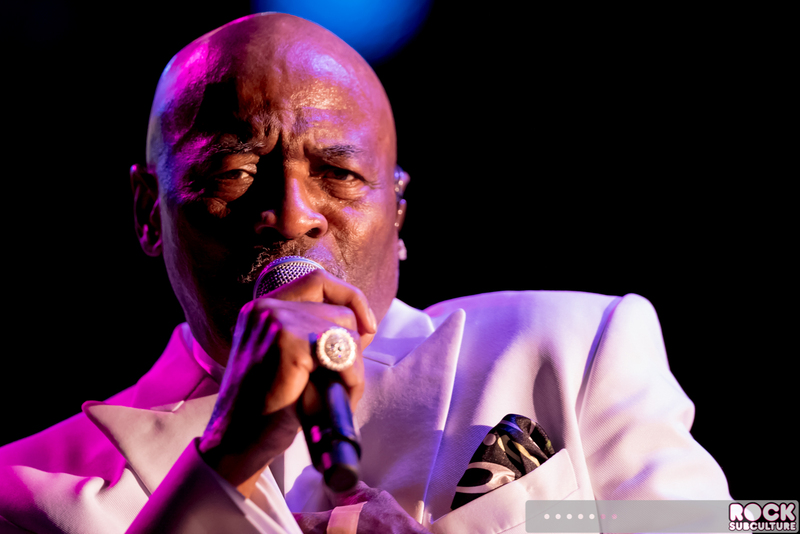 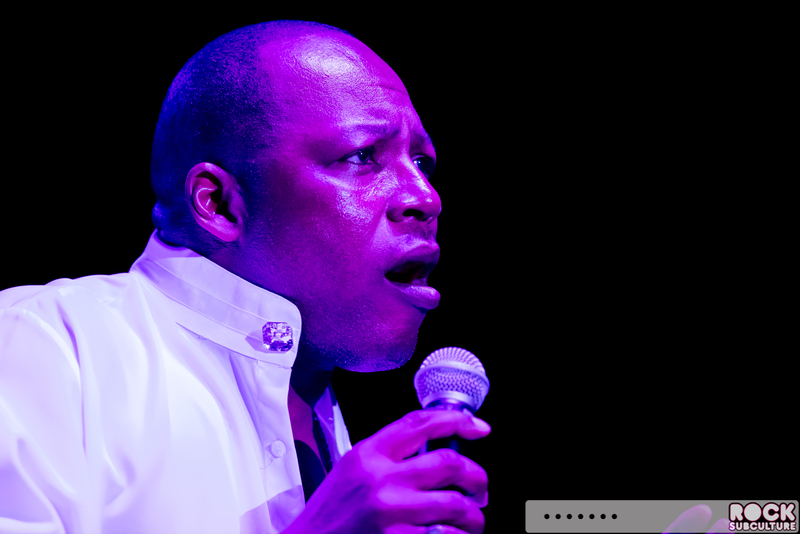 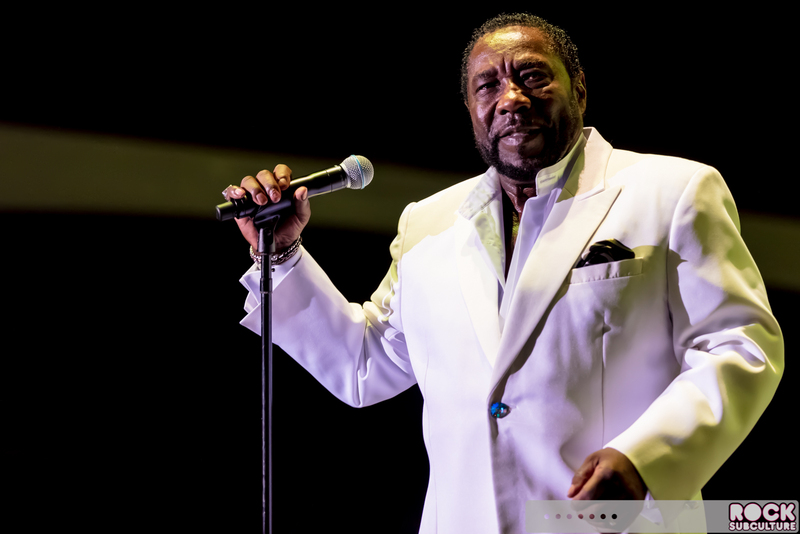 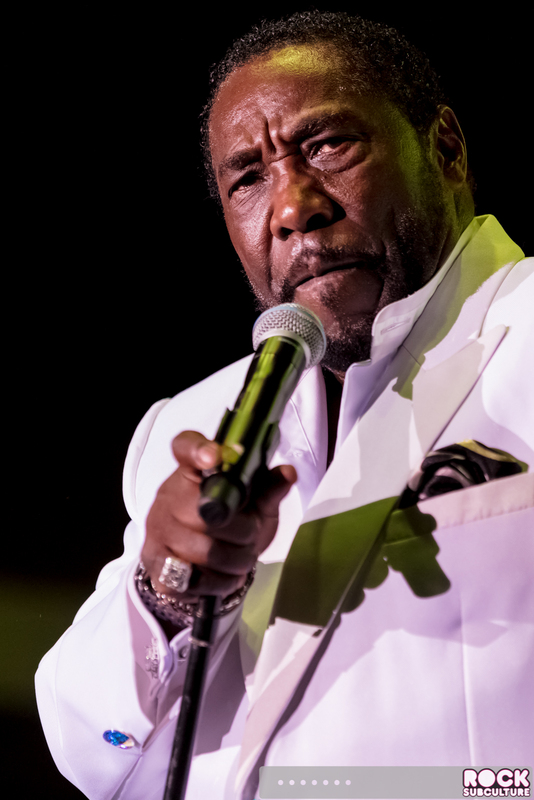 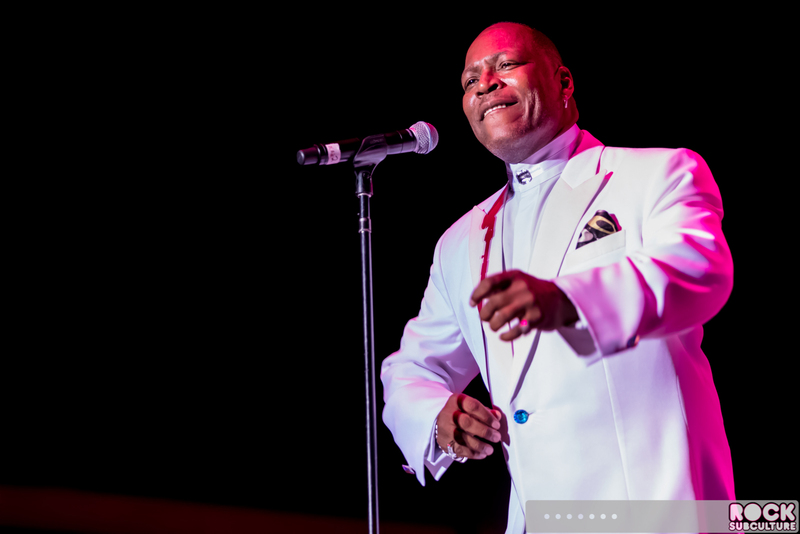 Below are some photos of The O’Jays performing on stage (scroll downward and photos will begin to appear – click any image to open a virtual lightroom with higher resolution versions of each photo). 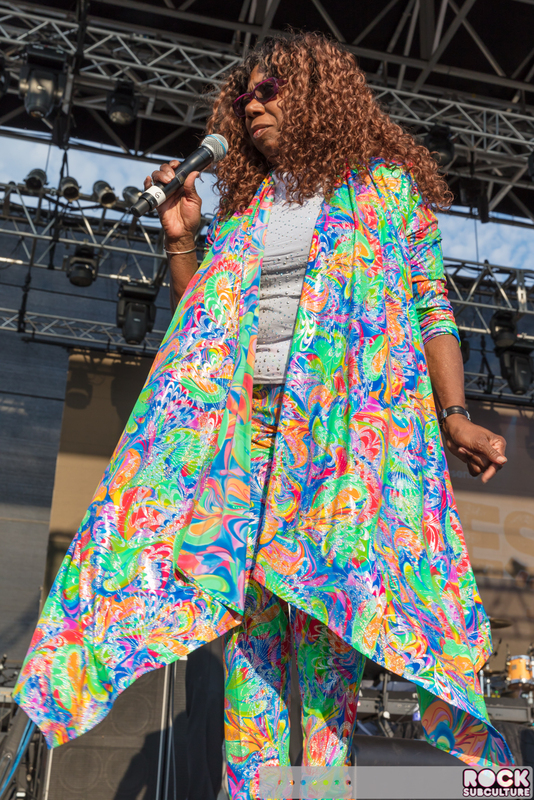 Apologies – given the height of the stage and positioning of the band, it was too not possible to get individual photos of all of the artists performing.